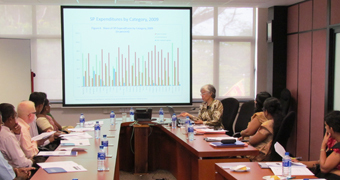 Regular in-house events are held at the Institute, conducted primarily by IPS research staff members. These events are viewed as a key means of encouraging debate and discussion of on-going research at the IPS and to obtain feedback on work carried out. 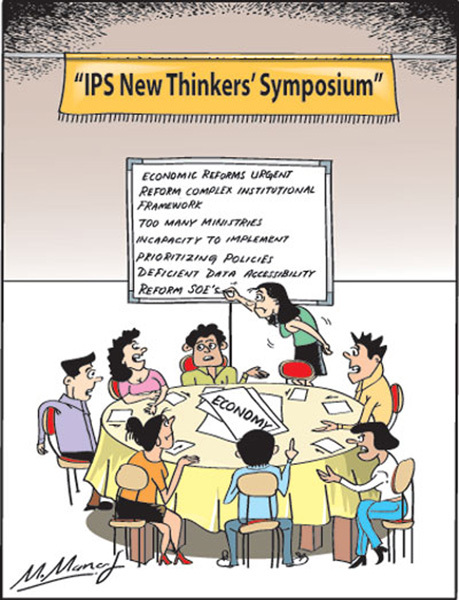 In addition, IPS also conducts events such as seminars, panel discussions and trainings to disseminate IPS research and to generate policy discussions and debates. Both foreign and local experts participate at these events which are geared towards policy makers, private sector, development partners and academics. 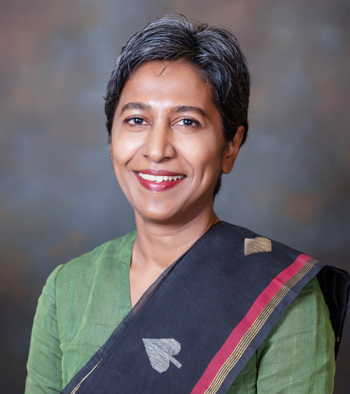 While the Asia Pacific region is well-poised for economic growth, challenges remain, especially in the macroeconomic environment, IPS Executive Director, Dushni Weerakoon noted recently. IPS Executive Director, Dushni Weerakoon, was a panelist at the ‘HSBC Power Breakfast: Global Economic and FX Outlook’ forum. 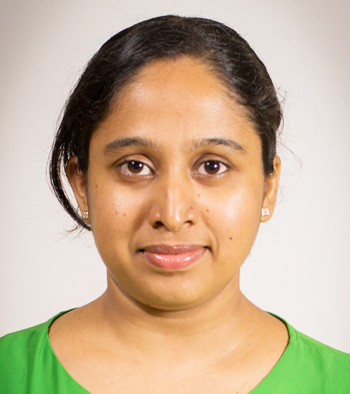 IPS is pleased to announce Kanishka Werawella, of the University of Colombo, as the winner of the annual Saman Kelegama Memorial Research Grant. 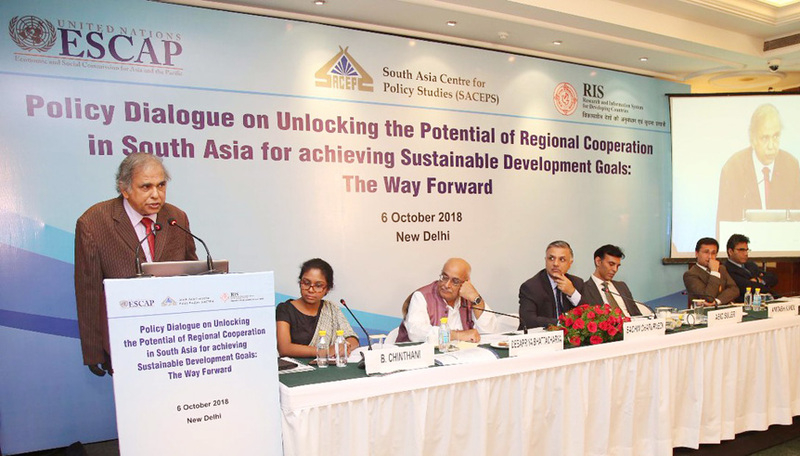 IPS Research Fellow, Ganga Tilakaratna, recently highlighted the importance of South Asian regional cooperation, in Sri Lanka’s achievement of Sustainable Development Goals (SDGs). 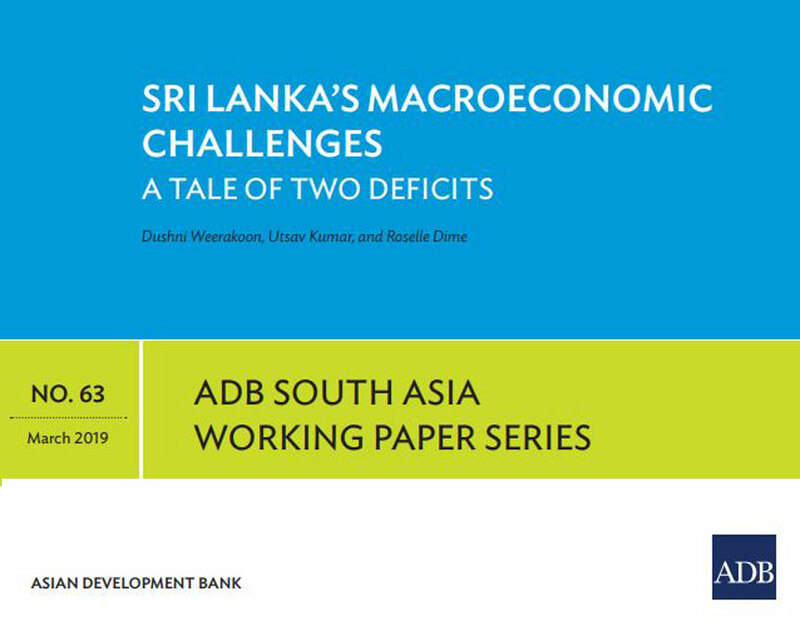 A new ADB working paper entitled “Sri Lanka’s Macroeconomic Challenges: A Tale of Two Deficits” by IPS Executive Director, Dushni Weerakoon, with Utsav Kumar, and Roselle Dime from ADB looks at Sri Lanka’s macroeconomic performance over nearly five decades. 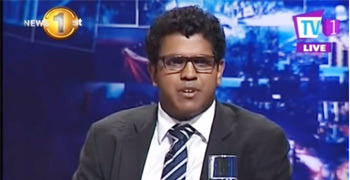 While the ultimate long-term objective should be to abolish the Grade Five Scholarship Examination, at the moment, Sri Lanka is not ready for such drastic action, an education policy researcher noted recently. 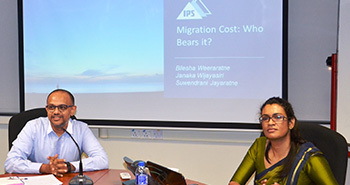 IPS Research Fellow, Bilesha Weeraratne, made a presentation on ‘Migration and Gender in Sri Lanka: Trends and Opportunities for Global Compact for Migration (GCM). 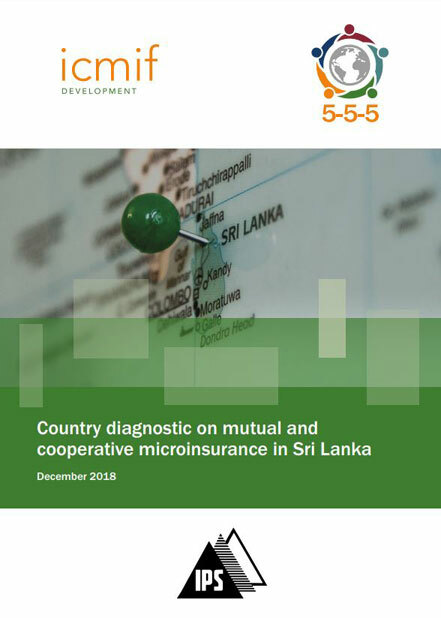 Currently, Sri Lanka is creating a digital roadmap for the country, but the lack of coordination, focus, and support among ministries and other government agencies is an issue that needs to be addressed. 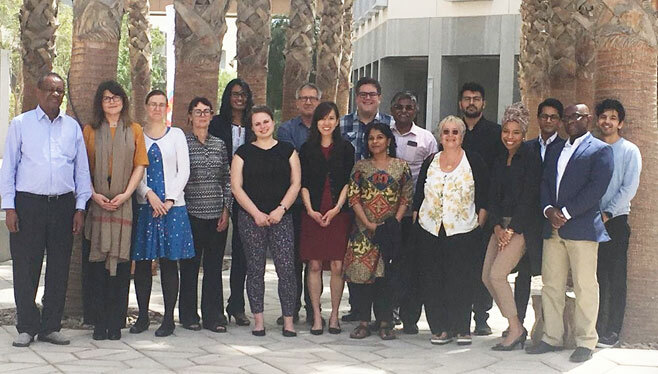 IPS Research Fellow, Bilesha Weeraratne, participated in the third annual Research and Empirical Analysis of Labor Migration (REALM) Workshop. 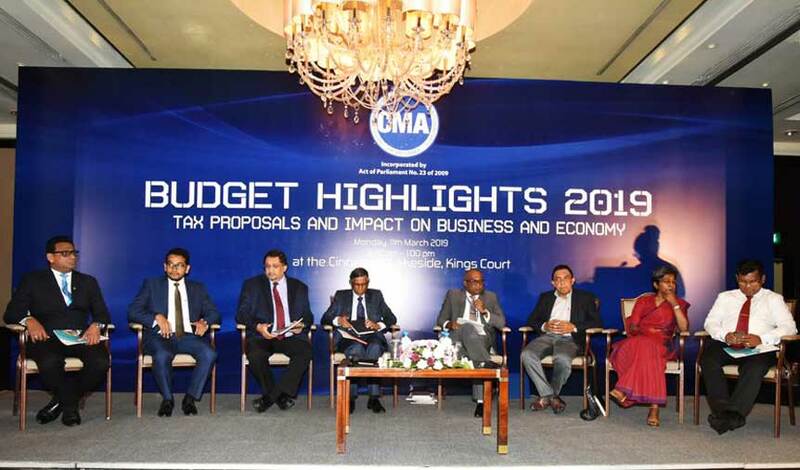 IPS Executive Director, Dushni Weerakoon, was a panelist at the session discussing the ‘Impact of Budget Proposals on Economy’ at the event, ‘Budget Highlights 2019: Tax Proposals and Impact on Business and the Economy’. 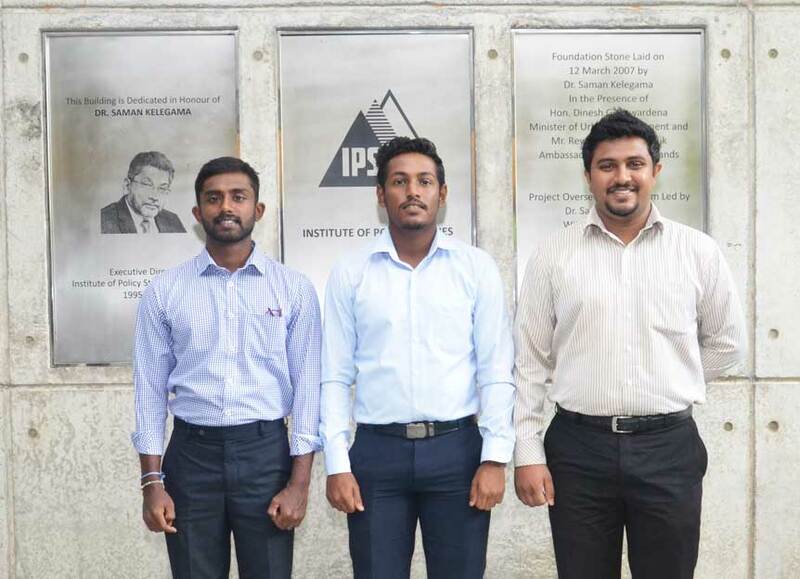 As the 2019 Budget was being presented in the Parliament of Sri Lanka on 05 March 2019, IPS researchers presented their take on the Budget proposals on Twitter. 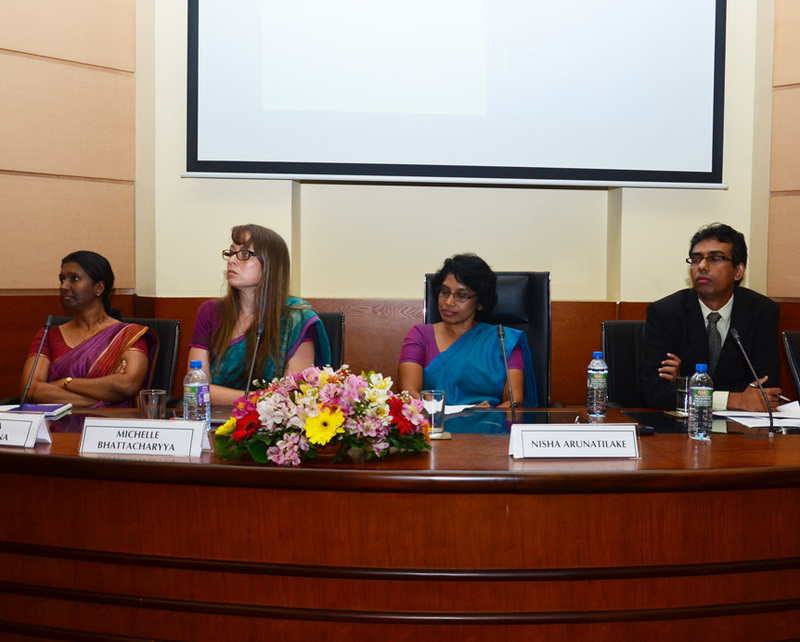 IPS was a co-host to the ‘Regional Conference on External Vulnerabilities in South Asia’, along with the World Bank, the Central Bank of Sri Lanka (CBSL) and the University of Colombo, on 28 February – 01 March 2019. 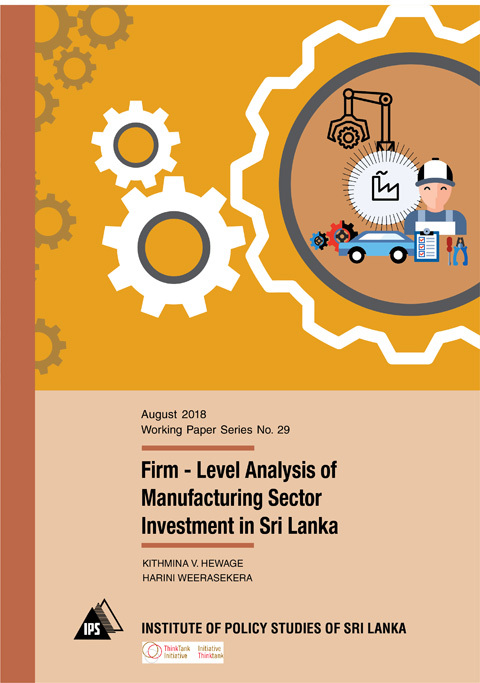 The Sri Lankan experience shows that exports have created more jobs, increased wages, and shifted employment from informal agriculture sector to manufacturing and services. Mostly women and youth have benefited from these developments. 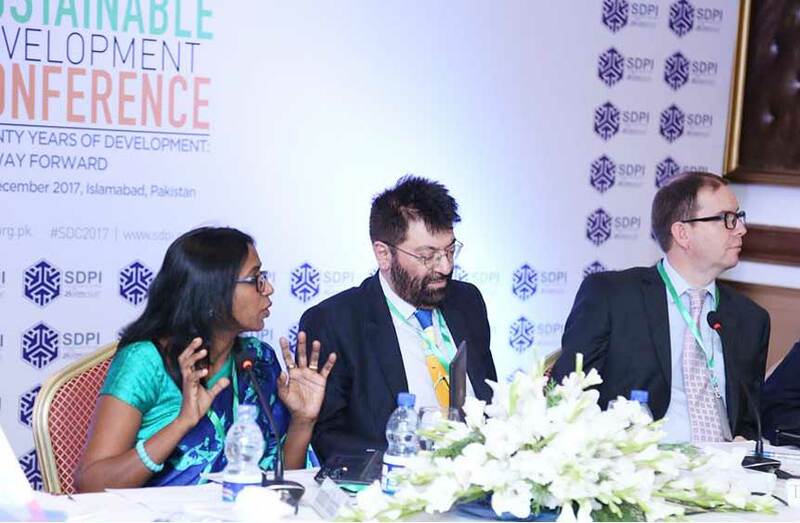 IPS Executive Director, Dushni Weerakoon, was a panelist at a policy plenary session on ‘Economic Development: The South Asian Context’ at the Fifth International Conference on South Asian Economic Development. Sri Lanka has made remarkable progress in poverty reduction over the years, both at the national and sub-national levels. Low economic impact of the agricultural sector, high staple food consumption and low dietary diversity, climate change risks, and increasingly unhealthy dietary patterns are the main causes of malnutrition, a nutritional expert pointed out recently. IPS Research Fellow, Ganga Tilakaratna, recently argued that high levels of income inequality, continuing low female labor force participation, substantial informal sector employment, and rapid ageing of population remain key challenges for achieving social inclusion in Sri Lanka. 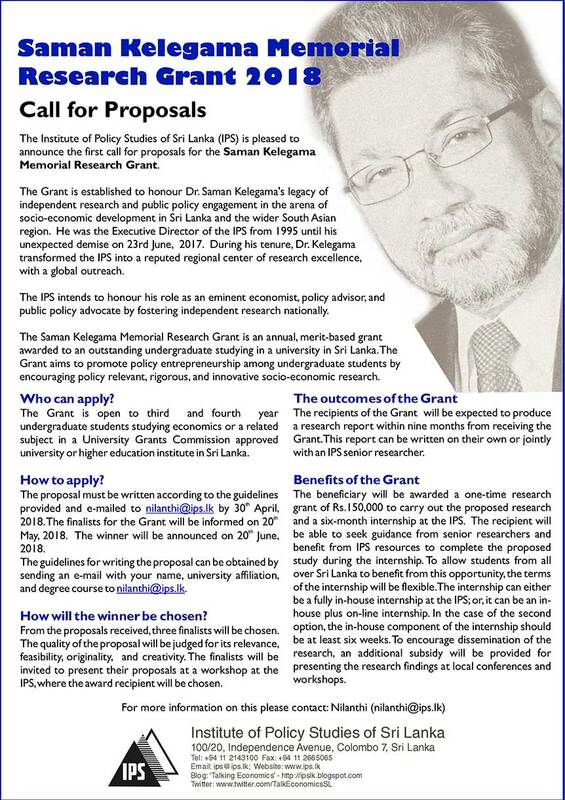 IPS is calling for proposals for the annual Saman Kelegama Memorial Research Grant, established to honour Dr. Saman Kelegama’s legacy. 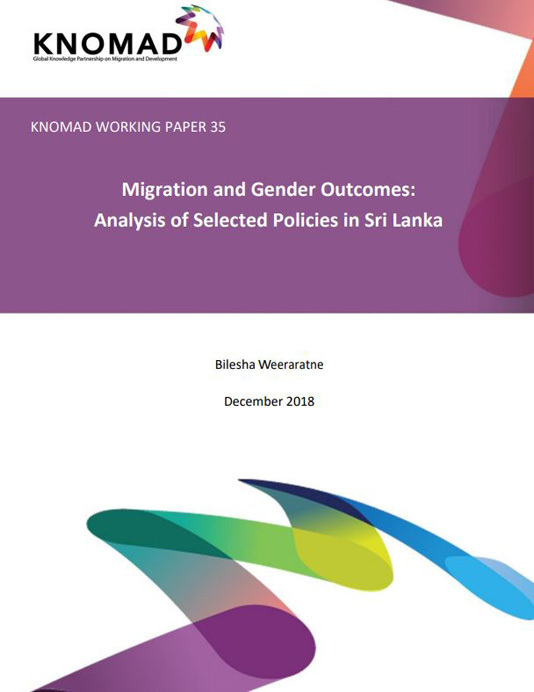 IPS Research Fellow, Bilesha Weeraratne, recently published a Working Paper titled Migration and Gender Outcomes: Analysis of Selected Policies in Sri Lanka in the KNOMAD Working Paper Series. 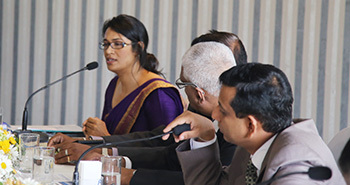 IPS Executive Director, Dushni Weerakoon, argued that the biggest risk to the Sri Lankan economy in 2019 is the currency. 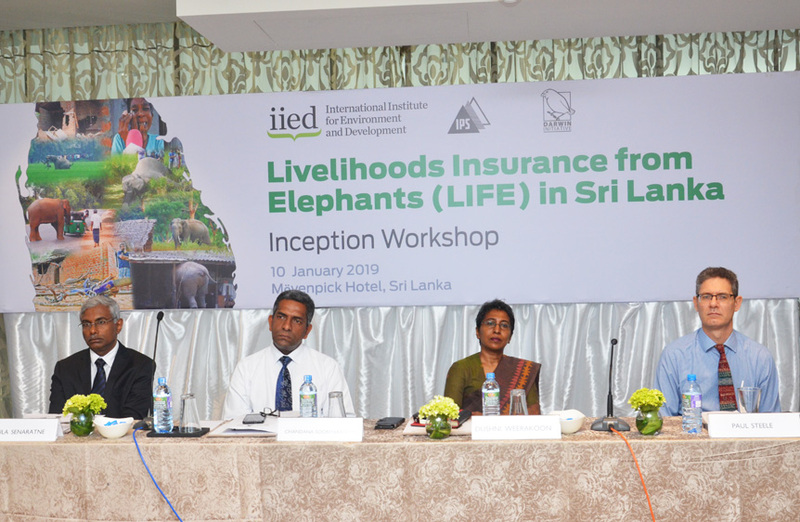 A recent workshop pointed to the possibility of using private insurance to mitigate the human-elephant conflict that is a persistent problem in the rural areas of Sri Lanka. 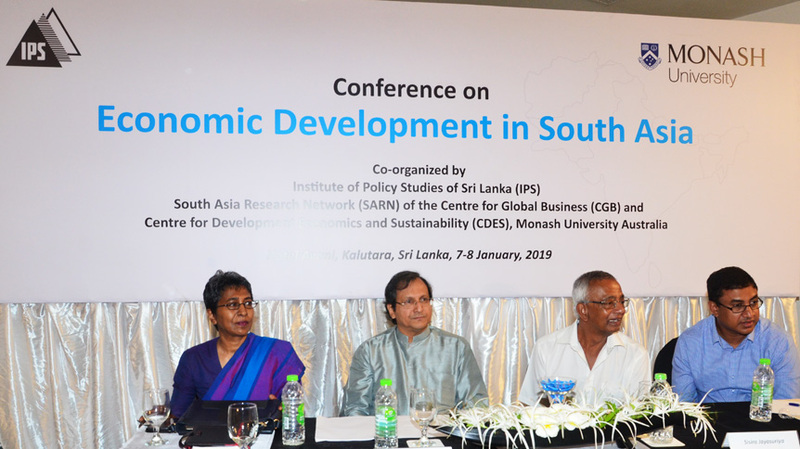 The Conference on ‘Economic Development in South Asia’ examined the development impact of innovative policy initiatives for spurring development in the region using latest research methods. 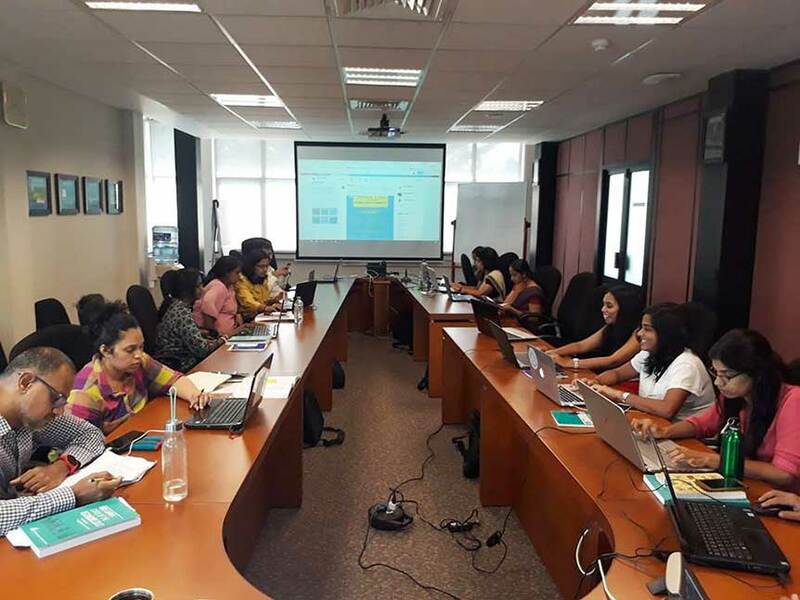 Can Khan Academy E-learning Video Tutorials Improve Mathematics Achievement in Sri Lanka? 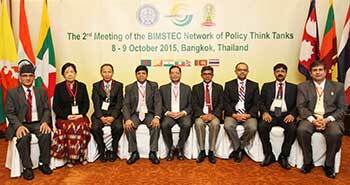 IPS Research Fellow, Janaka Wijayasiri, attended the fourth meeting of the BIMSTEC Network of Policy Think Tanks. 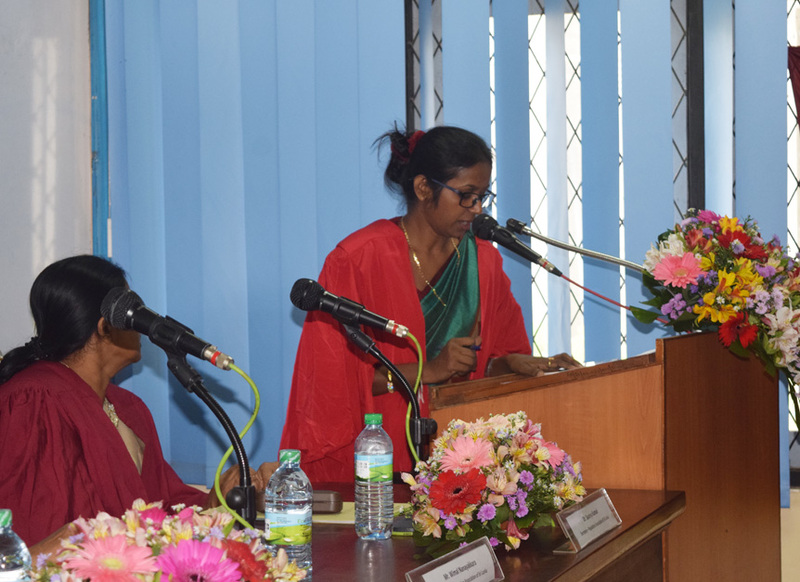 IPS Research Fellow, Ganga Tilakaratna, presenting a paper titled ‘Labor Force Participation of Elderly in Sri Lanka: Patterns and Determinants’, highlighted that the challenge faced by Sri Lanka’s ageing population is compounded by two major labour market challenges. 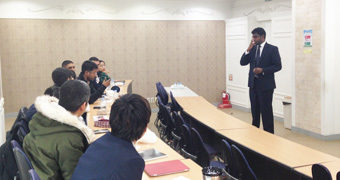 Disaster education can play an imperative role in promoting disaster resilience, pointed out IPS Research Economist, Kanchana Wickramasinghe, recently. 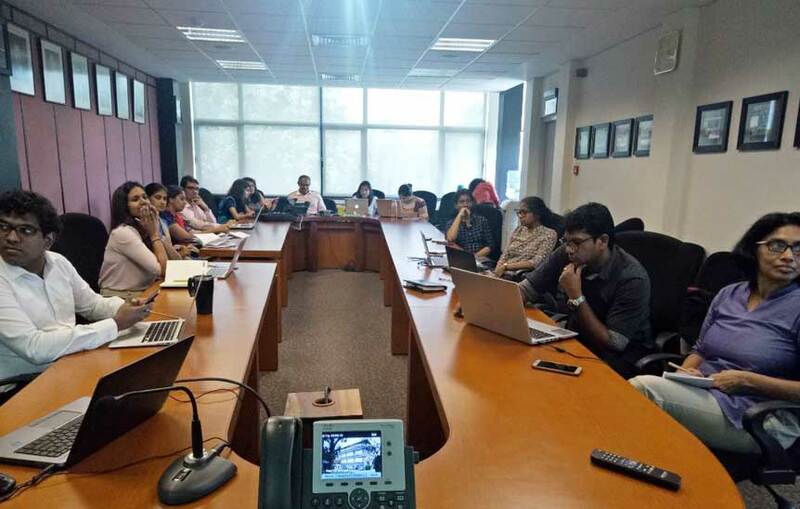 The #IPSSOE Twitter Chat, hosted by IPS (@TalkEconomicsSL) to unpack the findings of the Institute’s flagship report, ‘Sri Lanka: State of the Economy 2018’, was held on 12 December 2017. 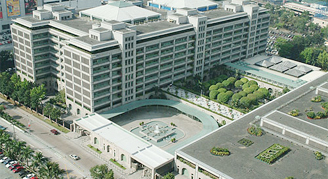 Since 2006, IPS has engaged in several value chain research projects in different sectors (both goods and services) with diverse research focuses. A study authored by IPS has found that, although the demand for insurance remains low among low-income communities, there is potential for mutual microinsurance given the prevalence of community-based networks at the grass-root level. Eleventh South Asia Economic Summit was held under the theme of ‘Corridors of Knowledge for Peace and Development’, in Islamabad, Pakistan, from 04 – 07 December 2018. 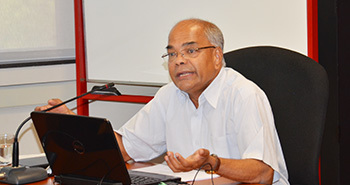 While highlighting the reasons for the growing focus on food security and value chain research at IPS, Research Fellow, Manoj Thibbotuwawa, noted that poor, backward and forward linkages in Sri Lanka’s agriculture has become a cause of concern. While more than 80% of Sri Lanka’s food is produced locally, Sri Lanka continues to struggle with food security issues, IPS research has shown. IPS Research Fellow and Head of Agricultural Economic Policy Research, Manoj Thibbotuwawa, highlighted the importance of focusing on market system approach in making agricultural policies to achieve win-win solutions for all the stakeholders in the value chain. 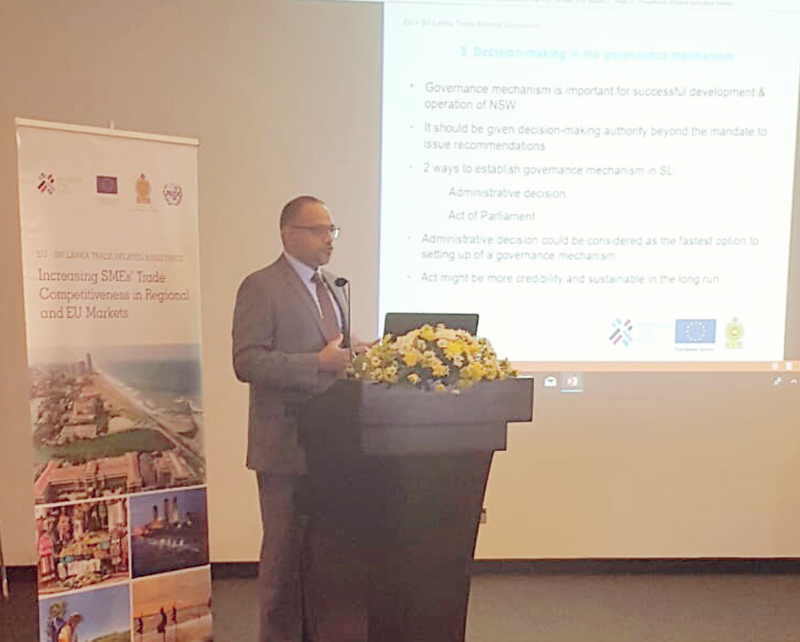 IPS Research Fellow, Ganga Tilakaratna, recently discussed Sri Lanka’s initiatives to facilitate and accelerate the implementation of Sustainable Development Goals (SDGs) and highlighted the key implementation challenges. 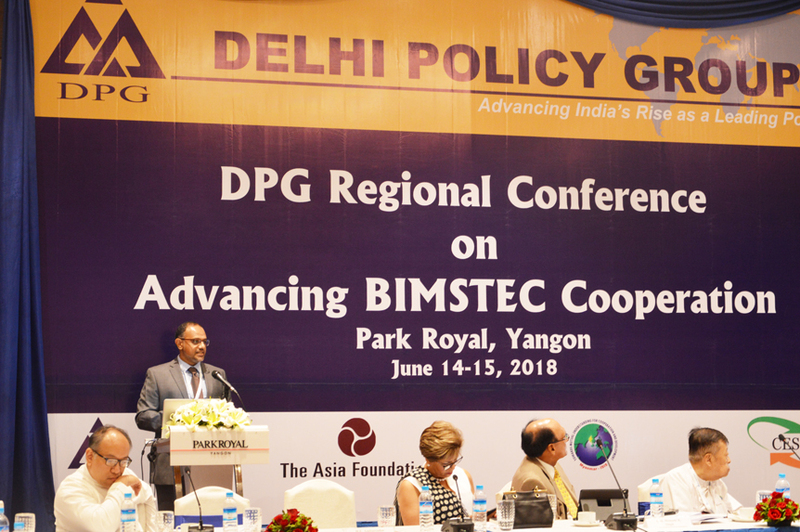 IPS Research Economist, Kanchana Wickramasinghe, highlighted that effective regional collaboration in the area of disaster management can bring in substantial benefits to increase disaster resilience in BIMSTEC countries. IPS participated in the TTI Exchange 2018 (TTIX), held in Pullman Bangkok King Power Hotel, on 12 – 14 November 2018. IPS researchers spoke at the ‘International Forum on China’s Reform and Opening Up and Poverty Reduction’, held on 01 – 02 November 2018, at Diaoyutai State Guest House, Beijing, China. 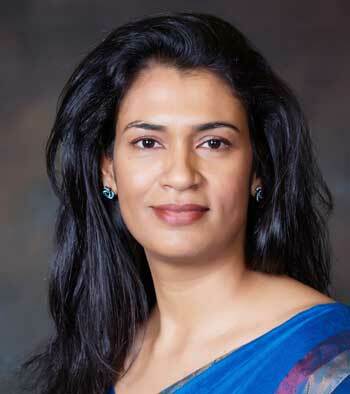 IPS Executive Director, Dushni Weerakoon, recently observed that Sri Lanka’s sensitivity to a rise in the cost of debt was high and the risks on currency turmoil have heightened with the current political standoff. 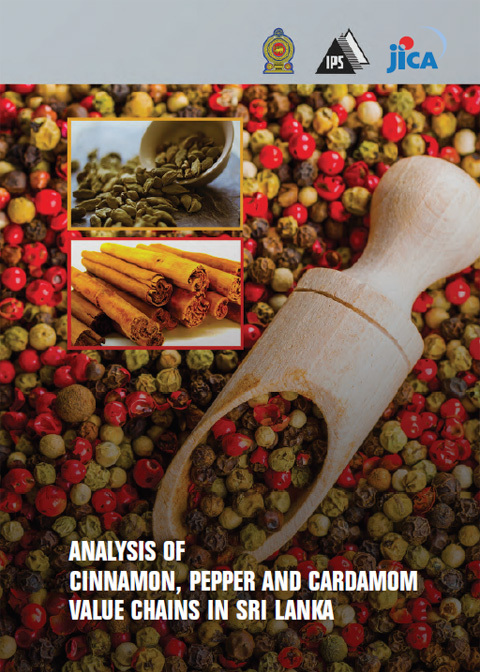 Sri Lanka has identified the spice sector as one of the key sectors for achieving better export performance in future due to the high demand in the export market. 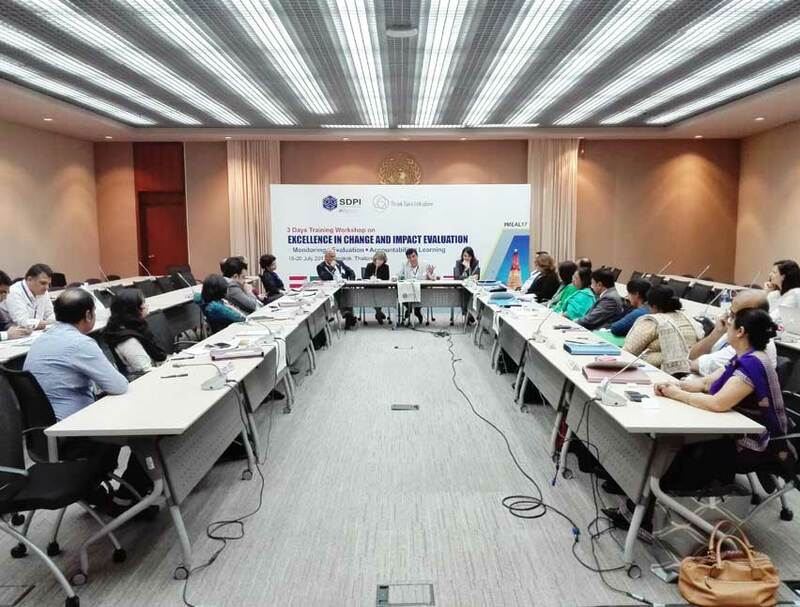 IPS Research Assistant, Chathurga Karunanayake, was a discussant at the roundtable discussion on ‘Towards an Asian Narrative on Tax Justice and Financial Transparency’, held on the 29 – 30 October 2018 in New Delhi, India. 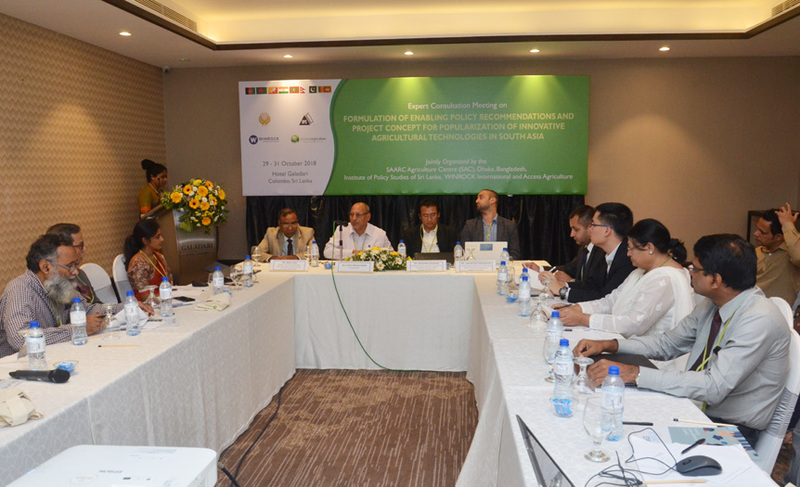 IPS hosted the Regional Consultation Workshop for Formulation of Enabling Policy Recommendations and Project Concept for Popularization of Innovative Agricultural Technologies in South Asia from 29 – 31 October 2018 in Colombo. 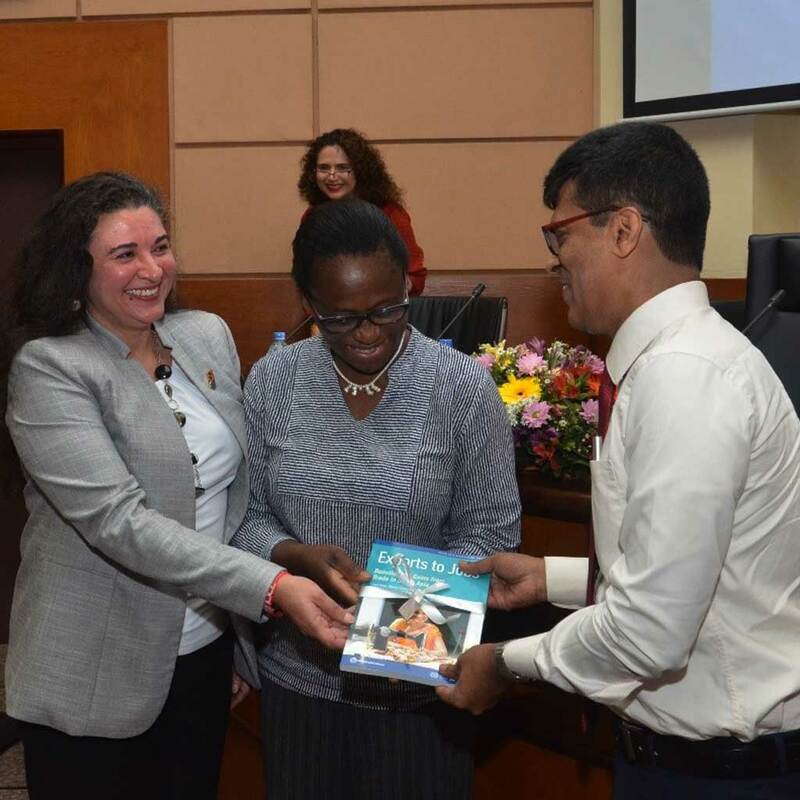 IPS Research Fellow, Bilesha Weeraratne, met Secretary to the Ministry of Telecommunication, Digital Infrastructure, and Foreign Employment, Mr. Chulananda Perera to present a copy of the IPS study Regulating Sub Agents for Better Migration from Sri Lanka. IPS Research Fellow and Head of Agricultural Policy Research, Manoj Thibbotuwawa, highlighted the importance of mainstreaming climate change adaptation in to agricultural policies. 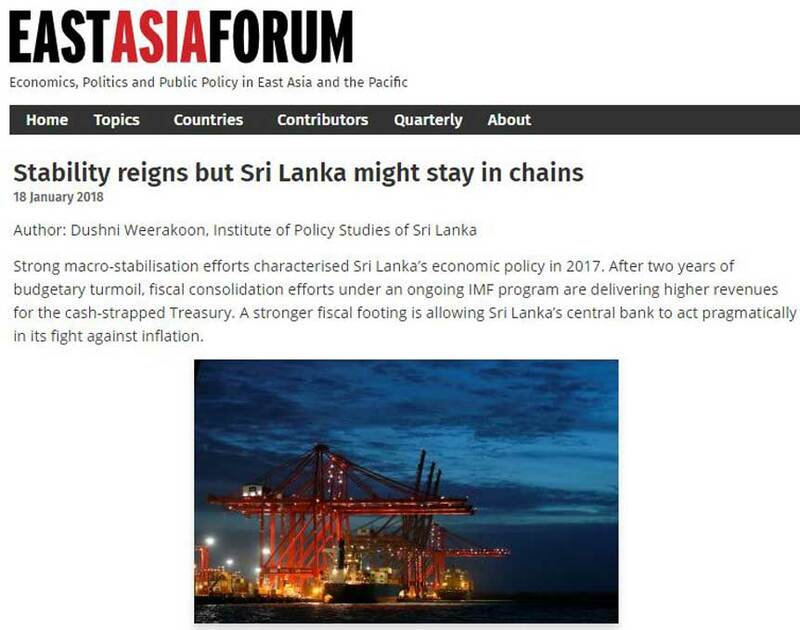 IPS Executive Director, Dushni Weerakoon, recently warned that risks to the Sri Lankan economy in the coming years were going to be more challenging. 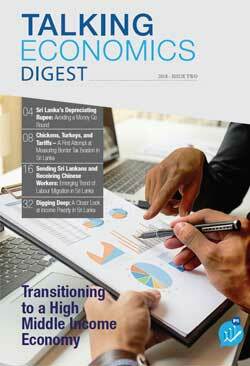 Despite positive elements in the in Sri Lanka’s macroeconomic environment, economic growth has remained sluggish, at under 4% for six consecutive quarters, while debt accumulation has been accelerating, pointed out IPS Executive Director, Dushni Weerakoon. IPS Research Officer, Chinthani Sooriyamudali, recently discussed Sri Lanka’s status and issues with regard to Sustainable Development Goal (SDG) 10 on reducing inequalities. 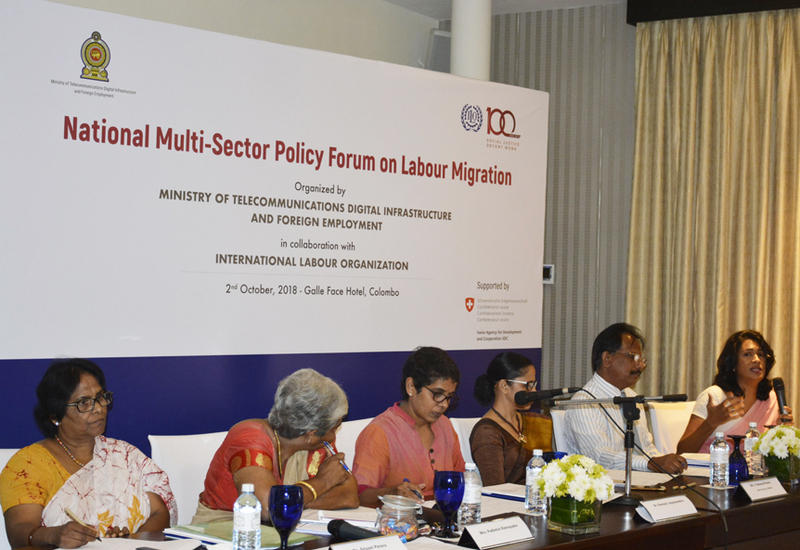 IPS Research Fellow and Head of Migration and Urbanization, Bilesha Weeraratne, highlighted the importance of balancing the emphasis on skilled labour migration, with the demand for skilled labour in the local labour market in Sri Lanka. 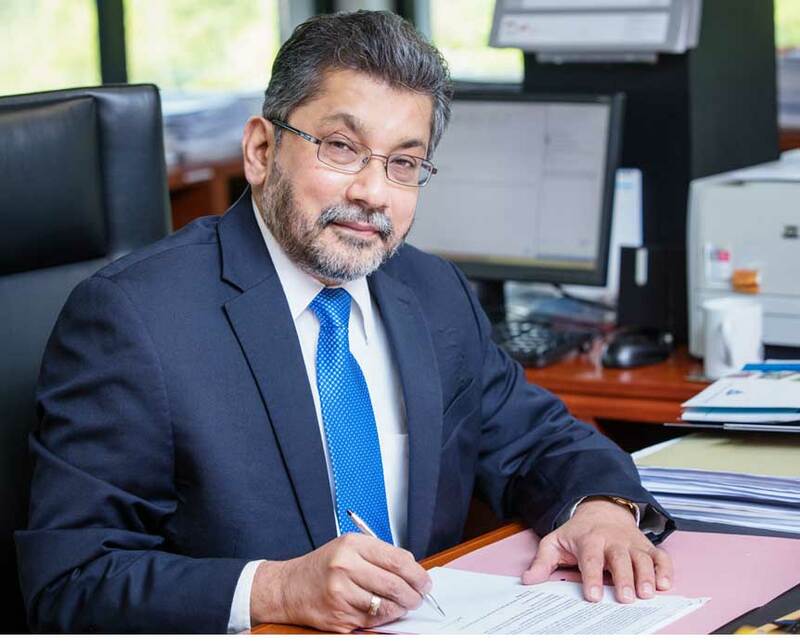 IPS Research Fellow, Janaka Wijayasiri, served as a member of the Panel of Judges at the 26th Annual National Chamber of Exporters of Sri Lanka’s (NCE) Export Awards. Political commitment is considered to be a key success factor in the National Single Window (NSW) implementation. 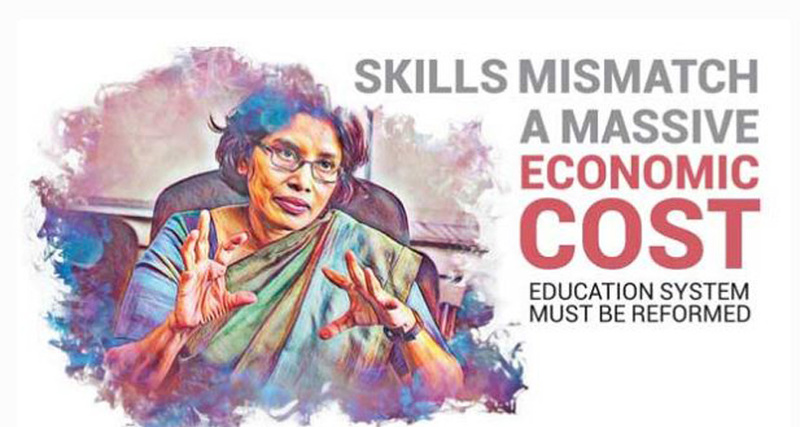 Better labour market information is essential for planning human resources to meet the ever changing demands of the labour market, IPS Director of Research, Nisha Arunatilake, noted recently. A recent study by the IPS revealed that, although Foreign Direct Investment (FDI) inflows to Sri Lanka have ‘recovered’ in 2017, the underlying bottlenecks have prevented Sri Lanka from ushering in optimal FDI gains throughout the post-war period. 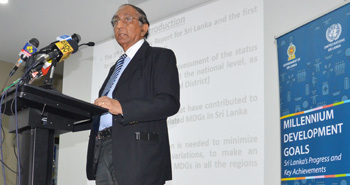 Climate change and climate uncertainty has increased the demand for climate information products (CIPs) in Sri Lanka, an expert pointed out recently. 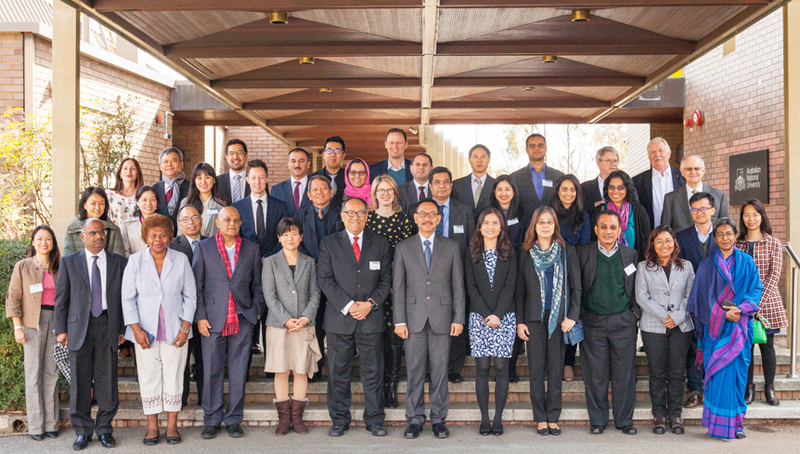 ADB-Asian Think Tank Development Forum 2018, centered on the theme ‘Upgrading Human Capital and Skills Development for Future Asia’, was held at the Australian National University (ANU), Canberra, on 22-23 August 2018. 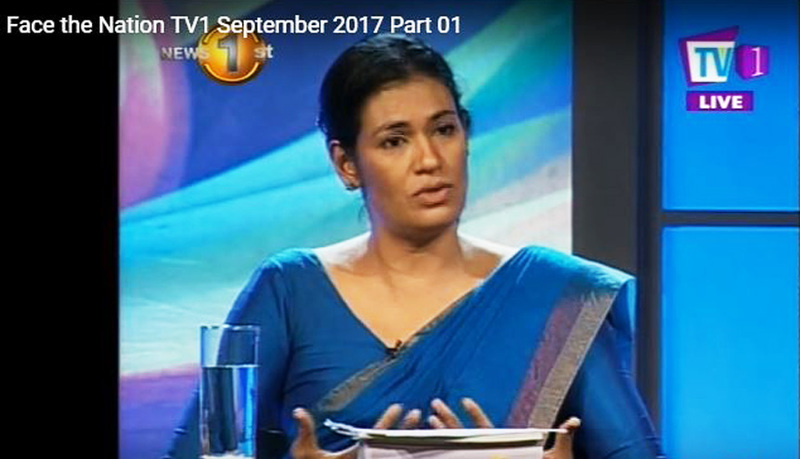 Participating in the Biz1st ‘Face the Nation’ (FTN) live panel discussion, broadcast over TV1 (formerly MTV Sports) on 20 August 2018, IPS Research Officer, Kithmina Hewage, debated whether Free Trade Agreements Sri Lanka has signed and those in the pipeline will bring doom or prosperity to Sri Lanka. 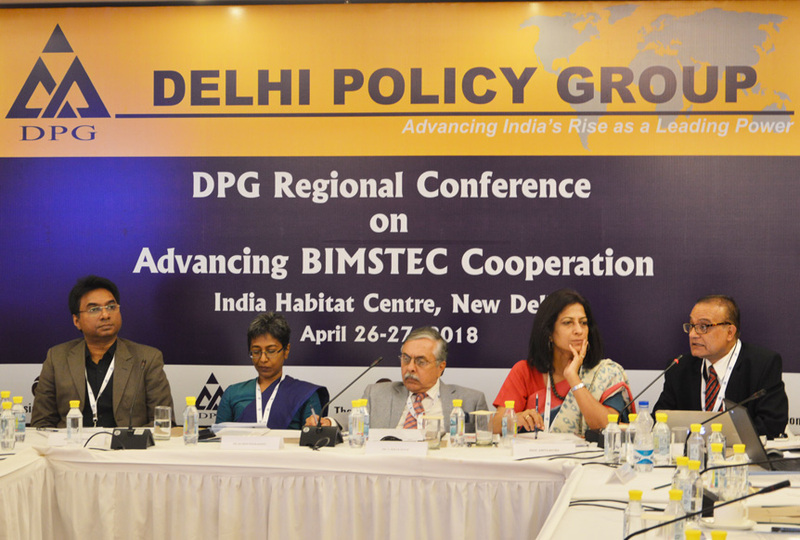 IPS Director of Research, Nisha Arunatilake, was a discussant to the session on ‘People to People Connectivity through Multi-sectoral Engagement’ of the Delhi Policy Group Regional Conference on Advancing BIMSTEC Cooperation. Economic impact of immigration, human trafficking and forced labour, reintegration of migrant workers, debt as a driver of migration, education standards of children left behind by migrants, and health of migrant workers are some of the key areas where there are gaps in research and policy, a recent Policy Engagement Forum on Migration, identified. IPS recently highlighted the importance of articulating the different options for the operations model of the National Single Window (NSW) at the beginning of the project, given that such decisions will determine the source of funding and fees charged for the services provided by the operator. 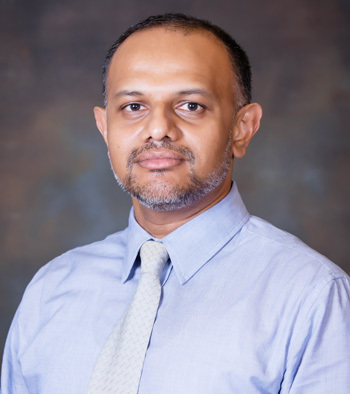 Climate change is a gradual process and the economic impacts are felt in the long-term; as a result, Sri Lanka’s understanding and preparedness to face these slow-onset impacts are relatively low, pointed out IPS Research Fellow, Athula Senaratne, recently. 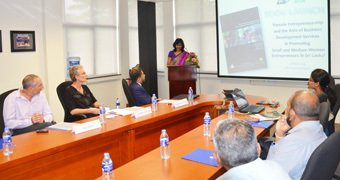 Sri Lanka has taken several important steps to protect the rights of migrant workers, especially female domestic workers, and one such important measure the pre-departure training provided by the Sri Lanka Bureau of Foreign Employment (SLBFE), noted IPS Research Fellow, Bilesha Weeraratne. 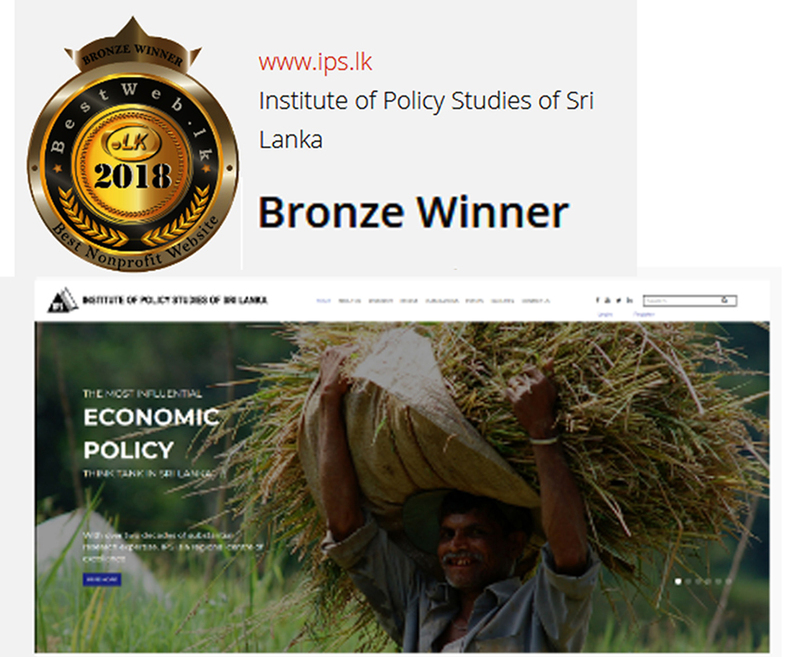 IPS website bagged the bronze medal in the ‘Nonprofit’ category of the BestWeb.lk 2018 contest organized by the LK Domain Registry for the eighth time to recognise the best websites in Sri Lanka. 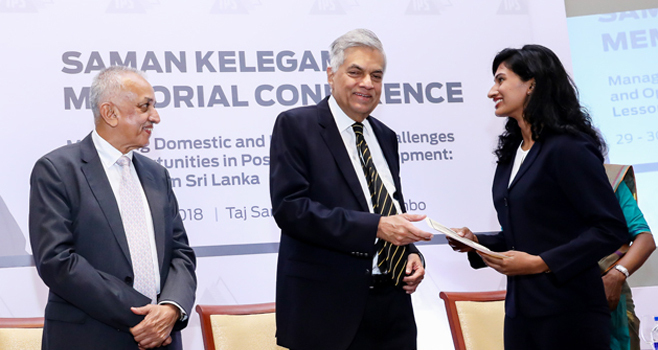 Delivering the Keynote Address at the Saman Kelegama Memorial Conference, Prime Minister, Ranil Wickremesinghe, noted that Sri Lanka has to address weaknesses in trade competitiveness, eliminate trade barriers, tackle anti-dumping legislation, and help domestic industries become competitive. 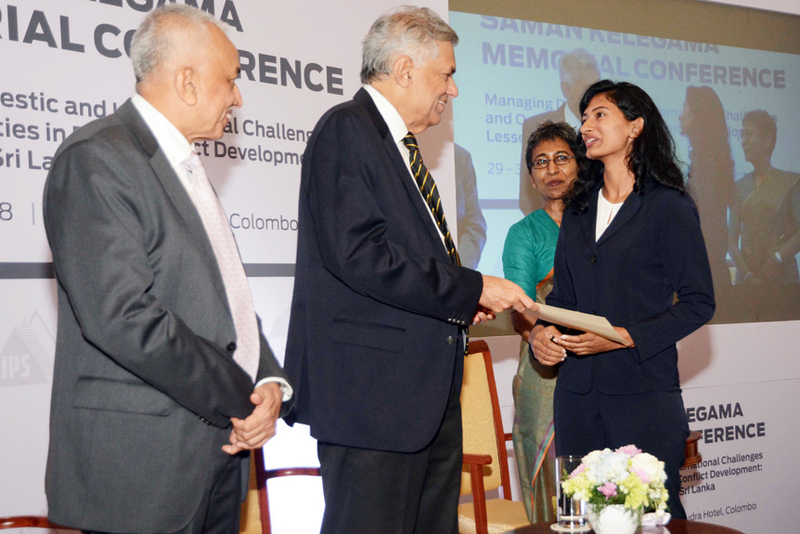 The first Saman Kelegama Memorial Research Grant was awarded to Thisali de Silva, a student of the University of Colombo. 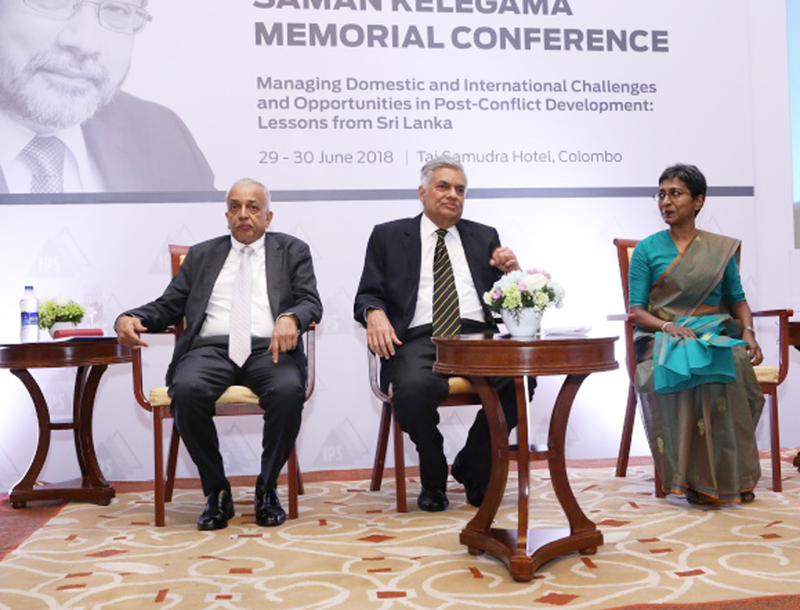 Delivering the inaugural Saman Kelegama Memorial Lecture, Governor of the Central Bank of Sri Lanka (CBSL), Dr. Indrajit Coomaraswamy noted that Dr. Kelegama was an embodiment of many qualities, both professional and human. 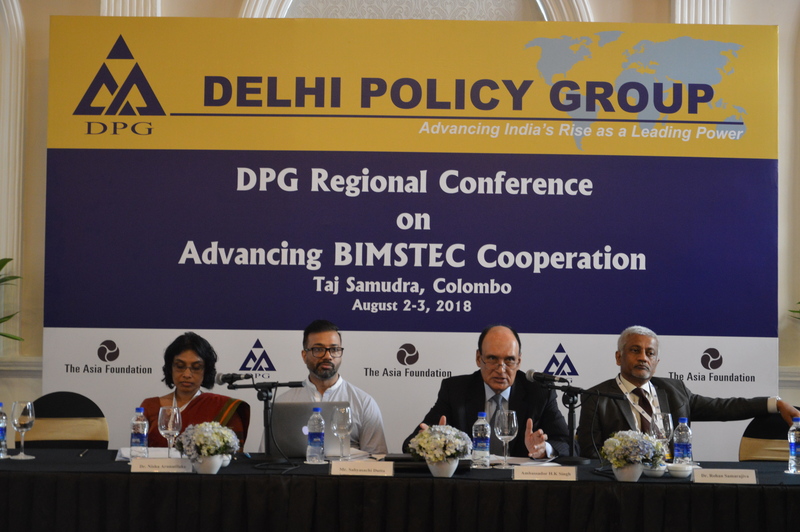 IPS Research Fellow, Janaka Wijayasiri, argued that the long overdue BIMSTEC Free Trade Agreement (FTA) should offer more opportunities than what Sri Lanka already obtains through existing FTAs in the region if the agreement is to be of relevance to Sri Lanka. 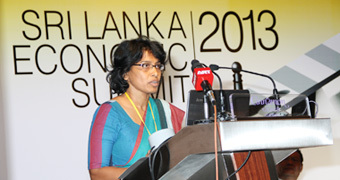 Protection for Intellectual Property (IP) is vital to support growth and stimulate innovation in developing countries, provided that they are implemented at the right time – and Sri Lanka is at the right stage in development to formulate and implement such a policy, highlighted Executive Director of IPS, Dushni Weerakoon. 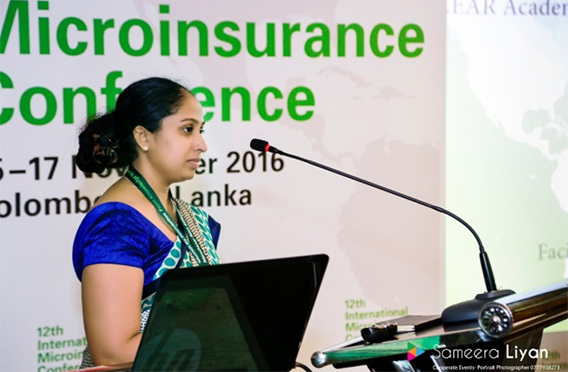 IPS Research Economist, Kanchana Wickramasinghe, pointed out that "natural disaster incidence has increased as of late and dry zone, paddy farmers are particularly vulnerable." 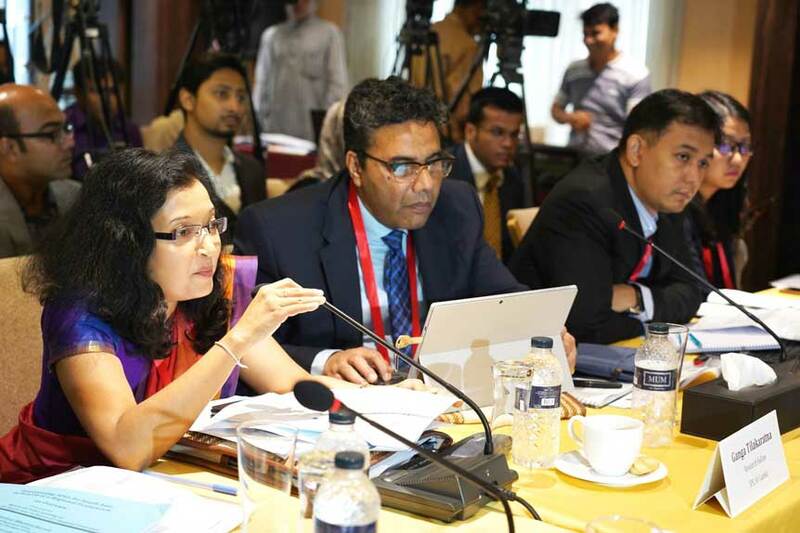 IPS Executive Director, Dushni Weerakoon, attended the Commonwealth-CII Consultation on Multilateral, Regional and Emerging Trade Issues for Asia on 05 – 06 June 2018, in New Delhi, India. 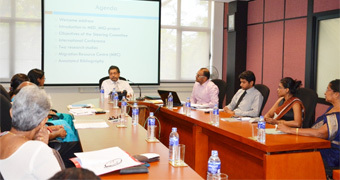 The IPS, together with the Ministry of Industry and Commerce (MIC) of Sri Lanka, organised a series of stakeholder consultation meetings relating to the study on “Formulation of Intellectual Property (IP) Policy for Sri Lanka”. 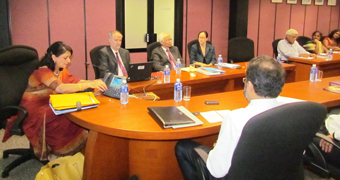 The setting up of a Steering Committee for the National Single Window (NSW) is of the utmost importance for a timely build and implementation of the NSW project in Sri Lanka, pointed out IPS recently. One of the major challenges when it comes to battling the negative impacts of climate change is bridging the climate information gaps, said noted an expert at a recent Policy Engagement Forum organised by the IPS. 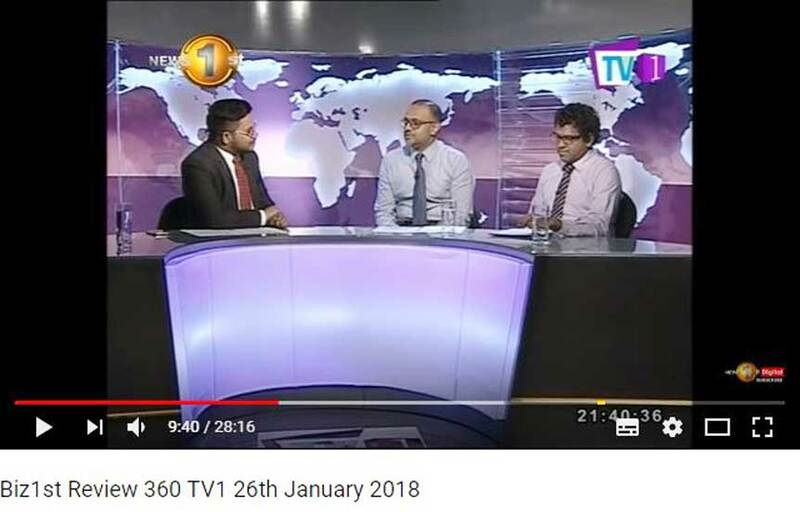 Speaking on News First Prime Time English News, IPS Research Fellow, Bilesha Weeraratne, argued that it is crucial to have a policy framework in place to ensure the quality of inbound migrant workers. 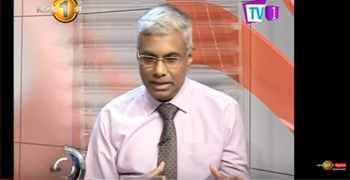 Speaking on Biz1st ‘Face the Nation’ (FTN) live panel discussion, broadcast over TV1 (formerly MTV Sports) on 14 May 2018, IPS Research Officer, Kithmina Hewage, dissected the pertinent elements of the Sri Lanka – Singapore Free Trade Agreement (SLSFTA). 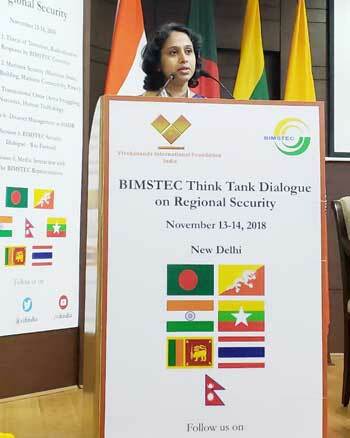 IPS Executive Director, Dushni Weerakoon, recently argued for a fresh rethinking of the proposed BIMSTEC Free Trade Agreement (FTA). In many Asian countries, it is normal for students to receive some form of private tutoring alongside formal schooling; in Sri Lanka too, shadow education (or tuition) is a social norm. 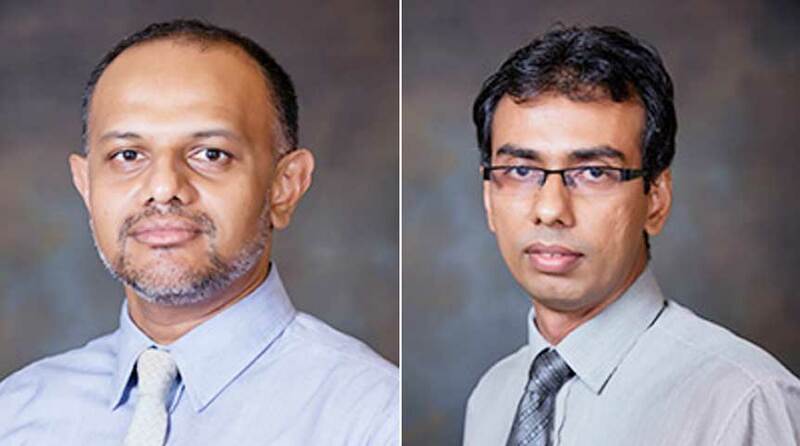 IPS Director of Research, Nisha Arunatilake, and IPS Research Officer, Ashani Abayasekara, recently pointed out that Sri Lanka’s secondary level education outcomes are constrained by several school-level factors. 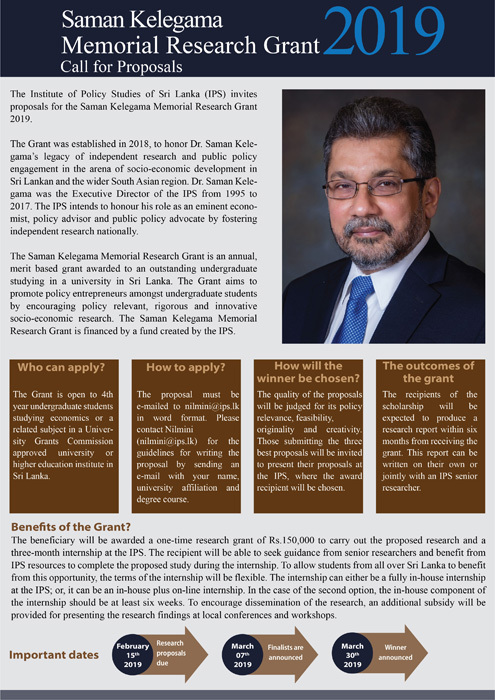 IPS is pleased to announce the first call for proposals for the Saman Kelegama Memorial Research Grant. 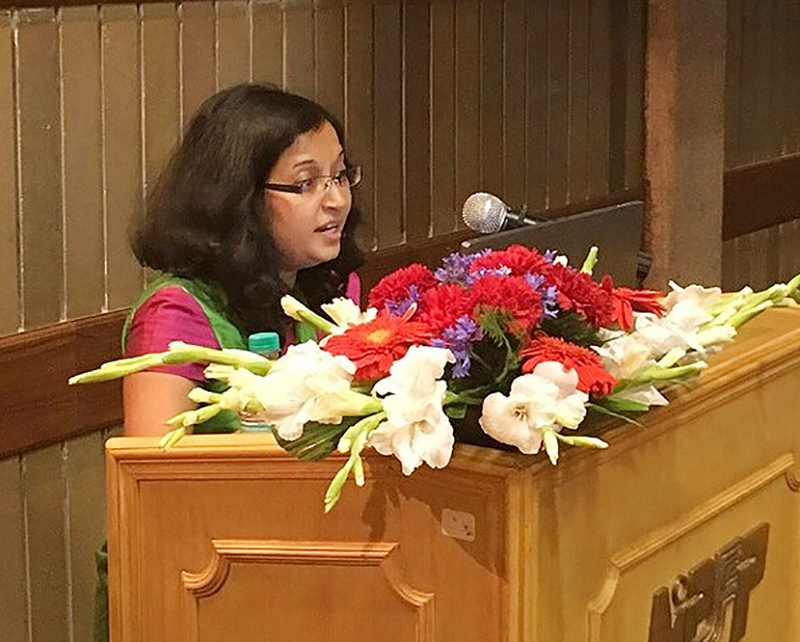 IPS Executive Director, Dushni Weerakoon, delivered a paper on ‘Sri Lanka: Post-war Economic Development in a Changing Global Landscape’ at the 12th ISAS International Conference on South Asia. 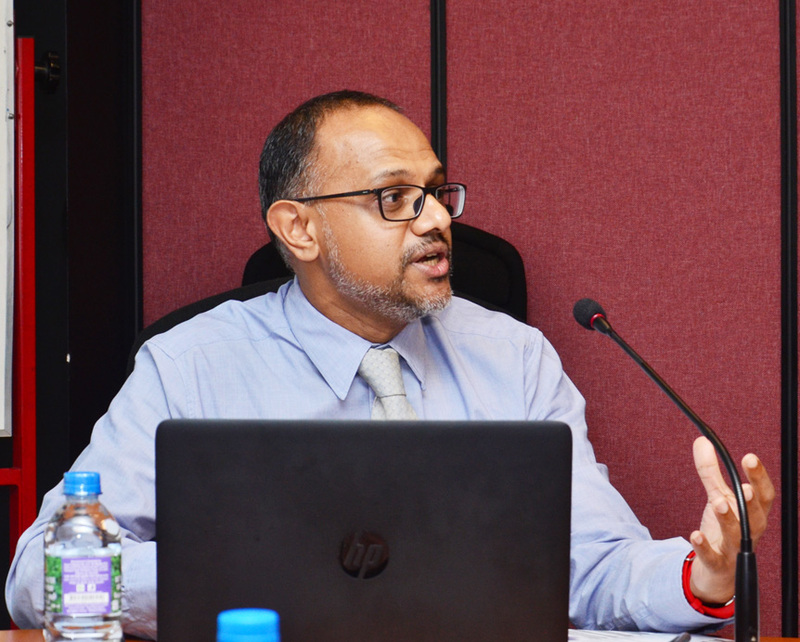 IPS Research Fellow, Janaka Wijayasiri, recently pointed out that Sri Lanka does not currently have the facility for single submission to fulfill all import/export related activities. 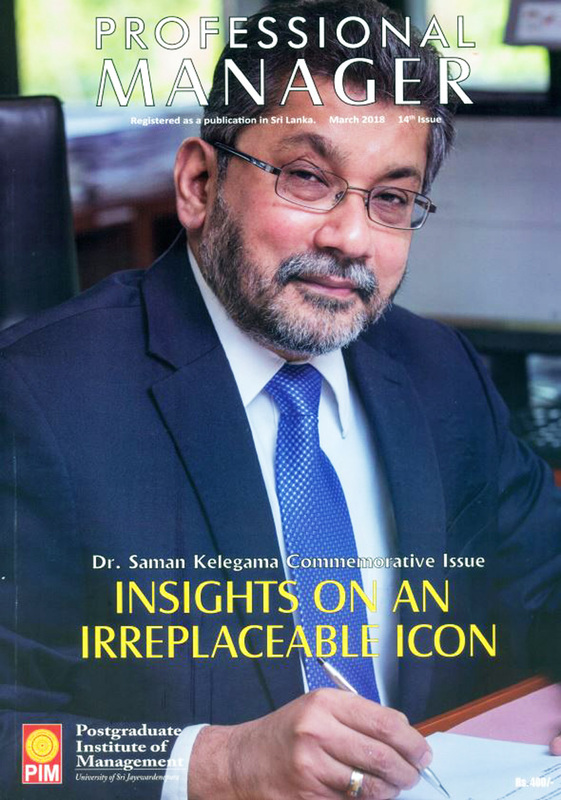 A special issue of the Professional Manager - a collection of articles commemorating the illustrious life of late Dr. Saman Kelegama - was launched on 03 April 2018 at the Dr. Saman Kelegama Auditorium of IPS. 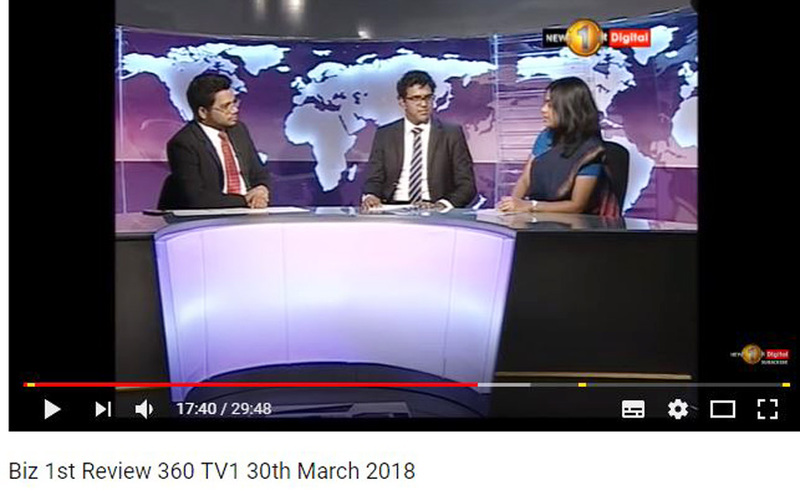 IPS Researchers Kithmina Hewage and Harini Weerasekera sat down with TV1 (formerly MTV Sports) Biz1st Review 360, to discuss the key obstacles facing Sri Lanka’s economic reform agenda, on 30 March 2018. 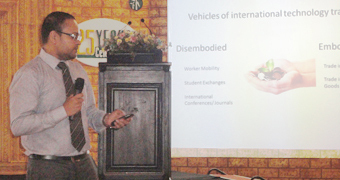 IPS Research Fellow, Janaka Wijayasiri, remarked that the tea industry in Sri Lanka, which is predominately export oriented, is increasingly governed by strict and complex standards. 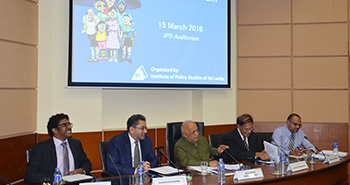 Dr. Wijayasiri spoke at the Policy Engagement Forum on Trade Research, hosted by IPS, on 27 March 2018. 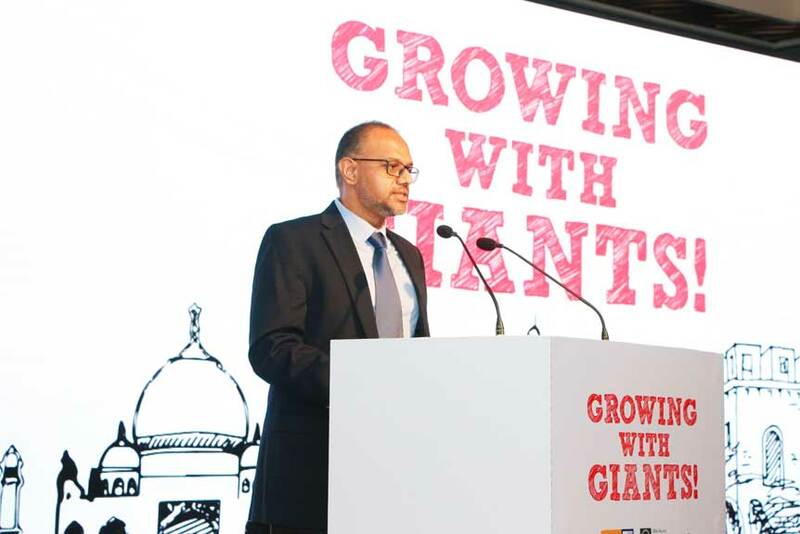 As a part of the government’s Vision 2025, Sri Lanka will promote smallholder agribusiness partnerships (SAP), said Austin Fernando, Secretary to the President of Sri Lanka. Sri Lanka is doing well but not well enough with regard to social work and philanthropy shows the inaugural Doing Good Index 2018 (DGI), compiled by the Centre for Asian Philanthropy and Society (CAPS). 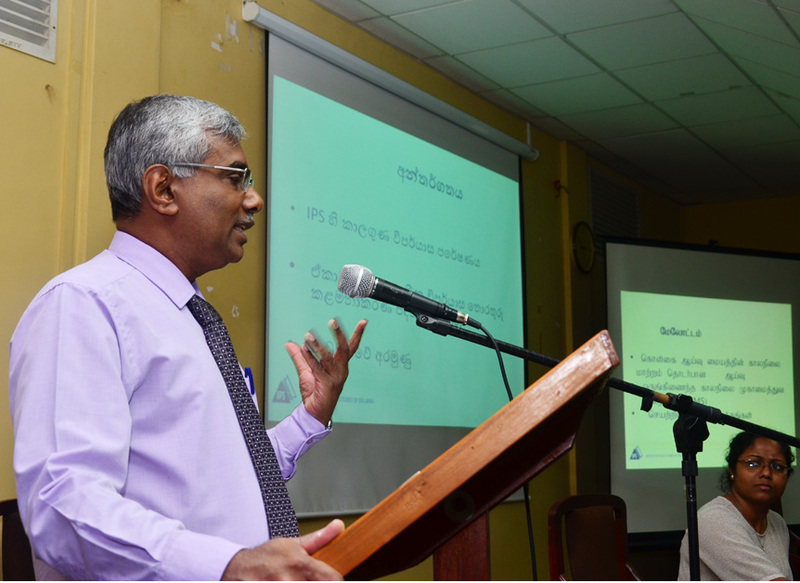 IPS Research Economist, Kanchana Wickramasinghe, recently highlighted the problems that farmers face due to uncertainties in the weather conditions in Sri Lanka. 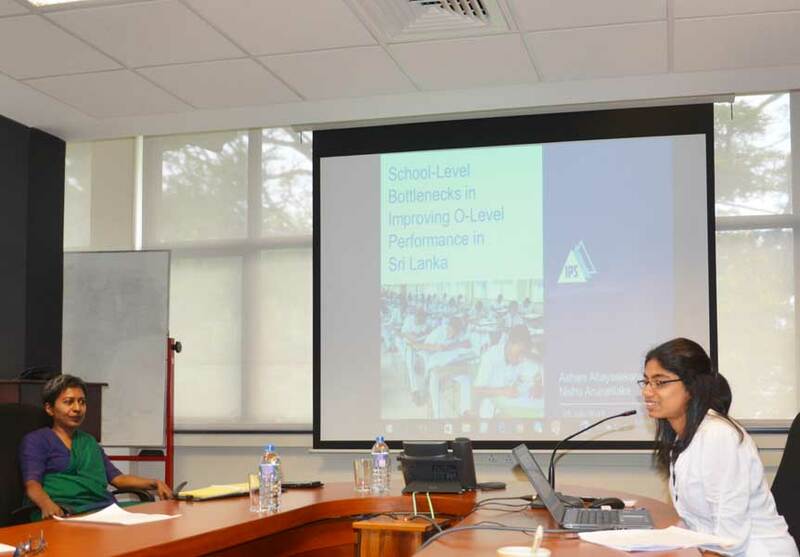 IPS Research Fellow, Bilesha Weeraratne, made a presentation on the Impact Evaluation of MathCloud in Sri Lanka, at the South Asia Regional Symposium on ICT for Education. 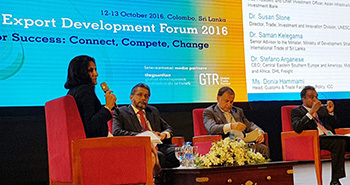 Balancing competing interests when implementing economic policy is a challenge for the Sri Lankan government, a top government minister recently said. 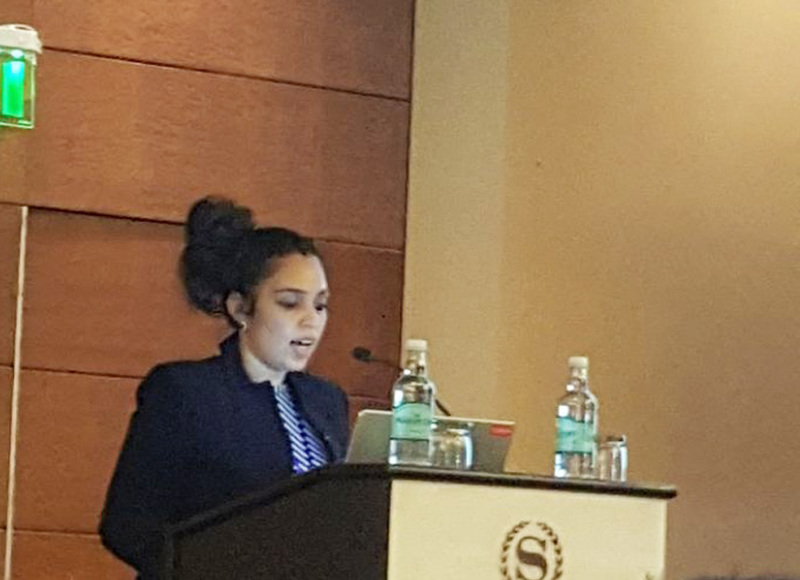 IPS Research Fellow, Bilesha Weeraratne, made a presentation on the preliminary findings of her ongoing study on Recruitment Intermediaries in the Foreign Employment Industry in Sri Lanka, at the Partner Exchange Platform on Ethical Recruitment. In the Sunday Observer article on tackling the cost of living in Sri Lanka, IPS Research Economist Kanchana Wickramasinghe discussed how climate resilient agriculture can keep inflation down. 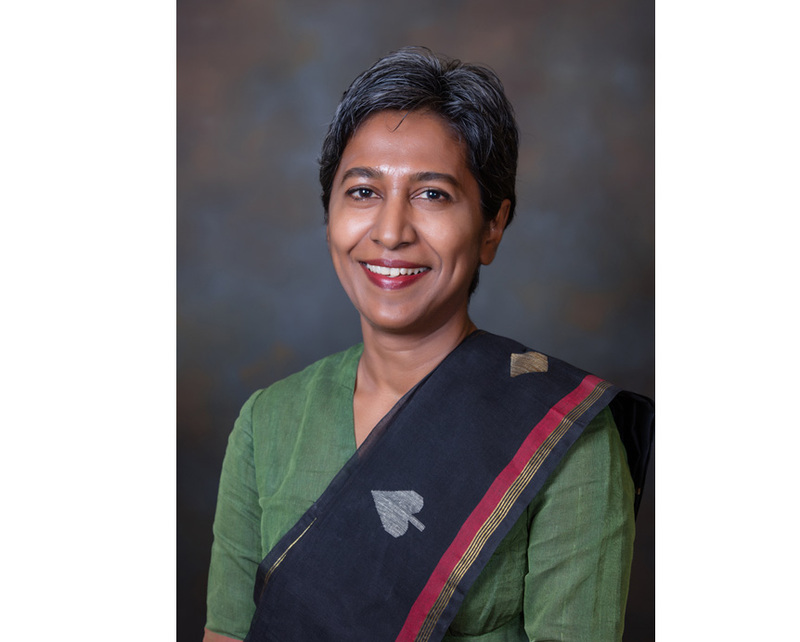 IPS Executive Director, Dushni Weerakoon, recently spoke on the importance of institutions, governance, and trade in the context of emerging global and regional challenges. 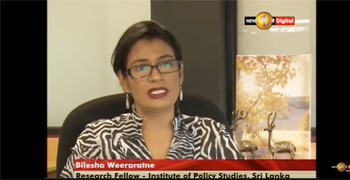 In an interview with World Politics Review, IPS Research Economist Sunimalee Madurawala discussed Sri Lanka’s current drug policies and challenges ahead. 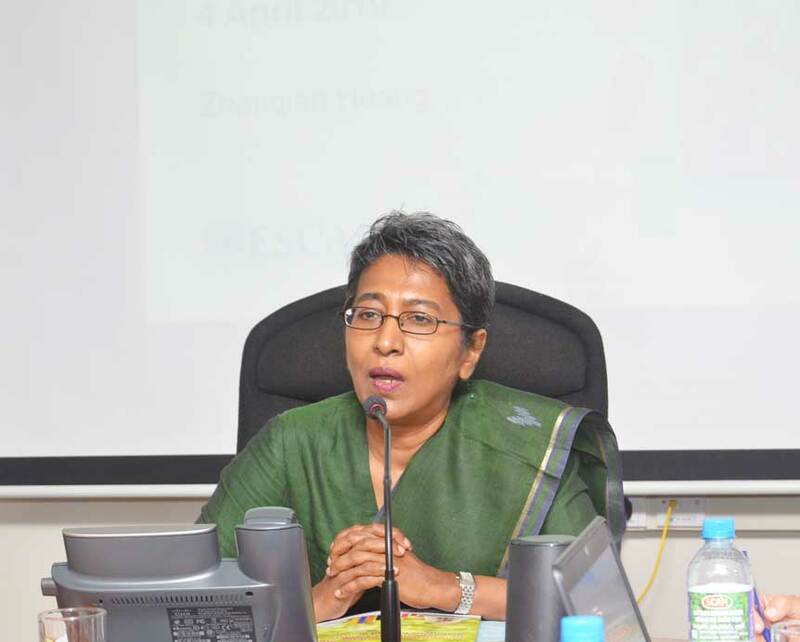 IPS Executive Director, Dr. Dushni Weerakoon, recently highlighted the contribution of the Think Tank Initiative (TTI) to building research leadership, seeding new areas, recruiting exemplary staff and re-defining issues in new areas of work such as on measuring urbanization in Sri Lanka. 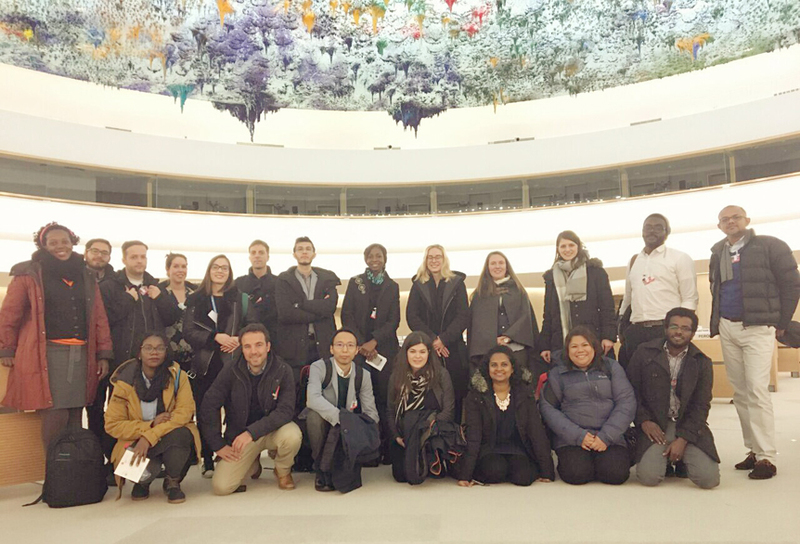 IPS Research Fellow, Janaka Wijayasiri, participated in the Winterschool for Think-tankers 2018, organized by The Think Tank Hub Geneva and Foraus. 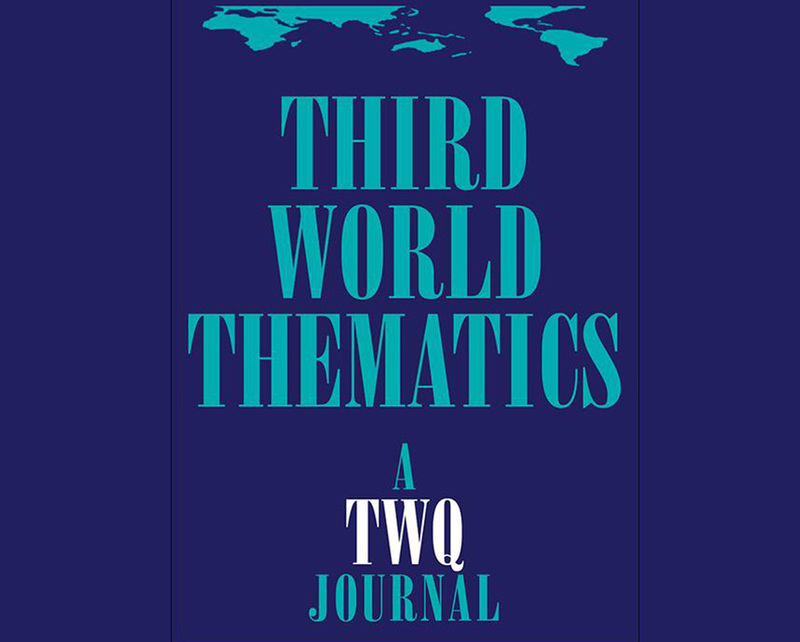 As of 2013, out of the total wage employees, 56% were in precarious employment – ie: temporary/casual workers or workers without a permanent employer, noted IPS Research Economist, Priyanka Jayawardena recently. While Sri Lanka has been performing well at the primary education level, significant policy gaps exist when it comes to secondary and tertiary education, IPS revealed recently. 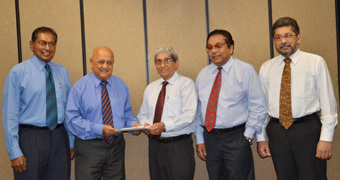 IPS Research Fellow, Janaka Wijayasiri and IPS Research Officer, Kithmina Hewage, discussed the benefits of the Sri Lanka – Singapore Free Trade Agreement (SLSFTA). 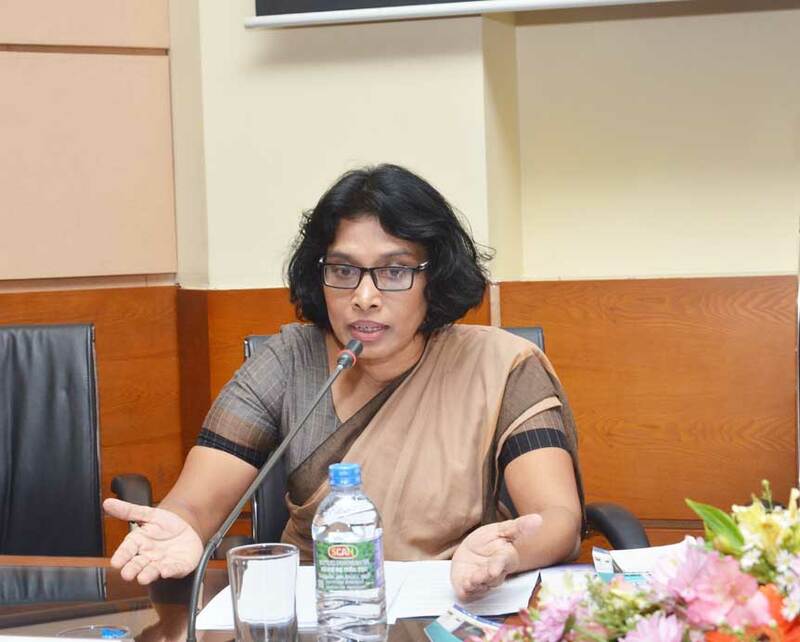 IPS Research Fellow, Bilesha Weeraratne, made a presentation on the preliminary findings of her ongoing study on Recruitment Intermediaries in the Foreign Employment Industry in Sri Lanka at the Ministry of Foreign Employment on 25 January 2018. 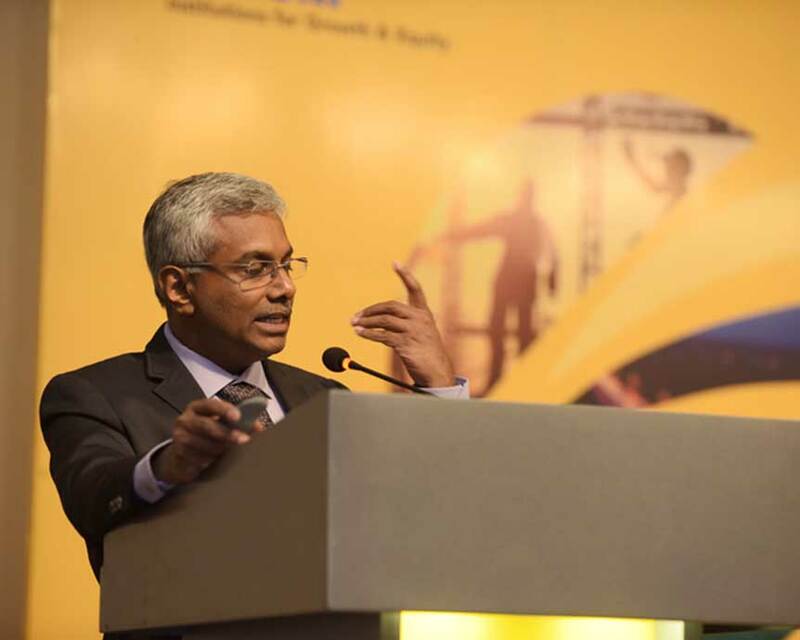 Singapore Prime Minister Lee Hsien Loong paid tribute to late Dr. Saman Kelegama, former Executive Director of IPS. 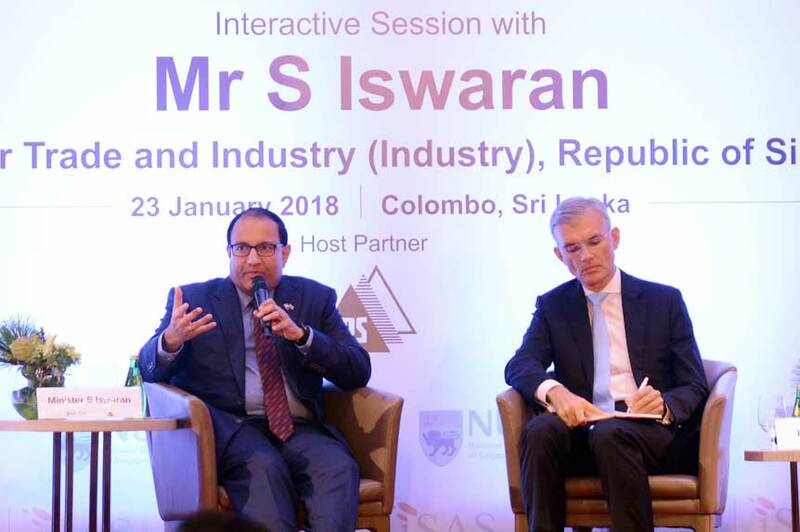 Singapore’s Minister for Trade and Industry, S. Iswaran, was optimistic about the new trade and investment avenues opened up by the SLSFTA, during the ISAS Colombo Colloquium, co-hosted by IPS, on 23 January 2018. 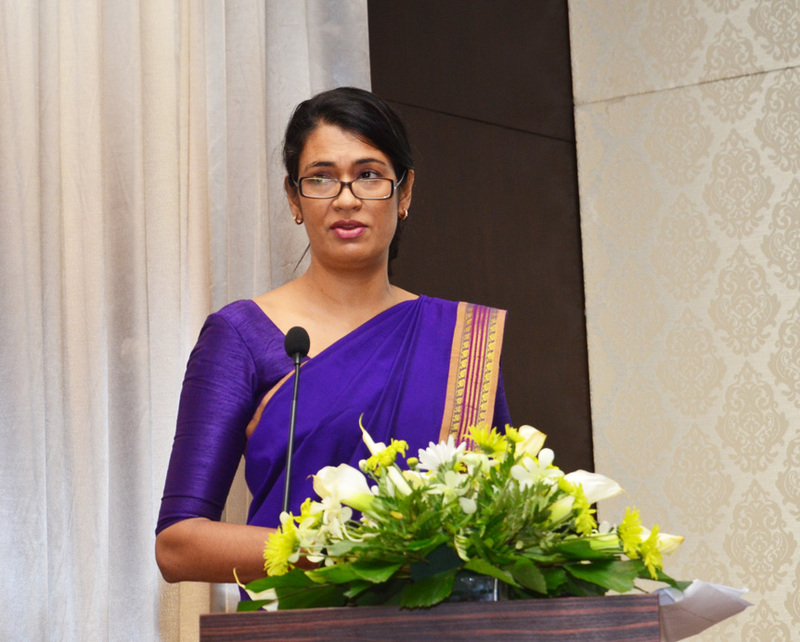 Strong macro-stabilisation efforts characterised Sri Lanka’s economic policy in 2017, but Sri Lanka is expected to enter a critical phase of its economic reforms this year, IPS Executive Director, Dushni Weerakoon, noted. IPS Research Fellow, Bilesha Weeraratne, attended the First International Forum on Migration Statistics (IFMS), at the OECD Conference Center in Paris, France on 15 – 16 January 2018. IPS Research Officer, Dilani Hirimuthugodage, speaking on cinnamon production, recently highlighted the importance of maintaining quality standards at each level of cinnamon value chain. IPS Research Officer, Samanthi Bandara, recently highlighted the importance of developing micro-finance as a risk coping mechanism for the poor in rural areas. 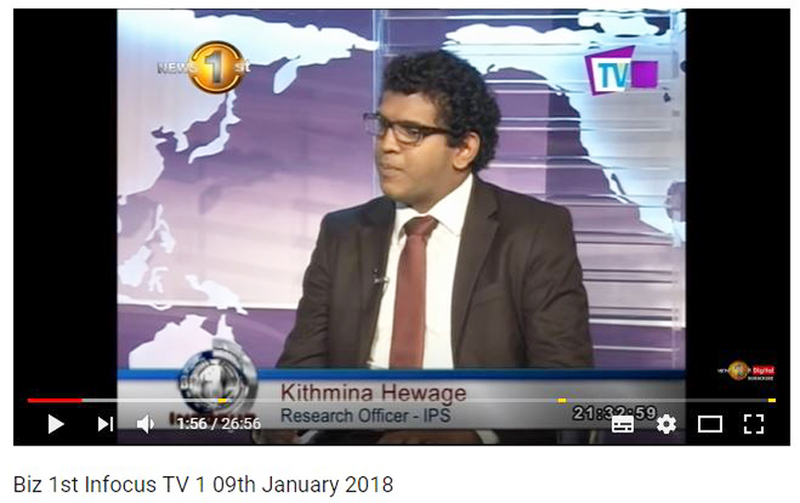 Speaking on Biz1st Infocus, broadcast over TV1 (formerly MTV Sports) on 09 January 2018, IPS Research Officer, Kithmina Hewage, discussed the potential advantages of a Free Trade Agreement (FTA) with Malaysia. 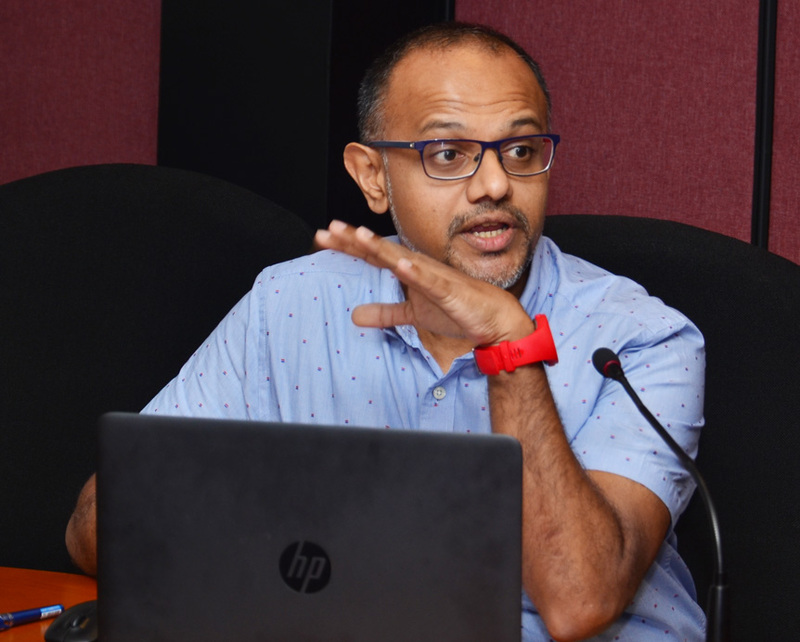 IPS Research Fellow, Athula Senaratne, recently noted that gaps in information, technology, and policy are some of the main challenges in tackling climate change and pointed out that farmers in Sri Lanka are especially vulnerable to climate information gaps. 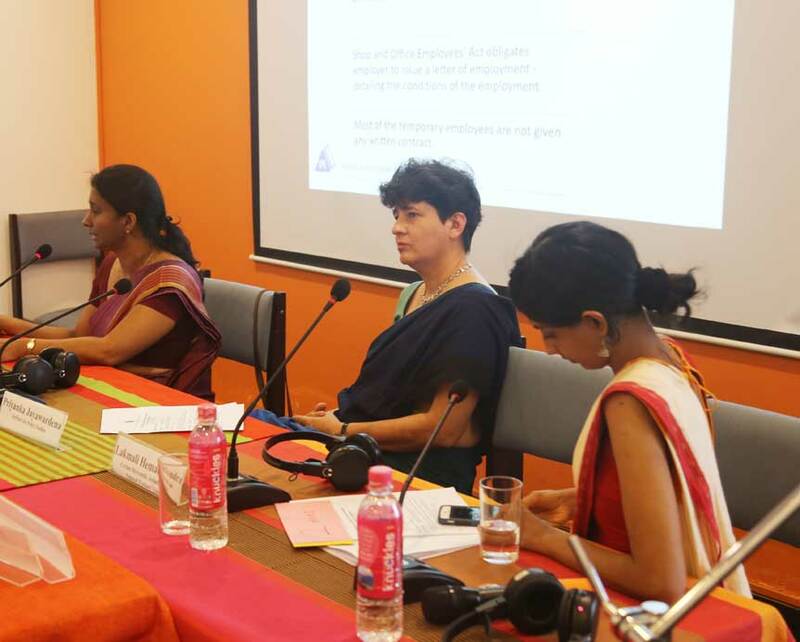 IPS Research Economist, Kanchana Wickramasinghe, recently highlighted the nature of risks and vulnerabilities that women would face due to impacts of climate change, at a roundtable discussion. 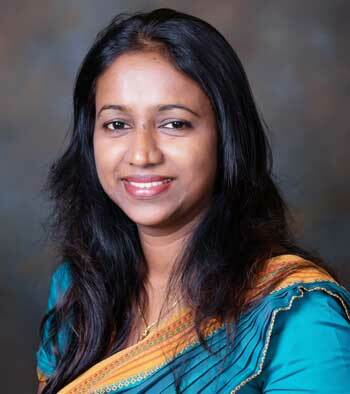 Dr. Nisha Arunatilake has been appointed as the Director of Research of IPS, effective from 01 January 2018. 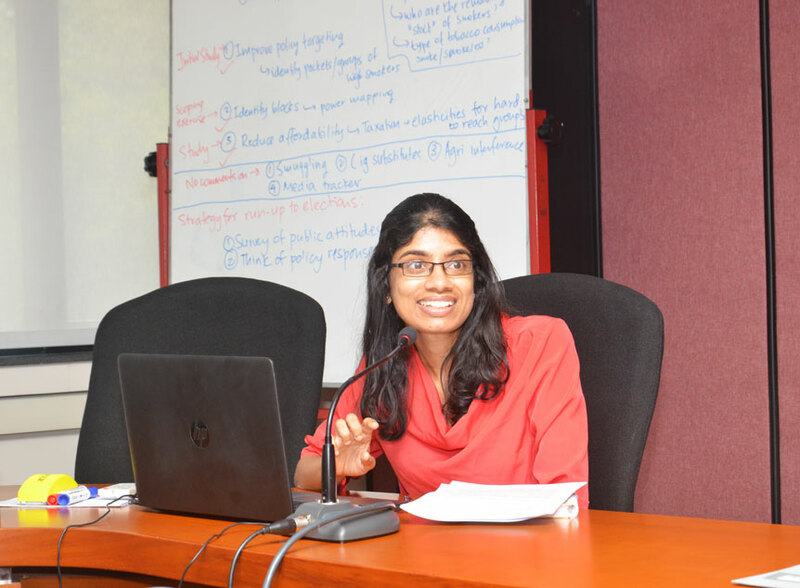 IPS Research Economist, Kanchana Wickramasinghe, recently shared her views on Sri Lanka’s 2018 Budget proposals which aimed at improving climate resilience of the country. The #SOE2017 Twitter Chat, hosted by IPS (@TalkEconomicsSL) to unpack the findings of the Institute’s flagship report, ‘Sri Lanka: State of the Economy 2017’, was held on 14 December 2017. 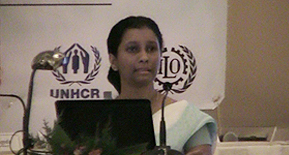 IPS Research Officer, Samanthi Bandara, highlighted slow economic growth, human development challenges, environmental degradation, inadequate financial resources, lack of an institutional integration (vertical and horizontal integration), and lack of integration with private sector as common sustainable development challenges that South Asian countries face. 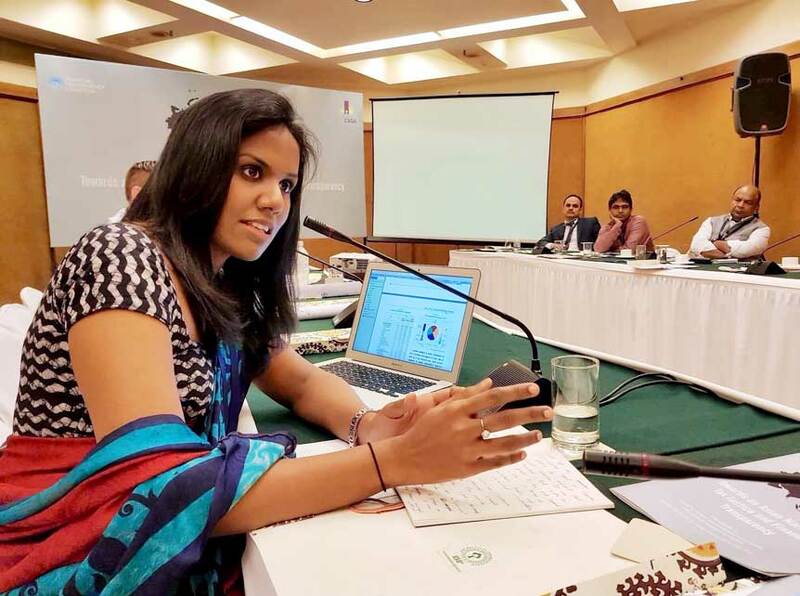 IPS Research Assistant, Yolanthika Ellepola, recently noted that South Asian countries have shown a significant commitment towards achieving health and health related SDGs. 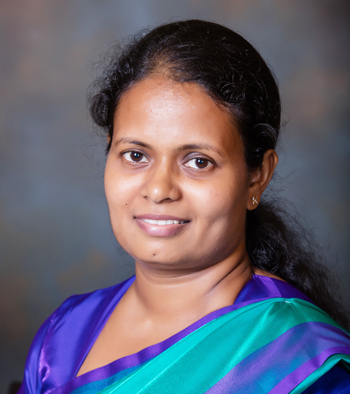 IPS Research Fellow, Nisha Arunatilake, recently noted that while Sri Lanka had a surplus of teachers, the country was experiencing a shortage of qualified and experienced teachers, especially in subjects of mathematics and science. 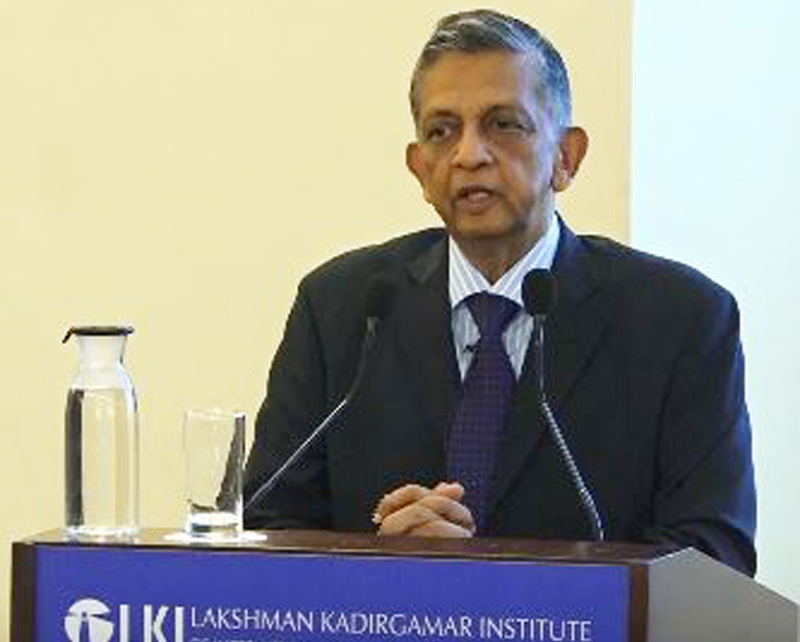 Dr. S. Narayan spoke at the joint lecture on ‘India-Sri Lanka Economic Relations in Modi’s India,’ hosted by IPS and the Lakshman Kadirgamar Institute of International Relations and Strategic Studies (LKI), on 20 November 2017, at the Lighthouse at LKI. 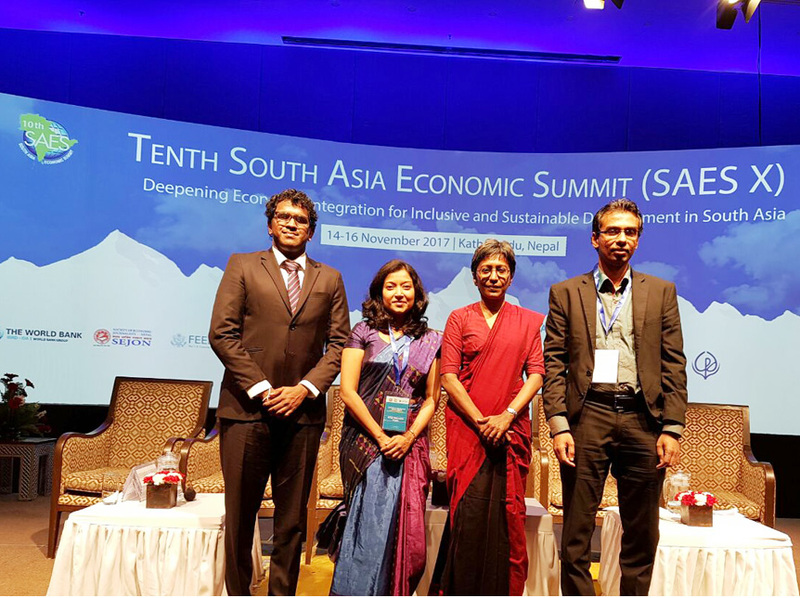 ‘Deepening Economic Integration for Inclusive and Sustainable Development in South Asia’ was the theme of the 10th South Asia Economic Summit (SAES), held on 14 – 16 November, in Kathmandu, Nepal. 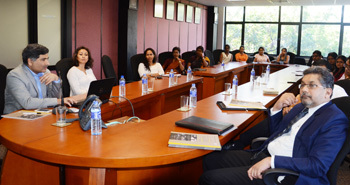 Prof. Milan Vodopivec, formerly a lead economist at the World Bank and the State Undersecretary at the Ministry of Labour of Slovenia, says Sri Lanka should improve access to permanent jobs for all and make the labour market more flexible. 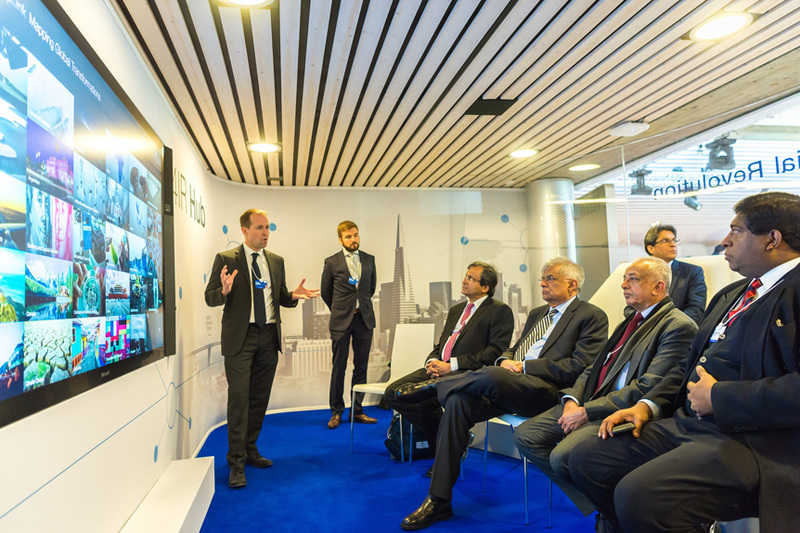 A team of researchers from IPS developed a Transformation Map for Sri Lanka for the World Economic Forum (WEF). 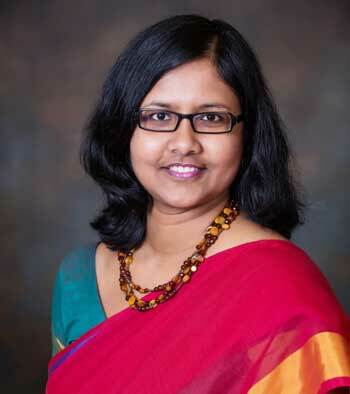 ‘Sri Lanka’s Debt Troubles in the New Development Finance Landscape’ by IPS Executive Director, Dushni Weerakoon, examines the challenges middle-income countries face in the new development finance landscape as the overall costs and risks of a debt portfolio rises. 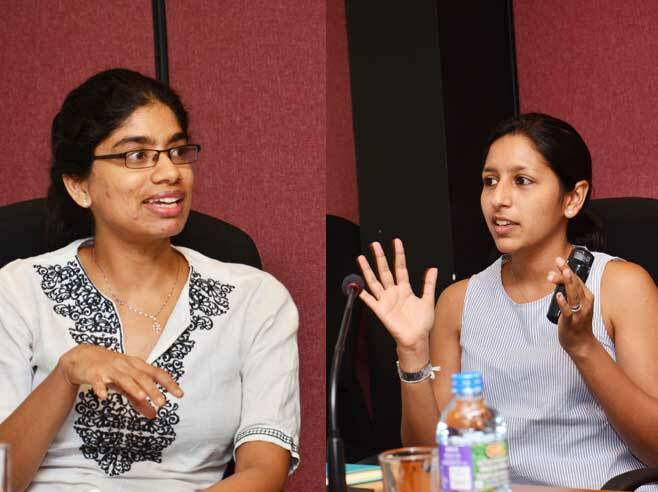 IPS Research Fellow, Ganga Tilakaratna, recently discussed the government initiatives to localize the Sustainable Development Goals (SDGs) and to enhance coordination of the SDG implementation in Sri Lanka. IPS Research Fellow, Nisha Arunatilake, has been appointed as a member of the Standing Committee on Higher Education of the National Education Commission (NEC) from 01 November 2017. 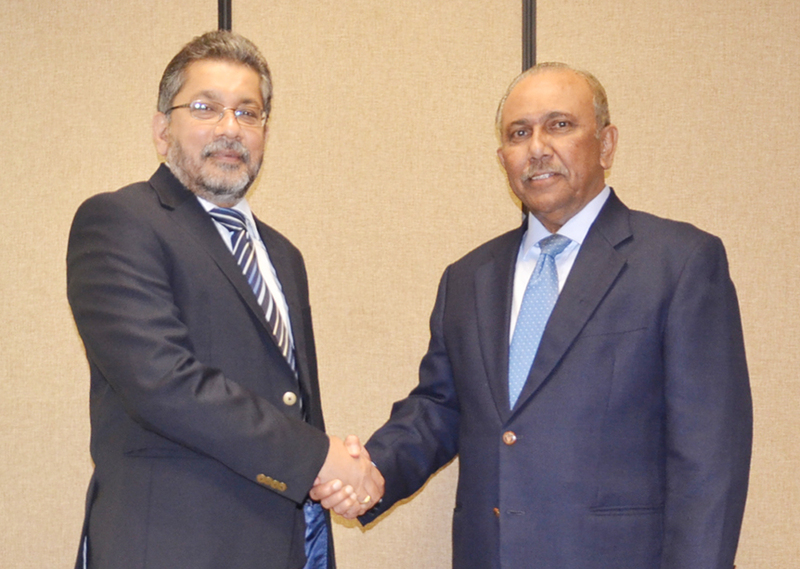 Dr. Dushni Weerakoon has been appointed as the Executive Director of the IPS. 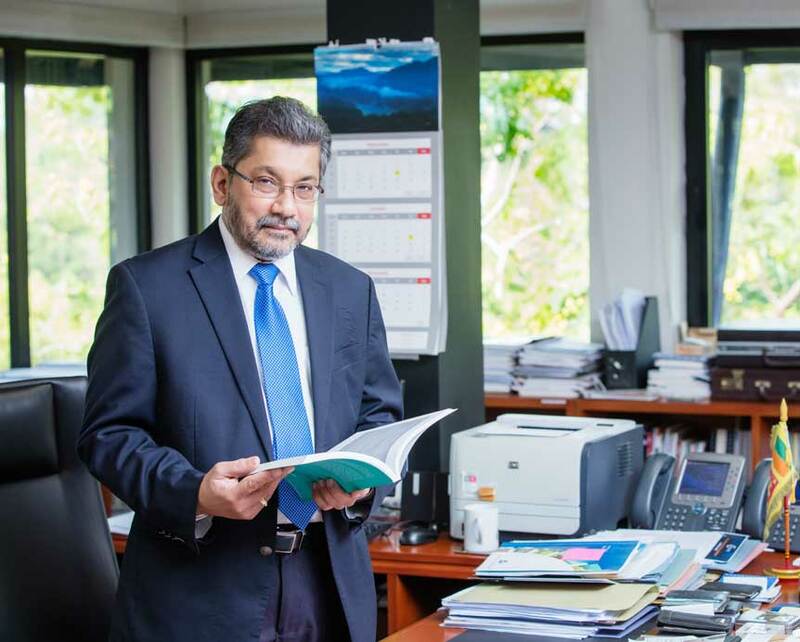 She succeeds renowned economist, late Dr. Saman Kelegama, who passed away in June this year. 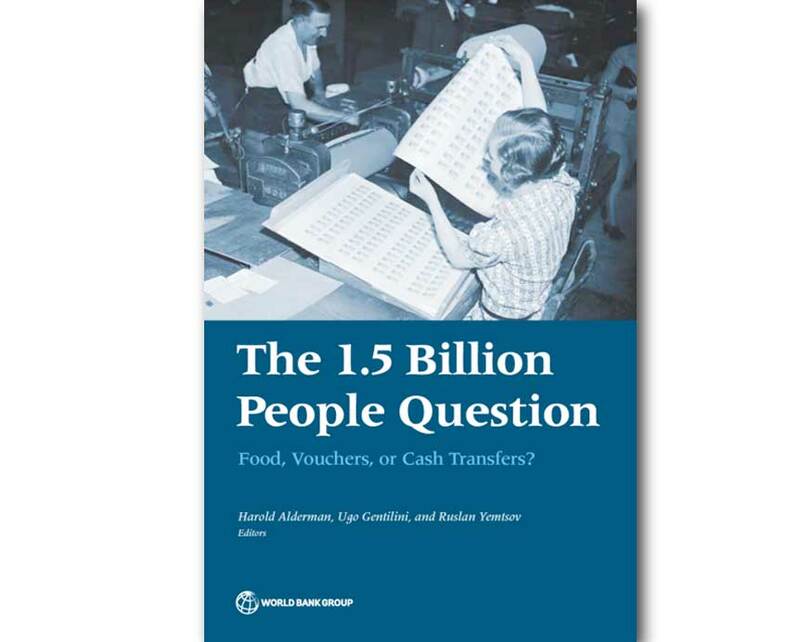 ‘‘Food-Based Social Assistance Programs in Sri Lanka: Evolution and Transition to Cash Transfers’, authored by IPS Research Fellow, Ganga Tilakaratna and IPS Research Officer, Chinthani Sooriyamudali, published in The 1.5 Billion People Question: Food, Vouchers, or Cash Transfers? traces the development of Sri Lanka’s food-oriented social assistance (FOSA) system. 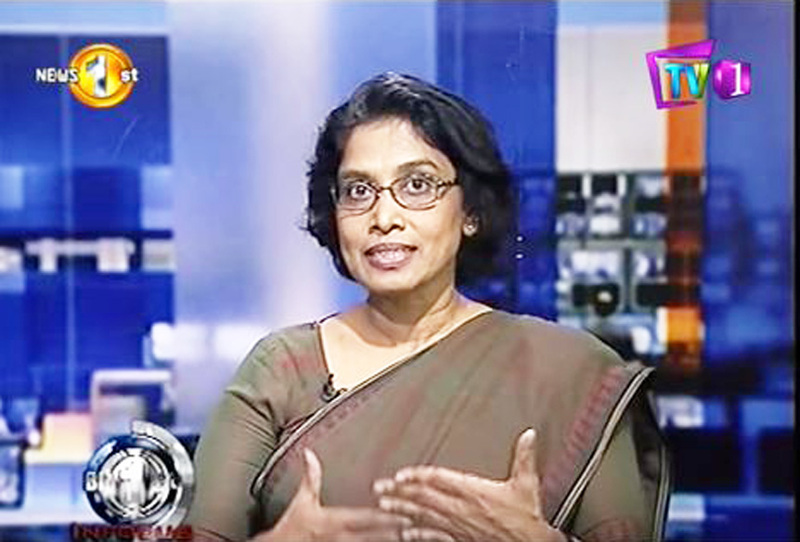 Speaking on Biz1st Infocus, broadcast over TV1 (formerly MTV Sports) on 17 October 2017, IPS Research Fellow, Nisha Arunatilake, discussed labour market inefficiencies that were holding back Sri Lanka’s growth. 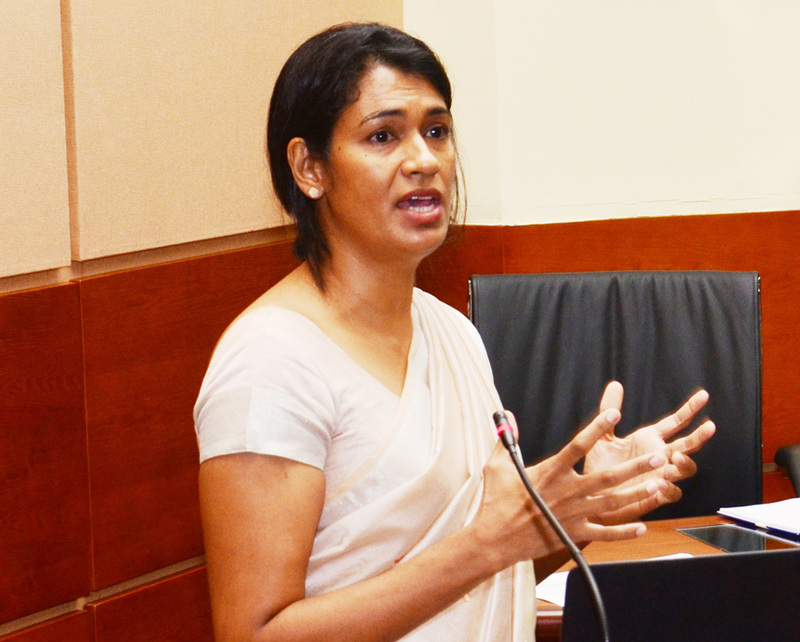 Sri Lankan industries continue to incur immense economic costs due to the country's inability to create skilled workers by making the necessary education reforms, IPS Research Fellow Dr. Nisha Arunatilake said, talking to Ceylon Today. 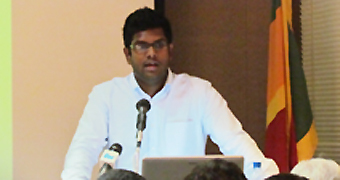 IPS Research Fellow, Manoj Thibbotuwawa, revealed that growing scarcity of land, property right issues, encroachment of state lands, land fragmentation, degradation of lands, and complex administrative and regulatory structures were the major policy challenges that affect the land health in Sri Lanka. 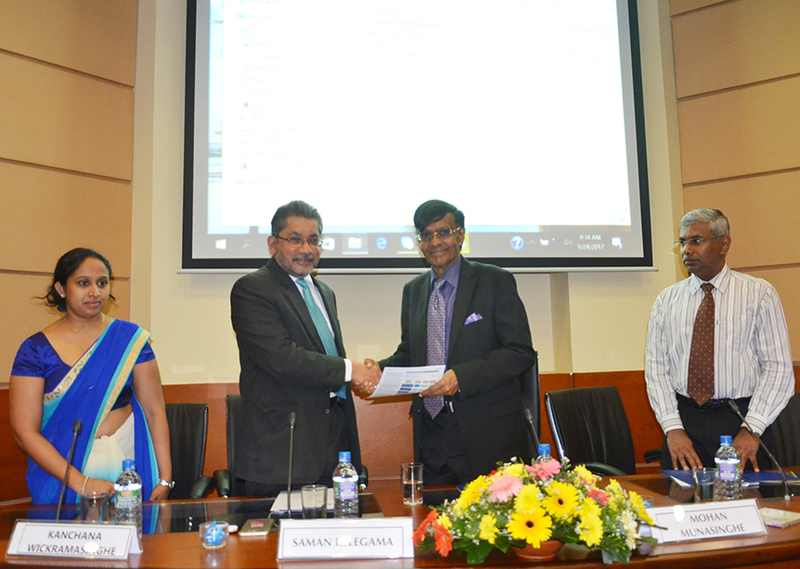 IPS launched its flagship report, ‘Sri Lanka: State of the Economy 2017’, on 10 October 2017 at the Dr. Saman Kelegama Auditorium. 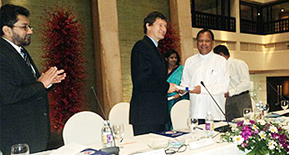 IPS Research Fellow, Janaka Wijayasiri, made a presentation at the National Forum on ‘Sri Lanka and GSP+: Ensuring Sustainable Supply Chains’, organized jointly by the Delegation of the European Union to Sri Lanka, the Foreign Trade Association (FTA) in Brussels, the European Chamber of Commerce in Sri Lanka, and the International Labour Organization (ILO), Sri Lanka. 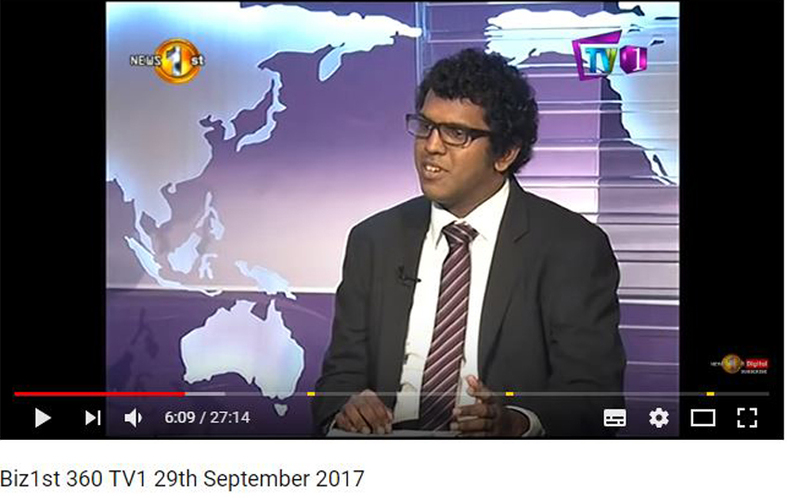 IPS Research Officer, Kithmina Hewage, was featured on Biz1st 360, broadcast over TV1 (formerly MTV Sports), on 29 September 2017. IPS on 25 September 2017 named its state-of-the-art auditorium as the ‘Dr. 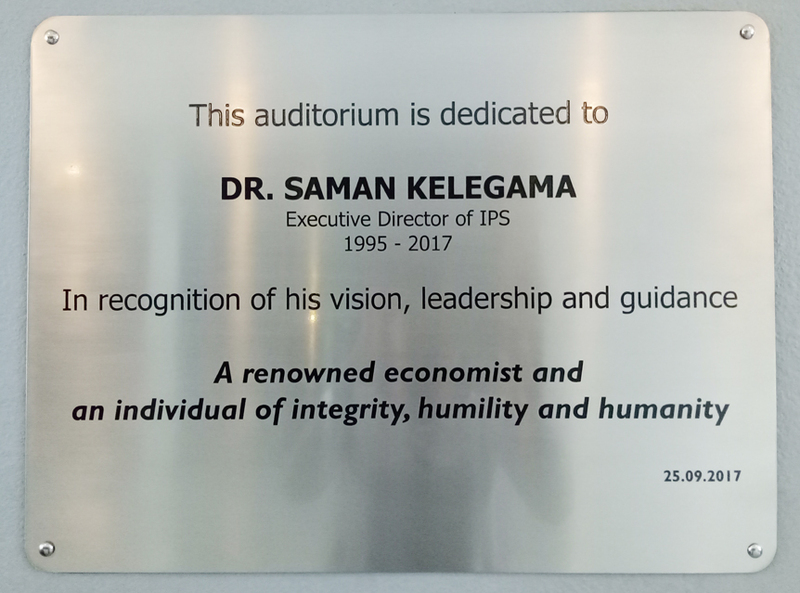 Saman Kelegama Auditorium’, dedicating it to its late Executive Director, in memory of his vision, leadership, and guidance to the IPS, especially in establishing the Institute’s Head Office at Independence Square. 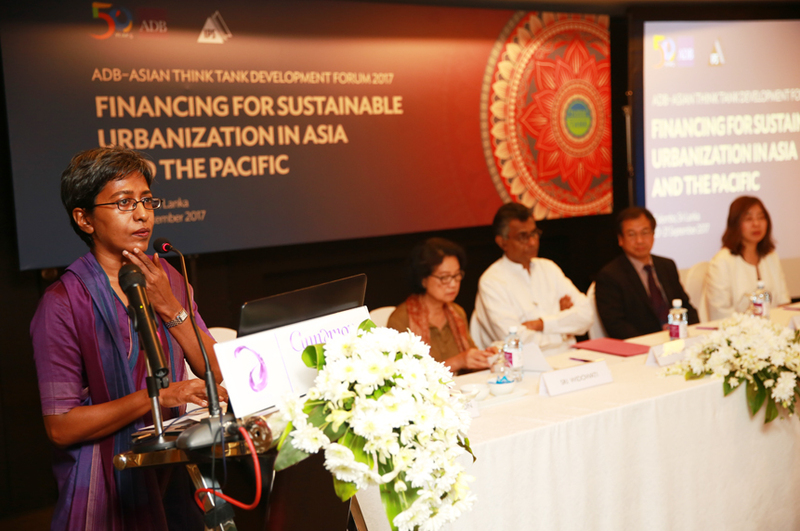 The fifth ADB-ATTN Development Forum 2017 was held in Colombo on 20 – 21 September 2017. The Forum, which saw the participation of more than 25 countries, was co-organized by the Asia Development Bank (ADB) and the IPS. 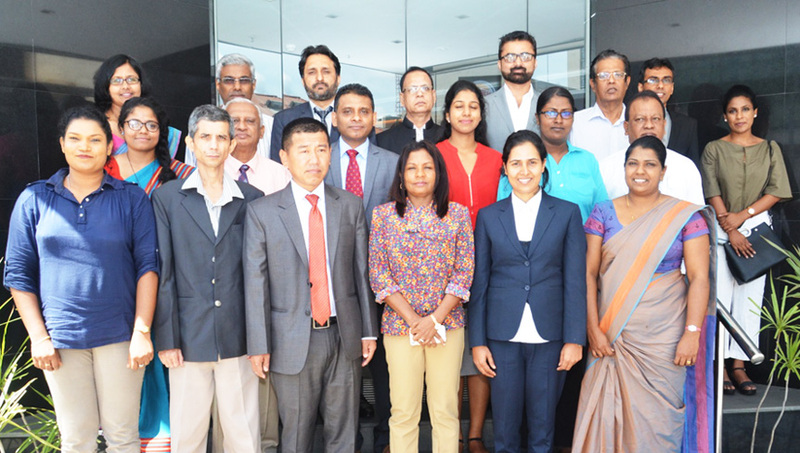 A workshop on ‘Export Promotion and Market Access for Agriculture and Food Products in Major Global Markets’, organized by the IPS in collaboration with the SAARC Agriculture Centre (SAC) was held on 19 – 21 September 2017. 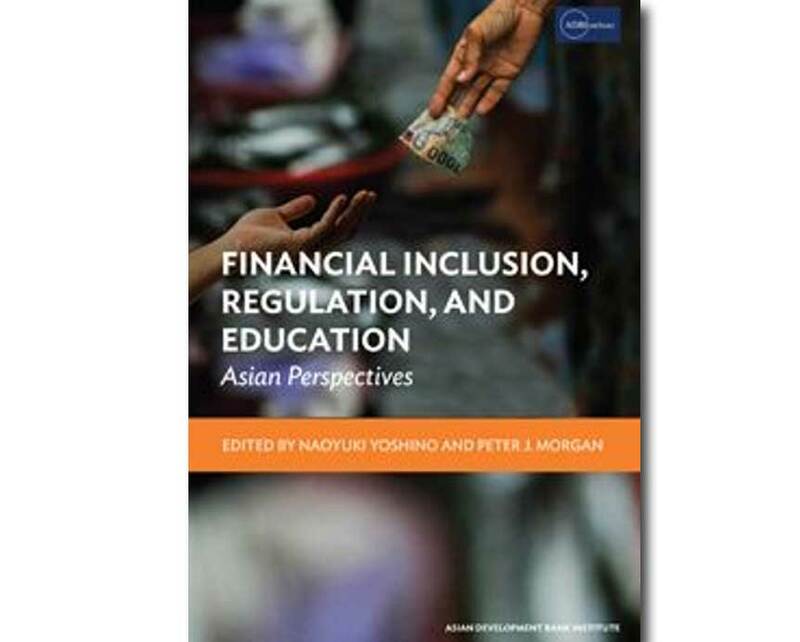 Financial Inclusion, Regulation, and Education: Asian Perspectives, published by the Asian Development Bank Institute, surveys the experience of some developed and Asian emerging economies to assess factors affecting the ability of low-income households and small firms to access financial services. 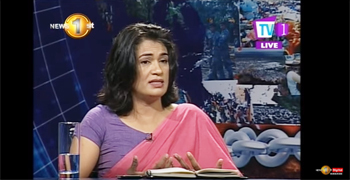 IPS Research Fellow, Bilesha Weeraratne, discussed a wide range of issues related to migration and policy recommendations to safeguard the rights of migrant workers on ‘Face the Nation’ (FTN). 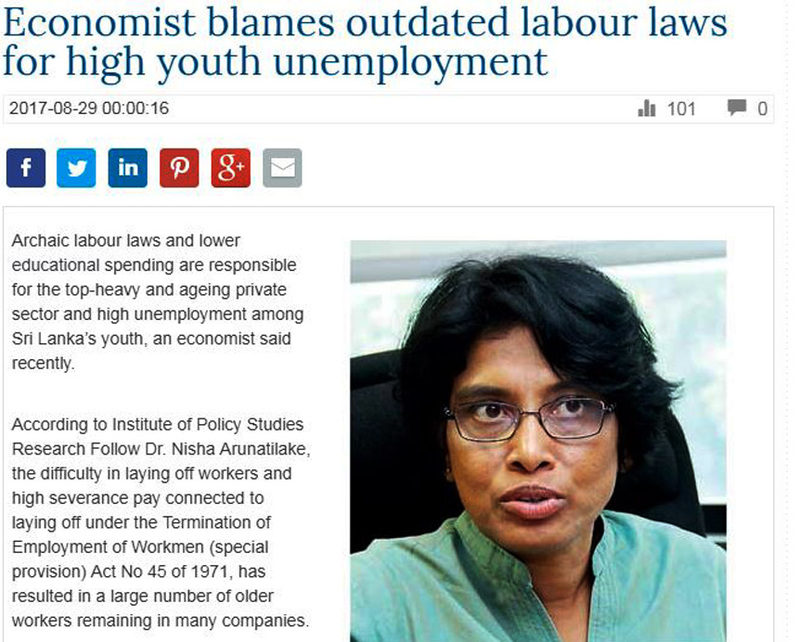 In an interview with the Daily Mirror, IPS Research Fellow, Dr. Nisha Arunatilake, highlighted labour market inefficiencies in Sri Lanka and their causes. 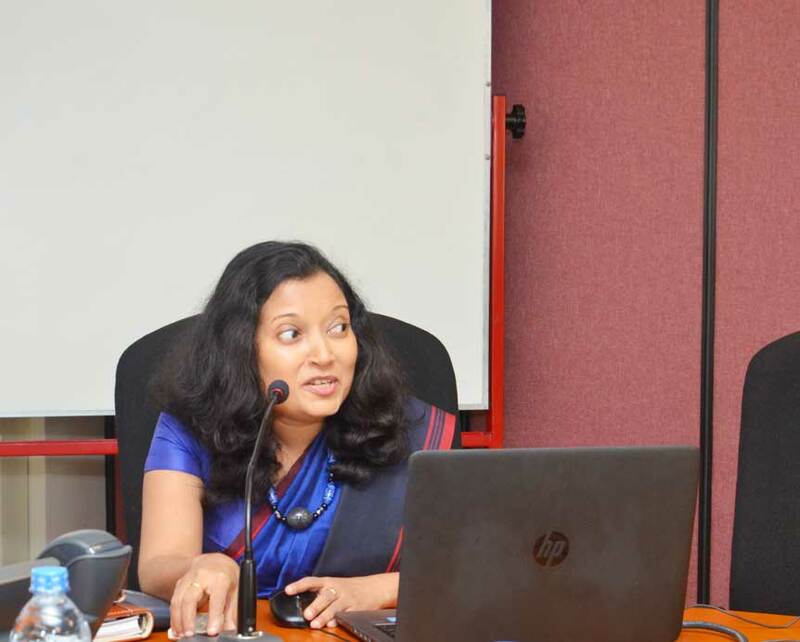 IPS Research Fellow, Dr. Bilesha Weeraratne made a presentation at the National Multi-Stakeholder Consultation on Global Compact on Safe, Orderly and Regular Migration, organized by International Organization for Migration (IOM) and the Ministry of Foreign Employment. 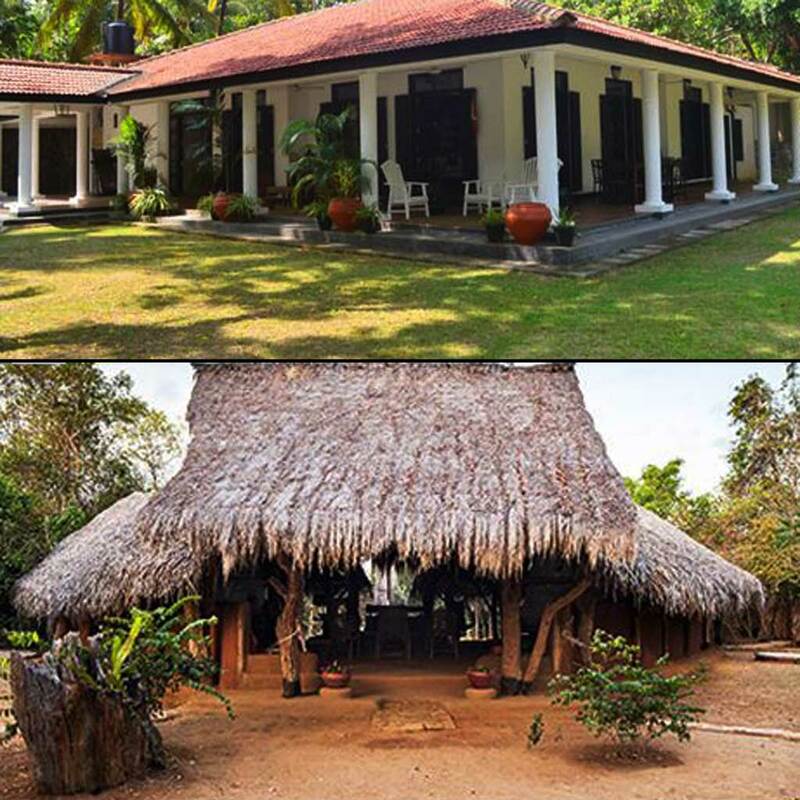 Living Wage for the Estate Sector of Sri Lanka: Is it Sufficient? A Stakeholder Validation Workshop, organized by the IPS, Global Living Wage Coalition (GLWC), and Fairtrade International (FLO) was held on 24 August 2017 at the IPS Auditorium, with the participation of a wide range of stakeholders. 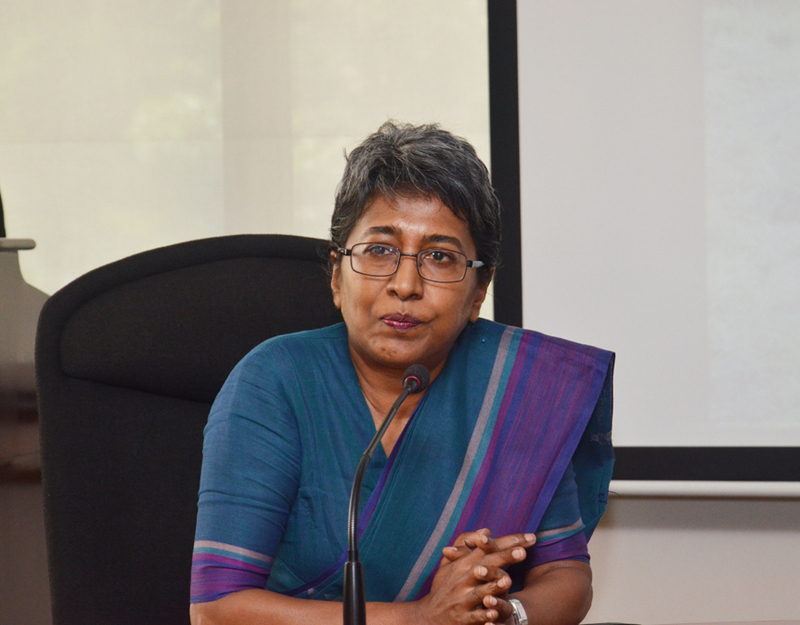 Recently, IPS Research Fellow Dr. Nisha Arunatilake sat down with the Daily Mirror to discuss recent trends and challenges in the Sri Lankan labour market. Highlighting the importance of Global Compact on Migration, IPS Research Fellow, Bilesha Weeraratne, recently noted that this mechanism offers the international community an opportunity to contribute to global migration governance. 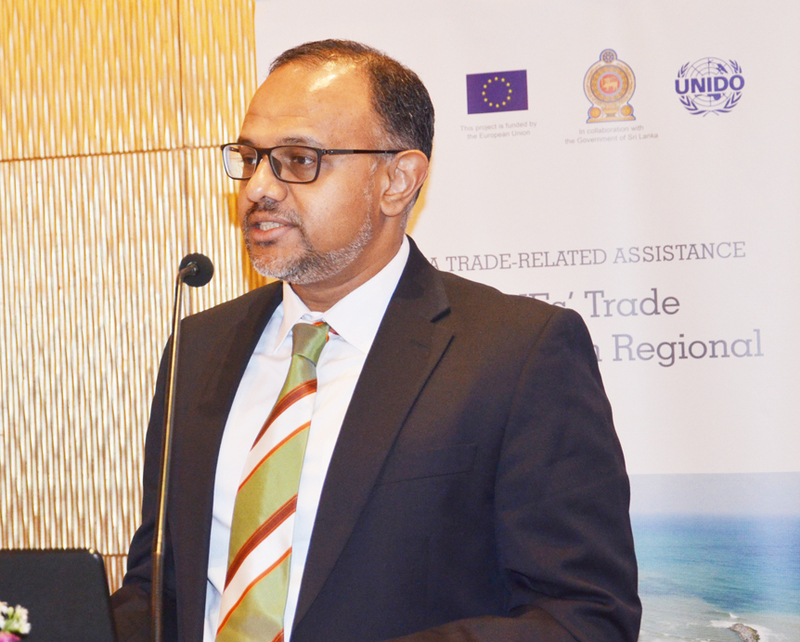 Speaking on the recently reinstated Generalized Scheme of Preferences (GSP) Plus facility, IPS Research Fellow, Janaka Wijayasiri, noted that Sri Lanka’s overall exports to the European Union (EU) can increase by US$ 480 million. 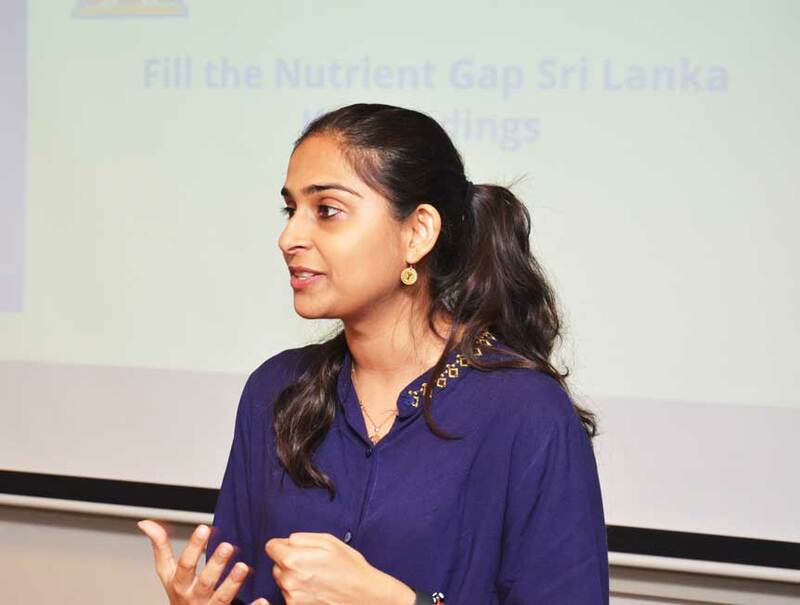 IPS Research Assistant, Yolanthika Ellepola, recently noted that there has been concerted political commitment towards Sustainable Development Goals (SDGs) in the health sector, especially in the aspect of nutrition, in Sri Lanka. 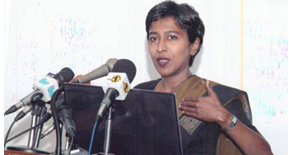 IPS Acting Executive Director, Dr. Dushni Weerakoon, recently pointed out that Sri Lanka has no option but to integrate into the global economy as the country has exhausted potential for debt financed growth. 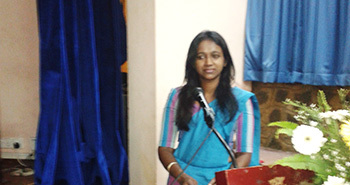 IPS Research Fellow, Bilesha Weeraratne, recently spoke on the importance of migrant families in Sri Lanka. IPS Research Fellow, Janaka Wijayasiri, attended a three-day workshop on Monitoring, Evaluation, Accountability and Learning (MEAL) from 18 – 20 July 2017. Why do Older Workers Chose to Participate in a Different Livelihood? In Sri Lanka, having a wide array of career options to choose from is only possible in urbanized cities, while job opportunities in less developed districts are limited only to the public sector. Protectionist trade and investment policies serve only special interests and hurt long term growth of an economy, IPS Research Officer, Kithmina Hewage, argued recently. In 2015, 45% of students failed or only conditionally passed O-Level Examinations. In this context, improving students’ performance at this milestone examination is imperative. 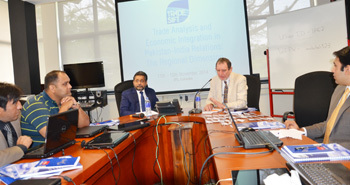 Research Assistant Vishvanathan Subramaniam recently noted that Sri Lanka’s economic growth has been lagging and its trade deficit was increasing at an alarming rate. 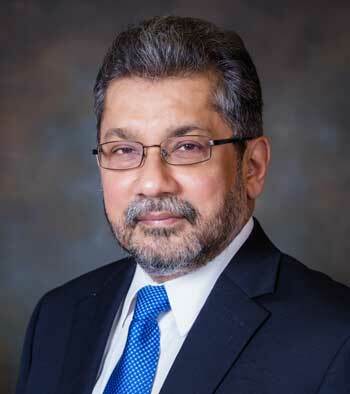 It is with deep sadness that we, the members of IPS’s governing board, received the news of the sudden passing of the Institute’s executive director, Dr. Saman Kelegama. 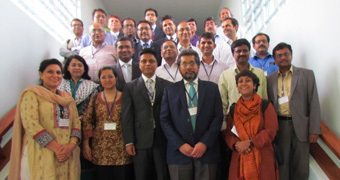 IPS Research Assistant, Nuwanthi Senaratne, attended the training programme on International Trade Theory and Practice, organized by the EXIM Bank of India and the Research and Information System for Developing Countries (RIS), held in New Delhi, India, from 19 – 24 June 2017. 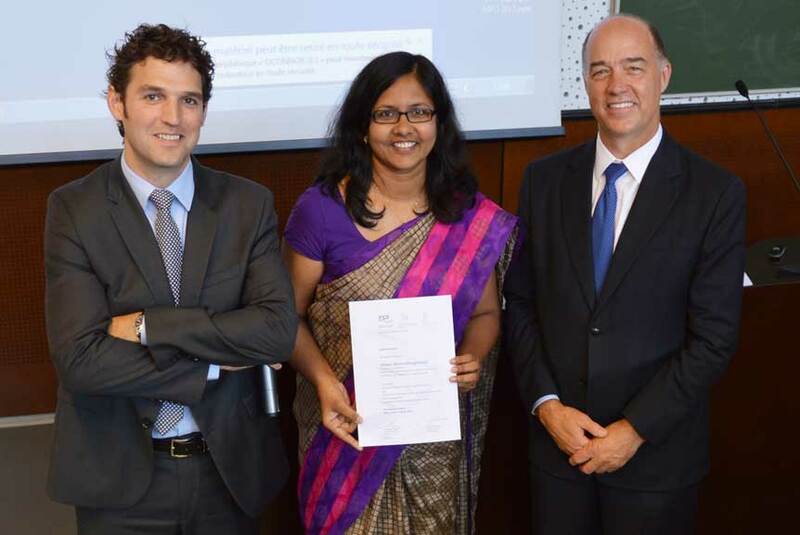 IPS Research Officer, Dilani Hirimuthugodage, participated at a Fellowship Programme on “Advanced Training Course on Intellectual Property, Technology Transfer and Licensing” from 12 June 2017 to 23 June 2017 in Strasbourg, France. 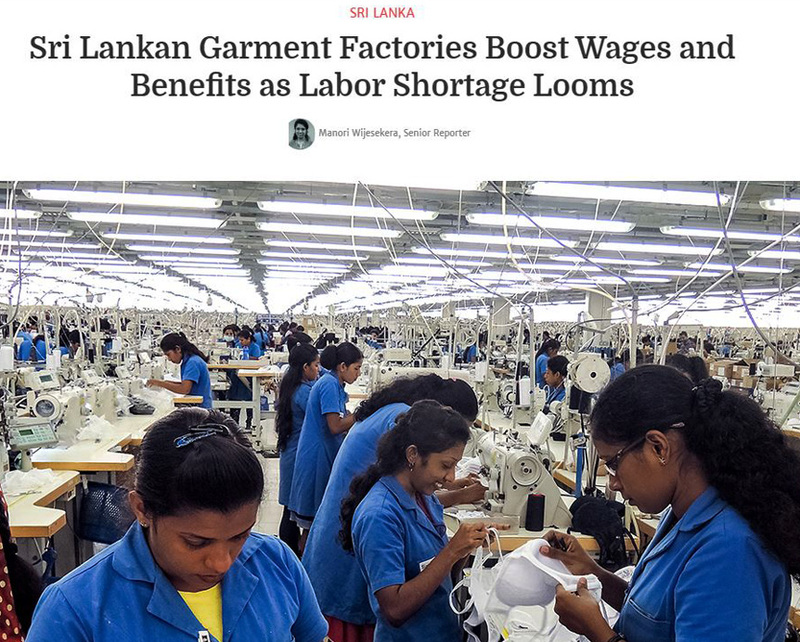 IPS Research Assistant, Vishvanathan Subramaniam, recently argued that Sri Lanka has failed to maximize benefits of outward oriented manufacturing due to inconsistent policy reforms, and a prolonged dependency on a labor and resource intensive portfolio of exports. 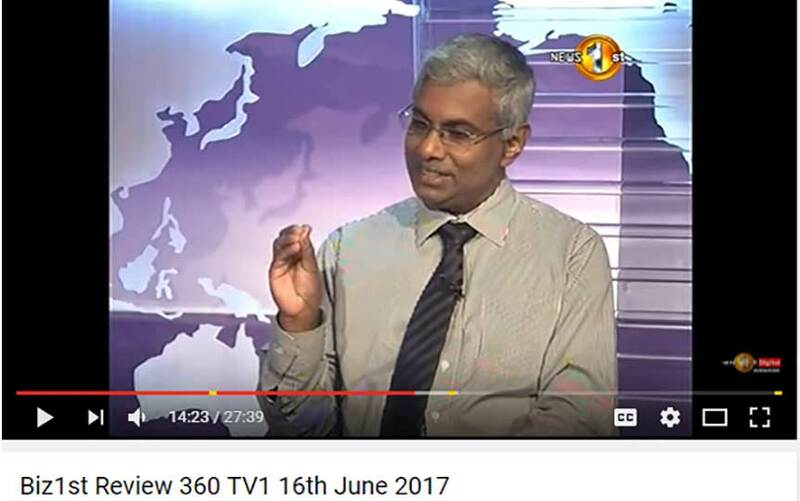 IPS Research Fellow Dr. Athula Senaratne was featured on the Biz1st Review 360 (MTV News1st) show on 16 June 2017. 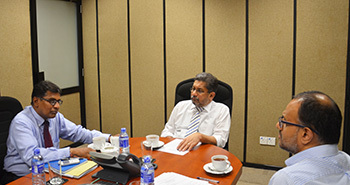 During the interview, he shared his expertise on the concept of Blue Economy and how Sri Lanka can benefit from it. Highlighting the need for engaging think tanks and other NGOs to make China’s Belt and Road Initiative more inclusive, IPS Research Fellow, Dr. Ganga Tilakaratna noted that think tanks in particular can play an important role in minimizing the information gaps, and creating knowledge and awareness of the objectives and benefits of this initiative at all levels. 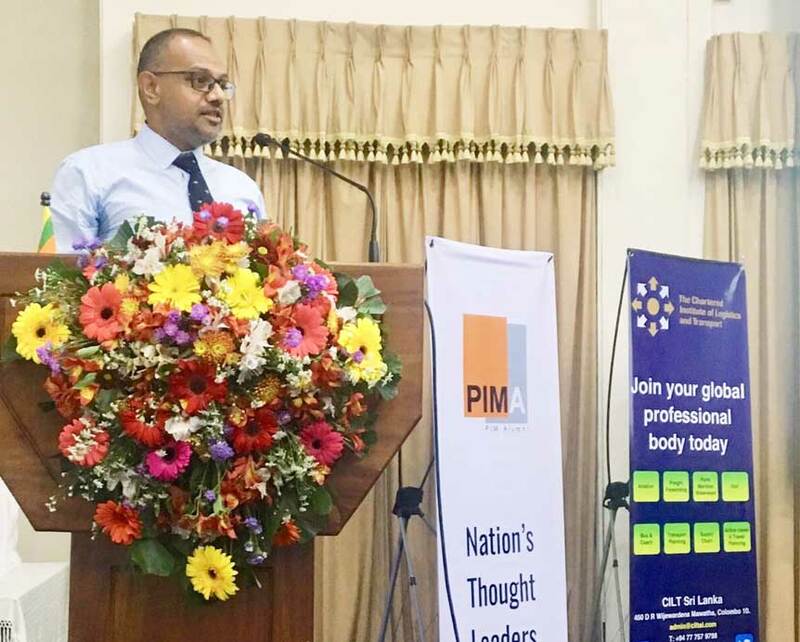 IPS Research Fellow, Janaka Wijayasiri, made a presentation at the Management Conference of MBA Alumni Association, University of Colombo and Daily FT on “Growing with Giants”, on 14 June 2017, in Colombo. Chairman of IPS, Dr. Razeen Sally, took part in the ensuring panel discussion on Sri Lanka-China Economic Cooperation, Trade and Bilateral Agreements. 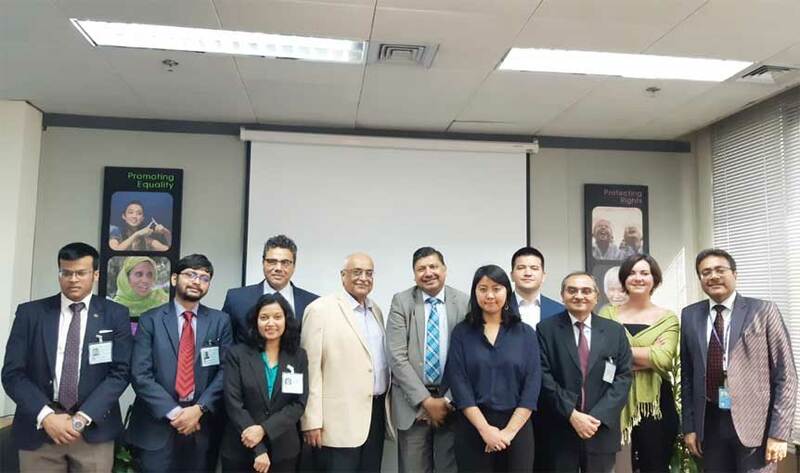 A team of investors from the Asia and Pacific region met IPS Executive Director, Dr. Saman Kelegama, and Research Officer, Kithmina Hewage, on 17 May 2017, at the IPS. 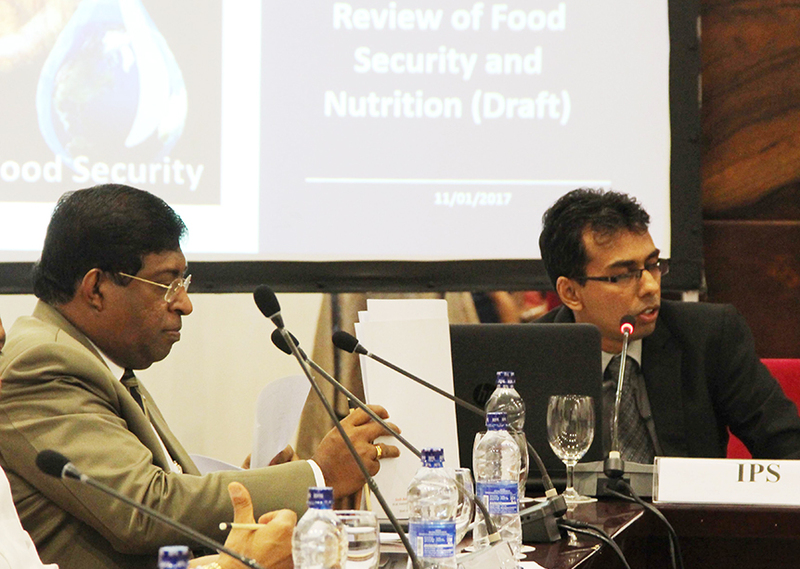 A Workshop on the topic ‘Emerging Food Safety and Quality Risks in South Asia: Challenges and Opportunities for Sri Lanka’, organized by the Ministry of Primary Industries and IPS in collaboration with the International Food Policy Research Institute was held on 8-9 May 2017. 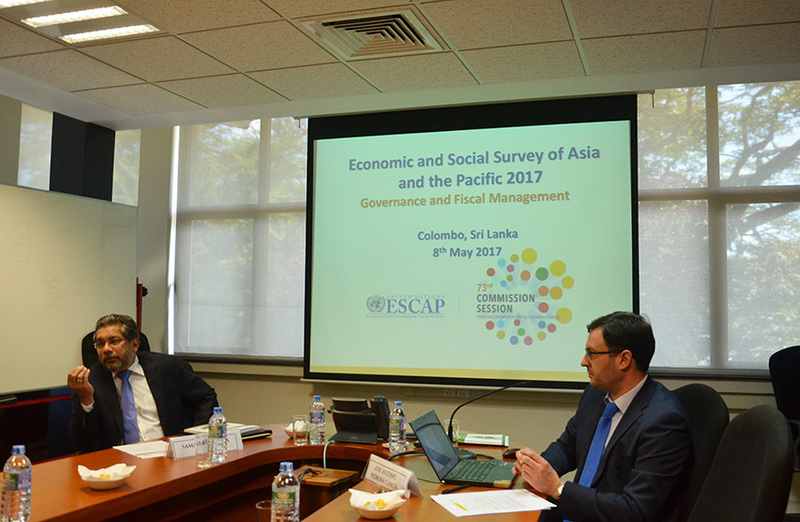 A Policy Dialogue on the ESCAP Economic and Social Survey for Asia Pacific 2017 was held at IPS on 08 May 2017. 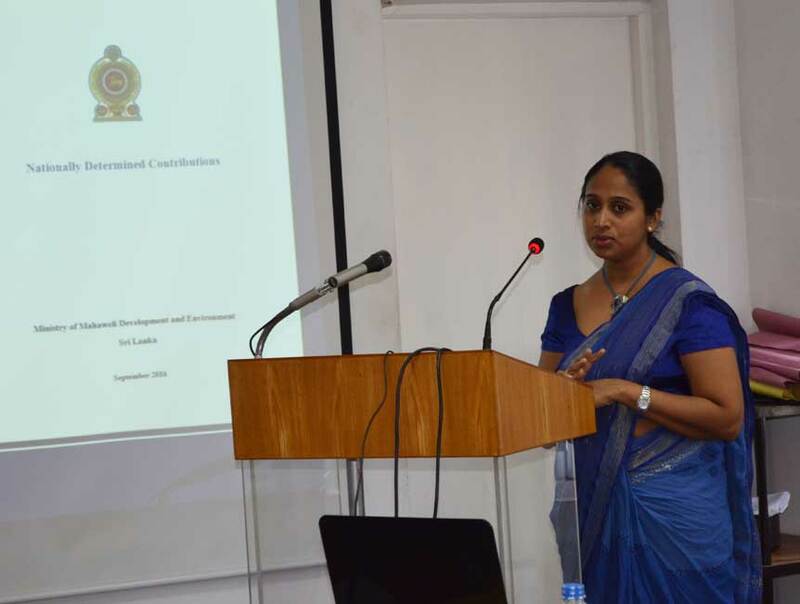 IPS Research Officer, Dilani Hirimuthugodage, made a presentation on “Role of Intellectual Property Rights (IPRs) in Promoting Ecotourism in Sri Lanka” at the 6th International Conference of Sabaragamuwa University of Sri Lanka. 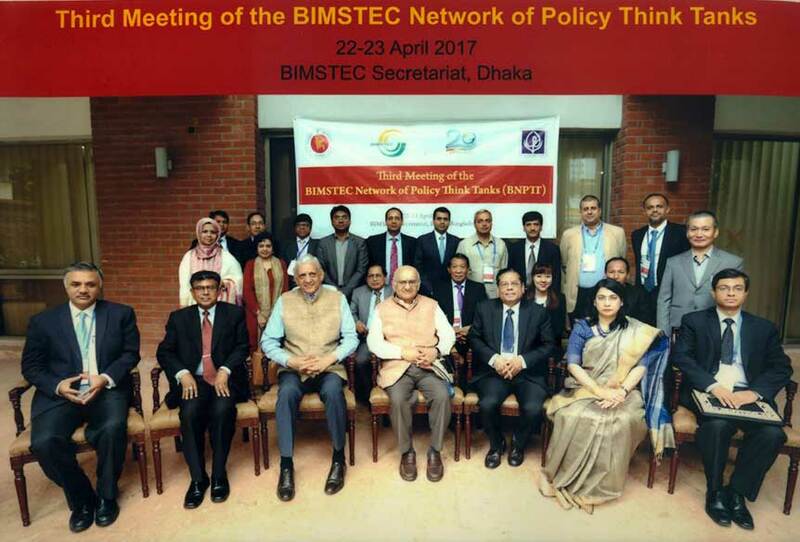 IPS Research Fellow, Dr. Janaka Wijayasiri, participated in the Third Meeting of the BIMSTEC Network of Policy Think Tanks (BNPTT) held at the BIMSTEC Secretariat, Dhaka, Bangladesh on 22-23 April 2017. 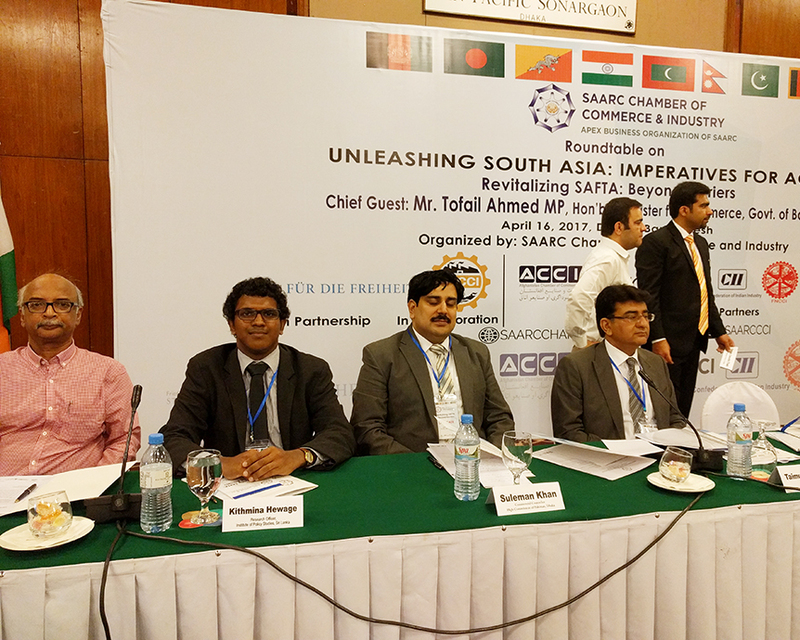 IPS Research Officer Kithmina Hewage participated as a panelist at the Roundtable on Revitalising SAARC, organized by the SAARC Chamber of Commerce and Industry (SAARC CCI), on 16 April 2017, in Dhaka, Bangladesh. 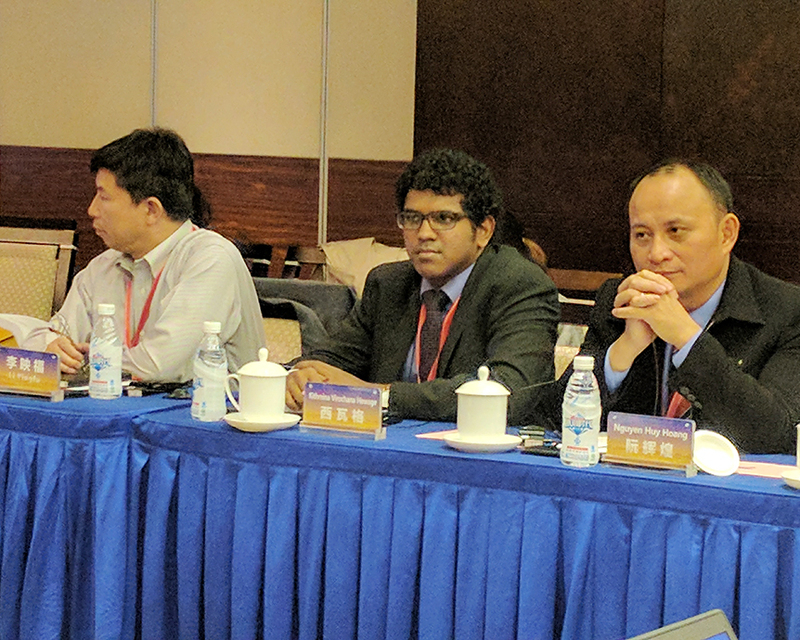 IPS Research Officer Kithmina Hewage made a presentation titled China’s Silk Road in a Changing Global Order at the Symposium on the Land of Abundance and the Silk Road held on 7-8 April 2017 in Chengdu, China. IPS Research Fellow, Dr. Athula Senaratne participated at the Punjab Economic Forum as a panelist, held on 3-4 April 2017 in Lahore, Pakistan. 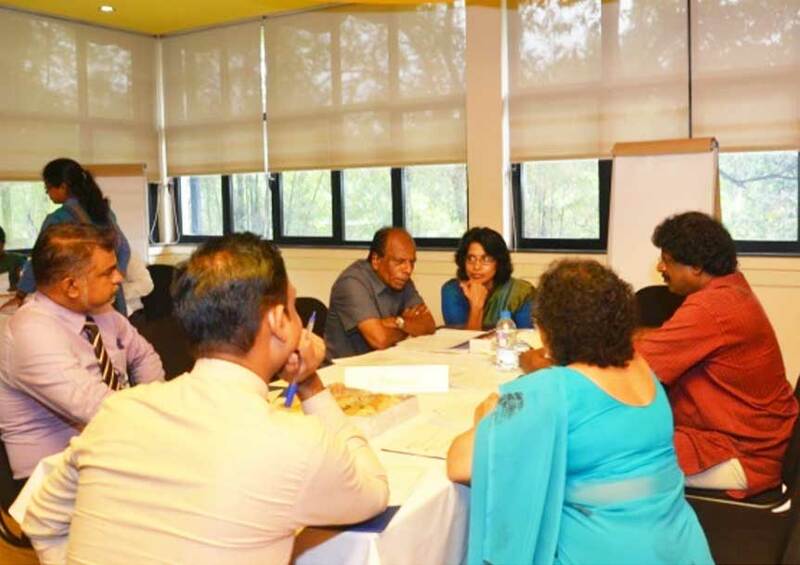 To assist Millennium Challenge Corporation (MCC) to identify issues faced by investors with regard to access to commercially-viable land, IPS recently held a roundtable discussion on land use policy in Sri Lanka. IPS Research Fellow, Dr. Ganga Tilakaratna made a presentation on ‘Financial access is NOT Financial Inclusion: Current Status and Issues of Financial Inclusion in Sri Lanka’ at the 9th BankTech Asia Conference organized by the Knowledge Group of Companies, Malaysia , held at Taj Samudra Hotel, Colombo on 21-22 March 2017. 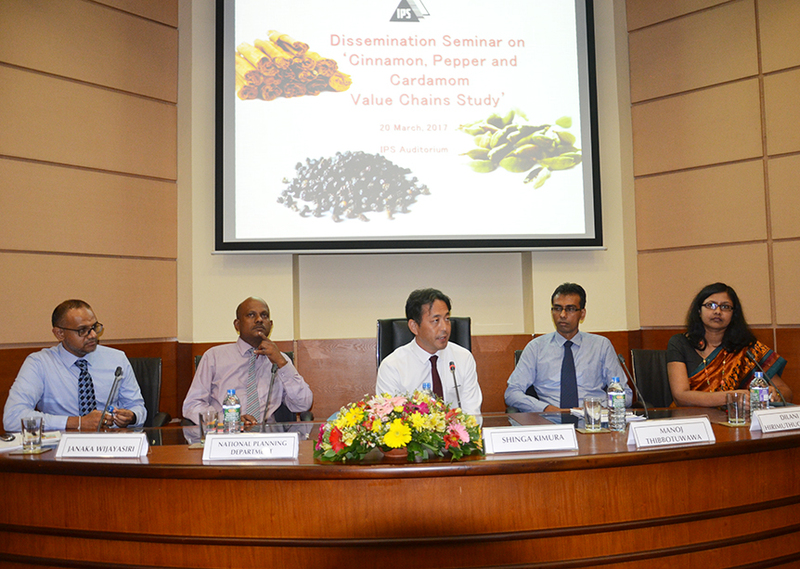 As part of the Japan International Cooperation Agency (JICA) and IPS project, IPS recently conducted a dissemination seminar on ‘Cinnamon, Pepper and Cardamom Value Chains Study’ at the IPS Auditorium. To mark the World Consumer Rights Day, IPS held a forum, centered on the theme ‘Consumer Rights in the Digital Age’ on 15 March 2017 in the IPS Auditorium, with the participation of experts in the field, digital consumers, entrepreneurs and stakeholders. 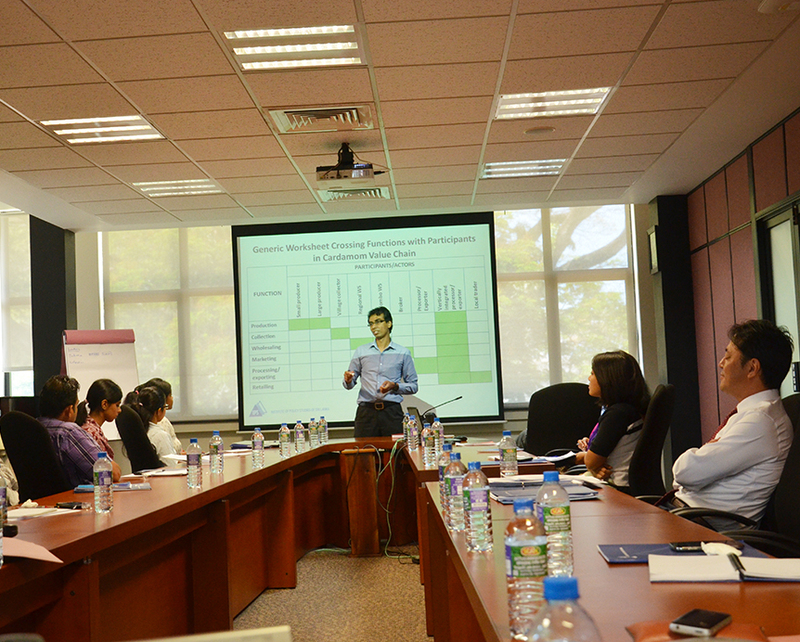 As part of the Japan International Cooperation Agency (JICA) and IPS Value Chains study on the spice industry in Sri Lanka, IPS conducted a training programmeon Value Chain Analysis (VCA) for government officials and stakeholders on 13 March 2017 at the IPS premises. 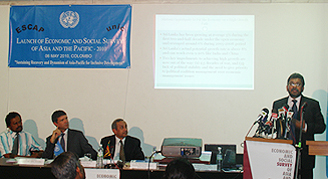 IPS Research Fellow, Dr. Ganga Tilakaratna made a presentation on ‘Income Security for Older Persons in Sri Lanka’ at the symposium on 'Old-Age Income Security and Universal Basic Income in South Asia', organized by the United Nations Economic and Social Commission for Asia and the Pacific (UNESCAP) and the National Institute of Public Finance and Policy, India, held in New Delhi, India on 27 February 2017. 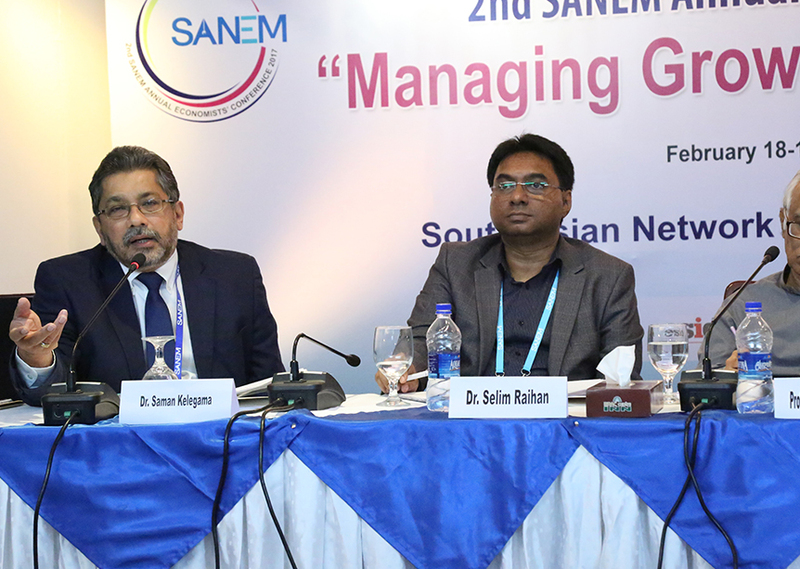 IPS Executive Director, Dr. Saman Kelegama, participated at the South Asia Network on Economic Modeling (SANEM)’s Second Annual Economists’ Conference on “Managing Growth for Social Inclusion” which was held on 18-19th February 2017 at the BRAC Centre Inn Auditorium in Mohakhali, Dhaka, Bangladesh. 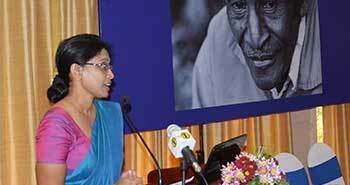 The National Strategic Review on Food and Nutrition Security-Towards Zero Hunger was launched in Colombo, by Former President Chandrika Bandaranaike Kumaratunga, Chairperson of the South Asia Policy and Research Institute in the presence of United Nations World Food Programme, Executive Director, Ertharin Cousin, on Monday 13th of February 2017. H.E. Mr. S. Chandra Das, the High Commissioner of Singapore to Sri Lanka made a courtesy call at the IPS on 6th February 2017. 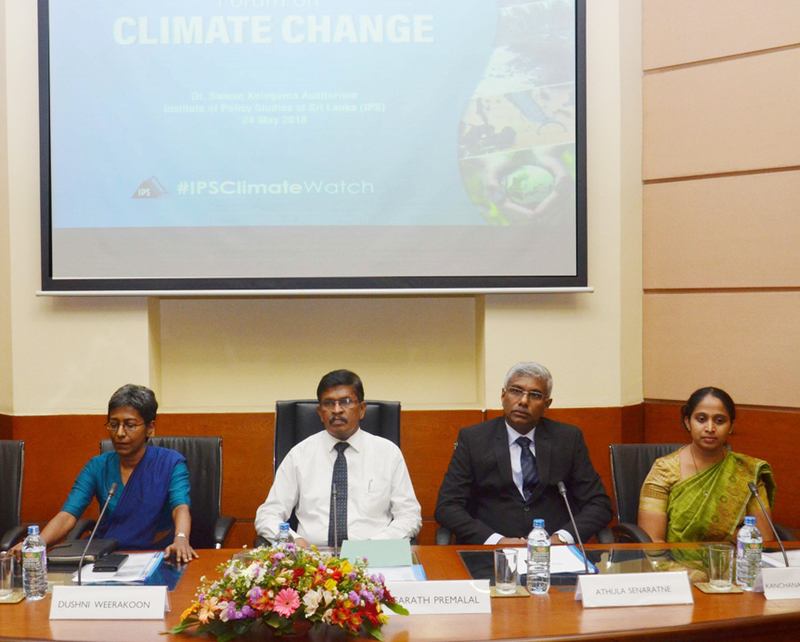 The IPS organized a workshop to disseminate the findings of a study titled ‘Climate Insurance for Dry Zone Farmers in Sri Lanka’ at the IPS Auditorium on the 24th of January 2017. 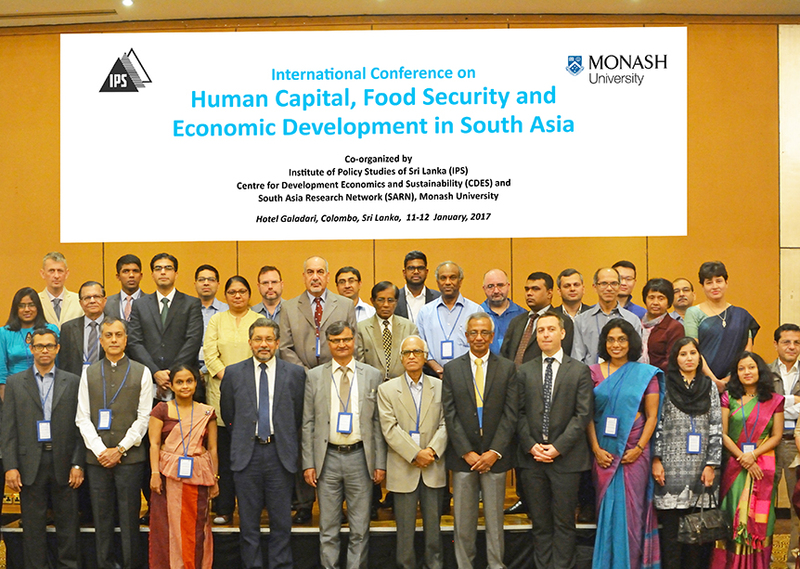 IPS in collaboration with the Centre of Development Economics and Sustainability (CDES), and the South Asia Research Network (SARN), Monash University, Australia, organized a conference on “Human Capital, Food Security and Economic Development in South Asia” from 11-12th January, 2017 in Colombo. 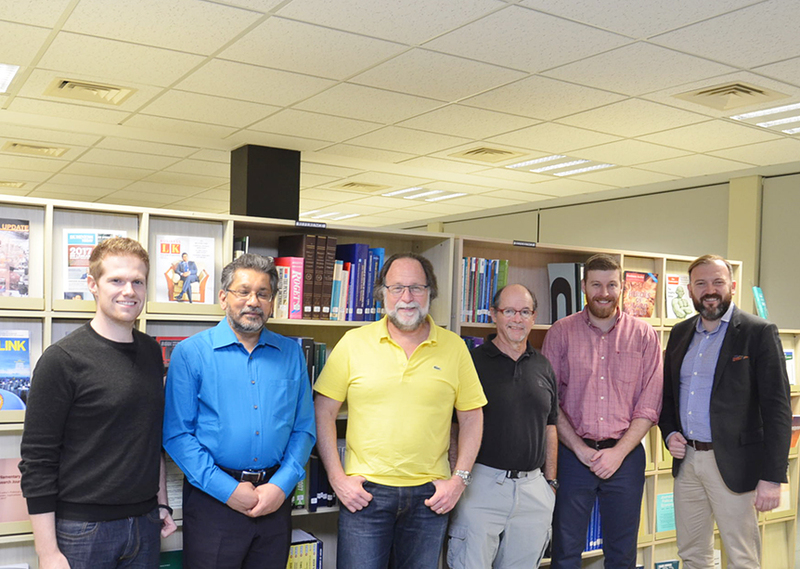 Professor Ricardo Hausmann Director of the Center for International Development (CID) and a Professor of the Practice of Economic Development at the John F. Kennedy School of Government at Harvard University, USA visited the IPS Library with his team from the CID on 11th January. 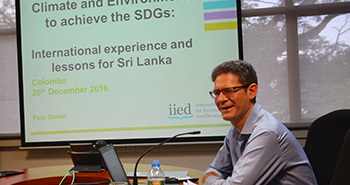 Dr. Paul Steel, Chief Economist at the International Institute for Environment and Development (IIED) spoke on “Integrating Climate and Natural Resource Management into the Budget Process” at an IPS in-house seminar. 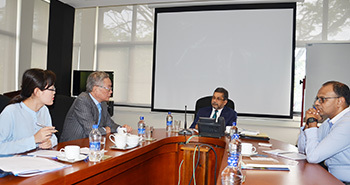 A delegation from the China Development Institute (CDI), a think tank based in Shenzhen, Guangdong Province, visited the IPS and met with Dr. Saman Kelegama, Executive Director and Dr. Janaka Wijayasiri, Head of the International Economic Unit of the IPS. 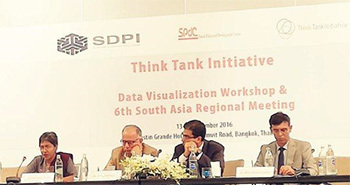 The Data Visualization Workshop was held during 13th December, while the TTI 6th Regional Meeting was held during 14 – 15th December. 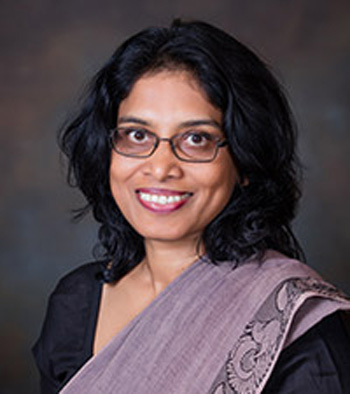 IPS Deputy Director,Dr. 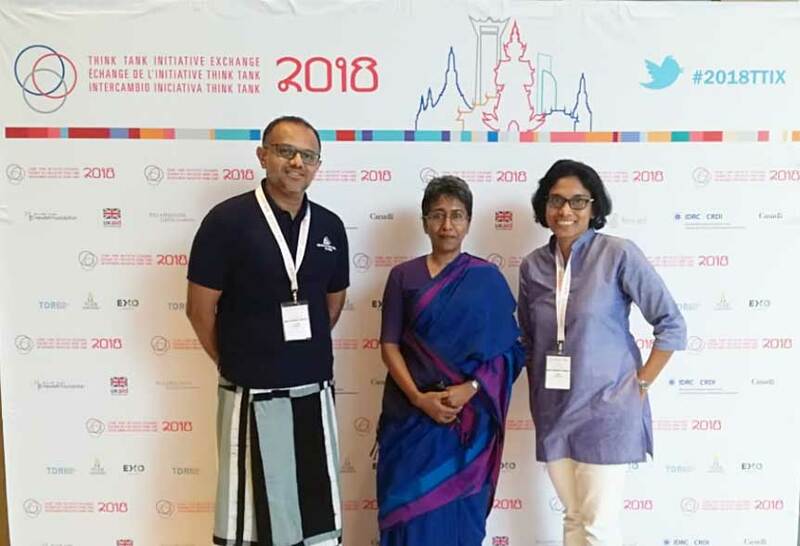 Dushni Weerakoon, Research Fellows, Dr. Ganga Tilakaratna, Dr. Janaka Wijayasiri and Charmaine Wijesinghe, Manager Publications and Events, participated at both events. 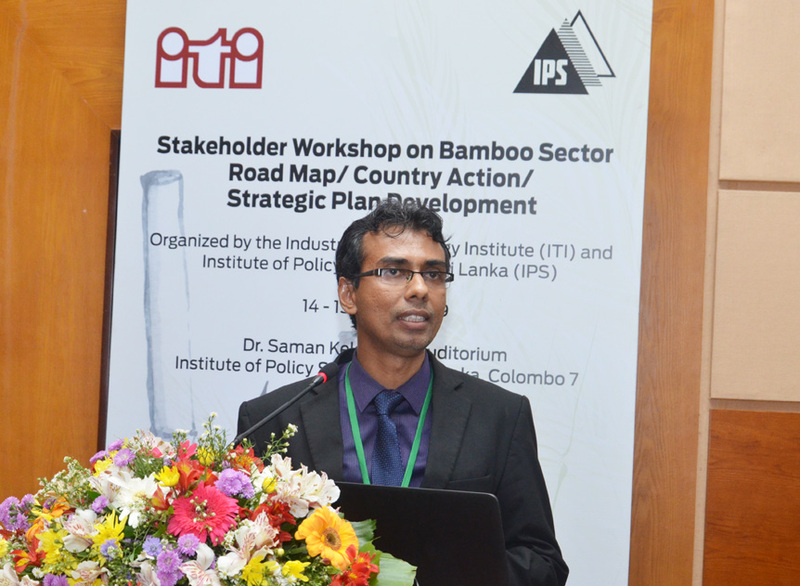 IPS Executive Director, Dr. Saman Kelegama delivered the key note address at the 10th Annual Research Forum of the Sri Lanka Agricultural Economics Association (SAEA) organized by the SAEA together in partnership with the IPS was held at the IPS Auditorium on 8th December 2016. A Felicitation Event in Honour of prominent economist Prof. Premachandra Athukorala was held at the IPS on 6th December 2016. 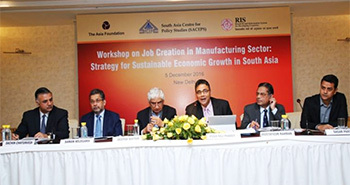 IPS Executive Director, Dr. Saman Kelegama and Research Assistant, Vishvanathan Subramaniam participated in a workshop on “Job Creation in Manufacturing Sector: Strategy for Sustainable Economic Growth in South Asia” held in New Delhi on the 5th of December. 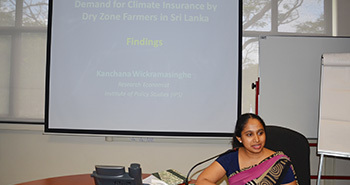 IPS Research Economist, Kanchana Wickramasinghe, made a presentation on “Protecting Farmers from Climate-induced Risks: An Assessment of Crop Insurance in Sri Lanka” at the academic pre-conference organized by the Center for the Economic Analysis of Risk (CEAR) of the Georgia State University. 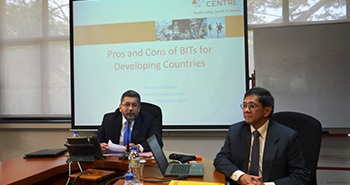 A seminar on Pros and Cons of Bilateral International Investment Treaties for Developing Countries was conducted by Dr. Manual Montes, Senior Advisor on Finance & Development, South Centre, Geneva at the IPS Premises. A delegation consisting of academics from the Peking University, and officials attached to the Department of Asian Affairs, Ministry of Foreign Affairs of China visited the IPS. 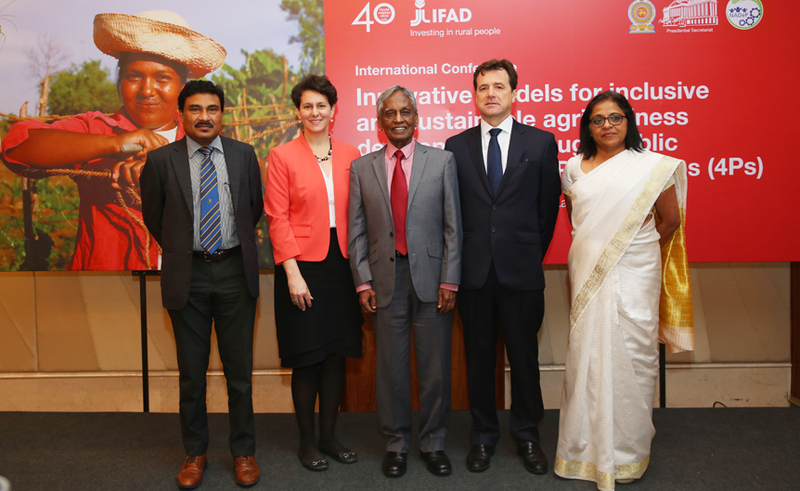 IPS together with the National Science Foundation (NSF) and the Sri Lanka Agricultural Economics Association (SLAEA) organized a two-day workshop to discuss policy options on food security in Sri Lanka. A National Workshop on Capacity Building on Trade Policy Analysis organized by the Economic and Social Commission for Asia and the Pacific (ESCAP) together with IPS was held at the IPS Conference Room during 24-25 October 2016. 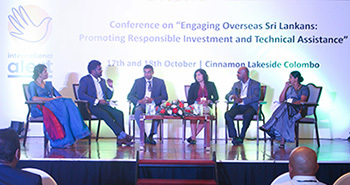 IPS Research Fellow, Bilesha Weeraratne was a panelist at the discussion on “Leveraging opportunities for responsible investment by overseas Sri Lankans through new models for investment & entrepreneurship” at the two-day closed door discussion on “Engaging Overseas Sri Lankans: Promoting Responsible Investment and Technical Assistance” organized by International Alert. 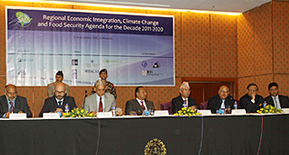 The 9th South Asian Economic Summit (SAES9) was held in Bangladesh under the theme – “Reimagining South Asia in 2030”, with the objective of advancing the cause of regional integration in South Asia through discussion and reflections by stakeholders on key issues of interest and concern to countries and people of the region. 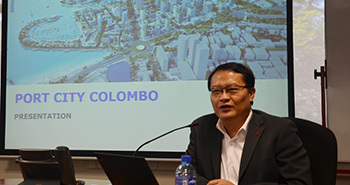 The Chief Sales and Marketing Officer, CHEC Port City Colombo (PVT) Ltd., Liang Thow Ming, provided an overview of the Colombo Port City Project, at the IPS Conference Room. 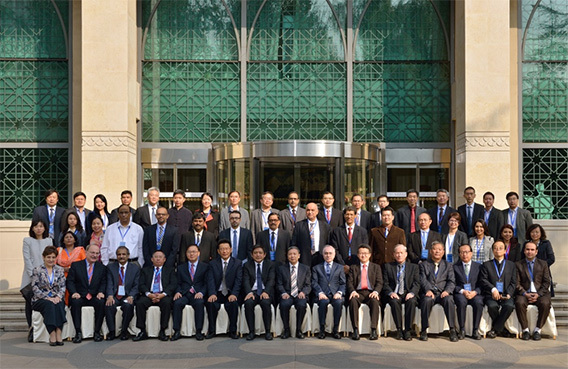 IPS Research Fellow, Janaka Wijayasiri, attended an international seminar on “The One Belt and One Road Initiative From a Global Perspective” in Beijing, China during 10-11 October 2016. 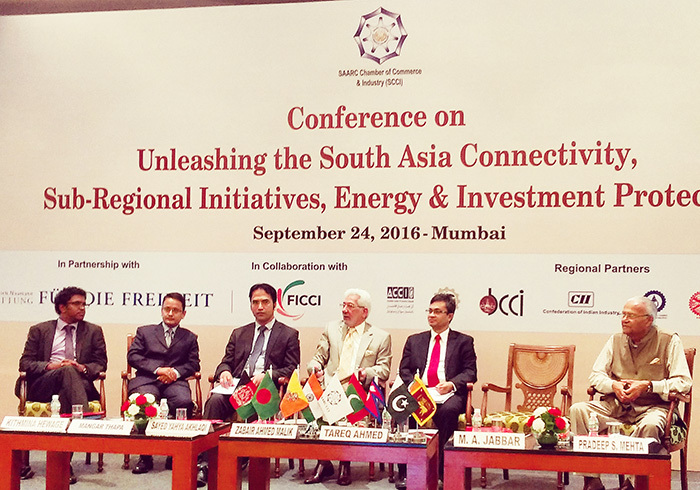 The SAARC Chamber of Commerce and Industry (SCCI) organized a conference on “Unleashing South Asia: Connectivity, sub regional initiatives, energy and investment protection” on the 24th of September in Mumbai, India. 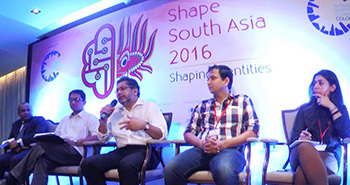 Shape South Asia 2016, organized by the Global Shapers Colombo Hub was held in Colombo in September 2016, under the theme “Shaping Identities”. 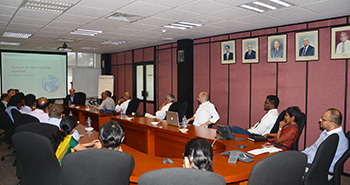 A stakeholder meeting was held at the IPS Conference Room, on 13th September 2016, to disseminate the findings of the IPS study on Demand for Climate Insurance by Dry Zone Farmers in Sri Lanka, funded by the Global Development Network (GDN). 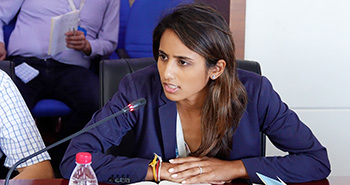 IPS Research Assistant, Chantal Sirisena attended a month-long seminar at the Chinese Academy of Social Sciences where she presented Sri Lanka’s progress on infrastructure development and relationship with China’s One Belt One Road Initiative, held in Beijing during 18th – 20th August. 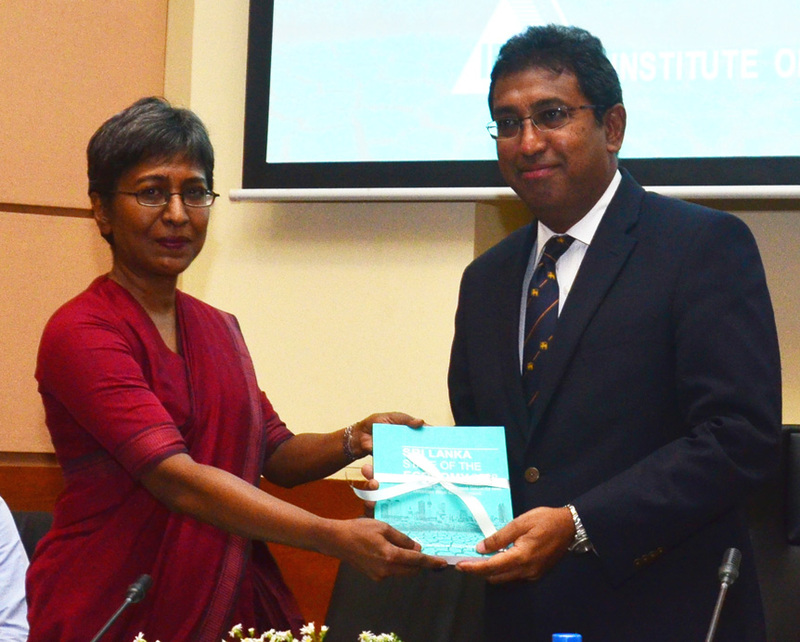 IPS Research Fellow, Bilesha Weeraratne, handed over a copy of the recent IPS Publication "Re-Defining Urban Areas in Sri Lanka", to Hon. 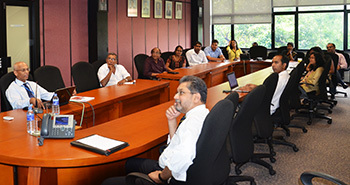 Patali Champaka Ranawaka, Minister of Megapolis and Western Region Development at his office in Colombo, on August 19, 2016. 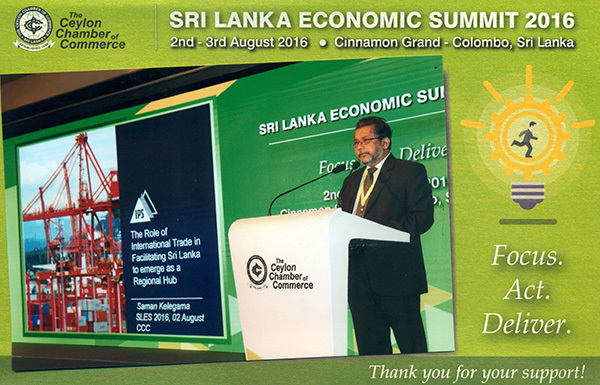 IPS Executive Director, Dr. Saman Kelegama made a presentation on “The Role of International Trade in Facilitating Sri Lanka to Emerge as a Regional Hub”, at the Sri Lanka Economic Summit (SLES) 2016, held in Colombo during 2 – 3 August. 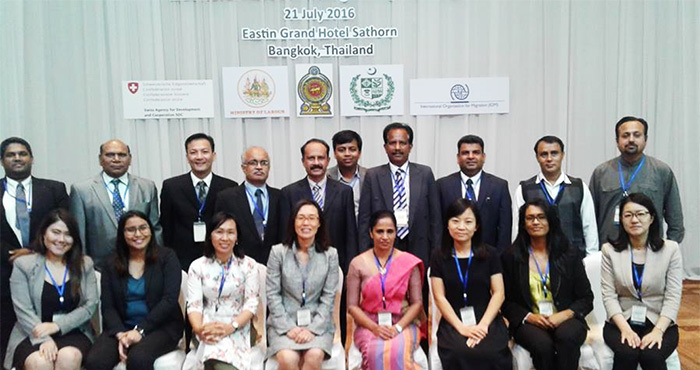 IPS Research Fellow, Dr. Bilesha Weeraratne participated at the Colombo Process Thematic Area Working Group Meeting on “Remittances”, held on 21st July 2016 in Bangkok, Thailand. A seminar on “The Search of MH370 using Oceanographic Models” was conducted by Prof. Charitha Pattiaratchi, Professor of Coastal Oceanography, University of Western Australia, Perth; and Leader, Australian National Facility for Ocean Gliders (ANFOG), School of Civil, Environmental and Mining Engineering & The University of Western Australia (UWA) Oceans Institute. 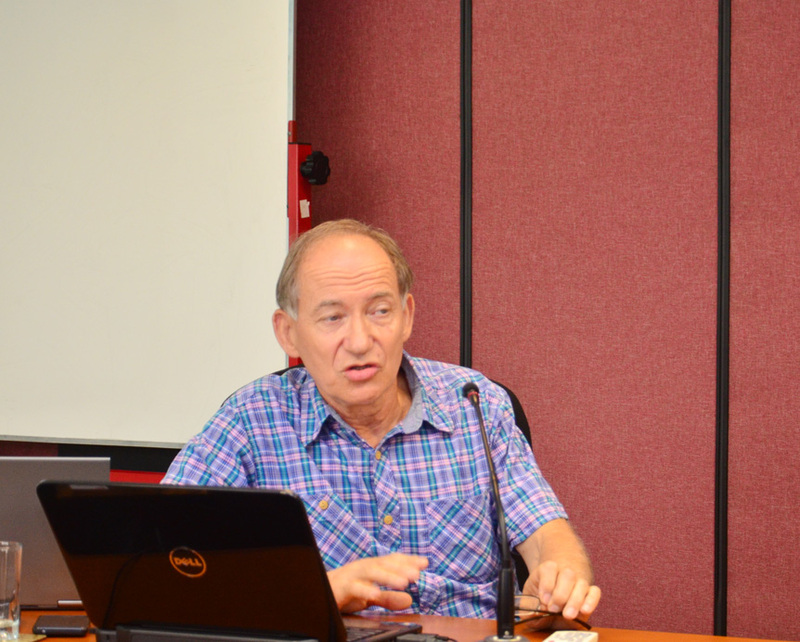 Prof. Robert Z. Lawrence, Albert L. Williams Professor of International Trade and Investment at the Kennedy School of Government, Harvard University, USA, conducted a seminar on “Recent Trends in International Trade Policy: Perspective from the US” at the IPS. 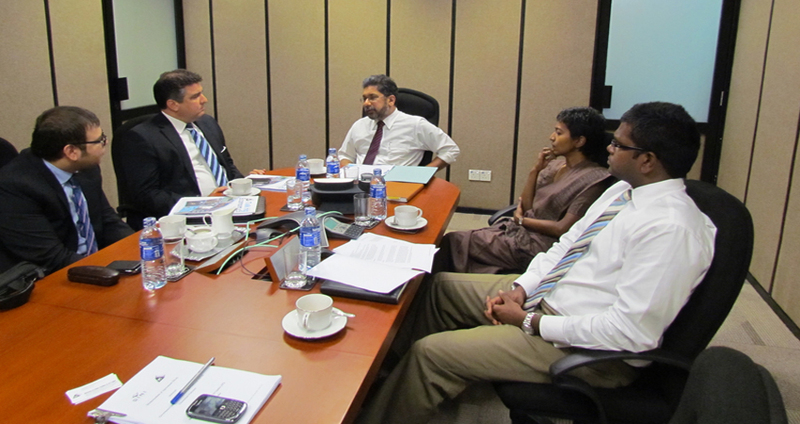 IPS Executive Director, Dr. Saman Kelegama met with a US delegation representing Millennium Challenge Corporation (MCC), to discuss growth constraints to the Sri Lankan Economy, with regard to a need assessment for possible project funding. 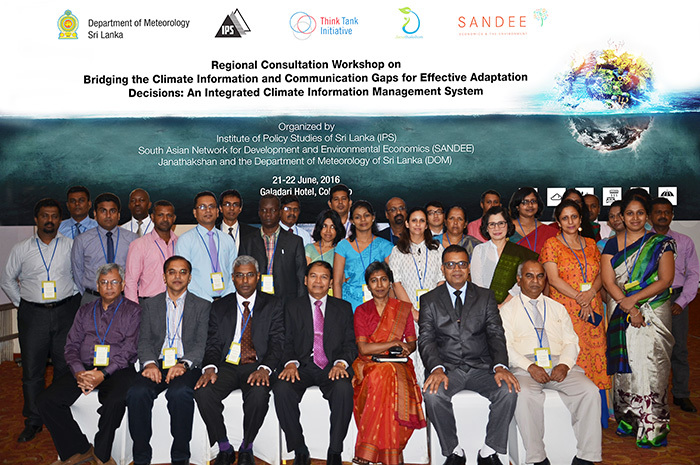 A Regional Consultation Workshop on “Bridging the Climate Information and Communication Gaps for Effective Adaptation Decisions: An Integrated Climate Information Management System” was held on 21st and 22nd June, 2016 at the Galadari Hotel, Colombo, Sri Lanka. 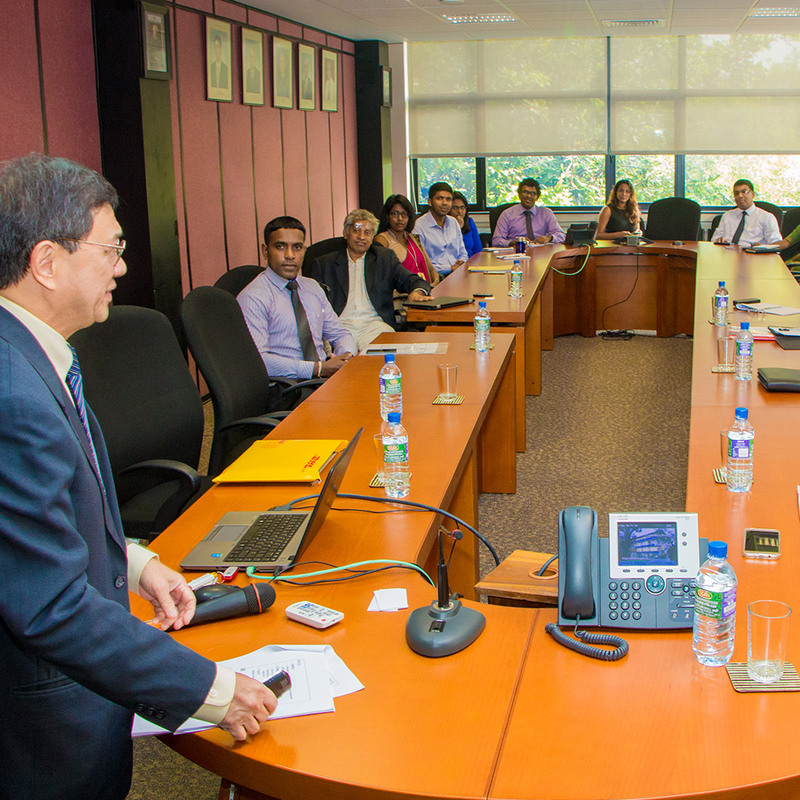 A delegation from the Shanghai Academy of Social Sciences visited the IPS on 17th June 2016, to discuss China-Sri Lanka Economic Relations with especial emphasis on the Maritime Silk Route and One-Belt One-Road initiative. 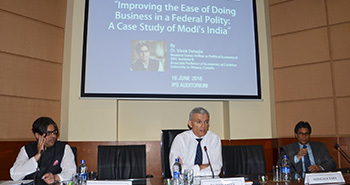 A lecture on ‘Improving the Ease of Doing Business in a Federal Polity: A Case Study of Modi's India’ presented by Resident Senior Fellow in Political Economy at IDFC Institute, by Dr. Vivek Dehejia was held at the IPS Auditorium. It was organized by the IPS together with the Agency for Development. 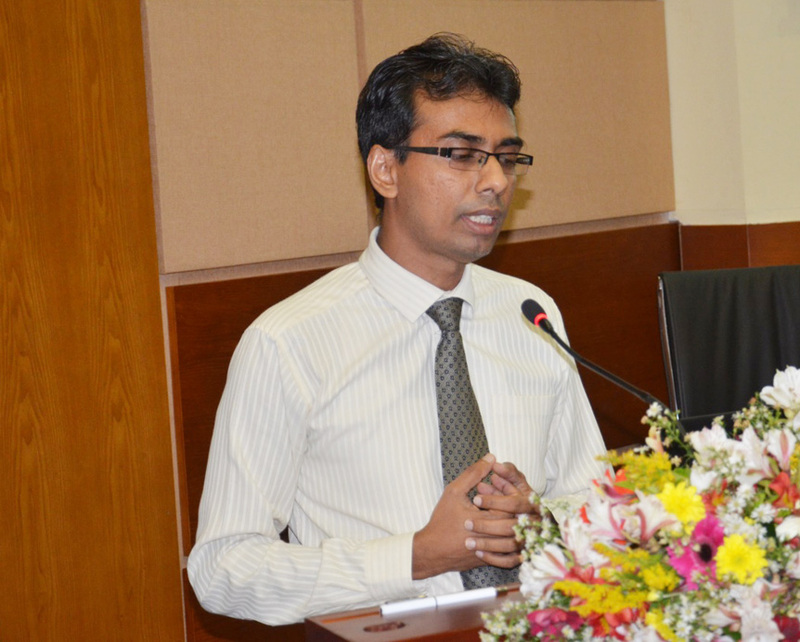 IPS Research Fellow, Dr. Janaka Wijayasiri made a presentation on Air Connectivity in South Asia at the Conference on ‘South Asia: Shaping the New Paradigm for Growth’ organized by the SAARC Chamber of Commerce and Industry (CCI) on June 3, 2016, Turyaa Kalutara. 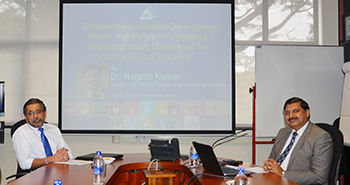 The Head of UN-ESCAP South and South-West Asia, Dr. Nagesh Kumar delivered a lecture on “Achieving Sustainable Development Goals (SDGs): Key Policy Priorities and Implementation Challenges for South Asia and Sri Lanka” at the IPS Conference Room. 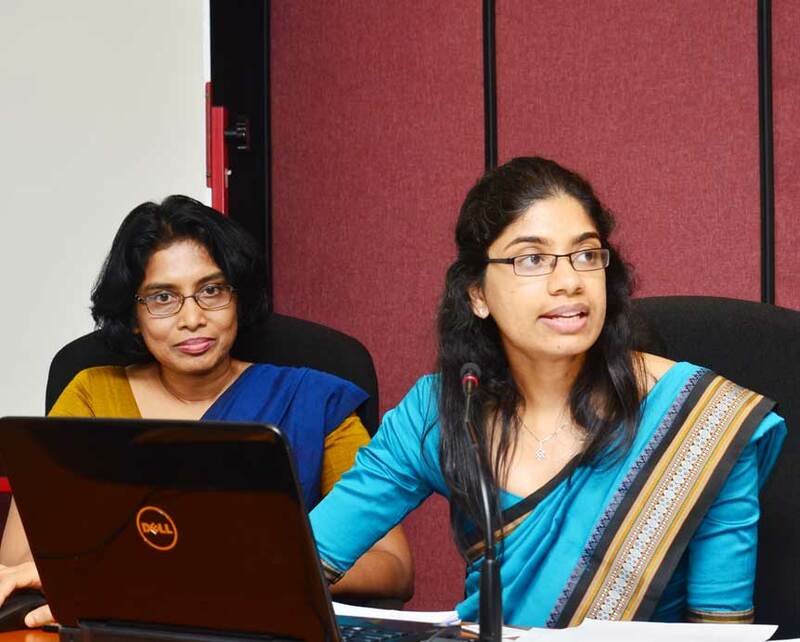 IPS Research Fellow, Dr. Bilesha Weeraratne participated at the Regional Workshop on Labour Market Research held on 1st June 2016 in Colombo, where she made a presentation on “Labour Market Analysis for Labour Migration Policy Planning – Initiatives in Sri Lanka”. 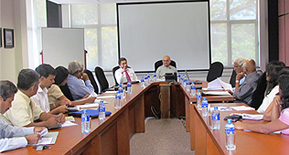 Prof. Mick Moore, Political Economist and Professorial Fellow at the Institute of Development Studies at Sussex, UK, delivered a lecture on “Taxation Policy and Revenue Performance in Sri Lanka: A Review of the Political Economy”, at IPS, on 30th May 2016. 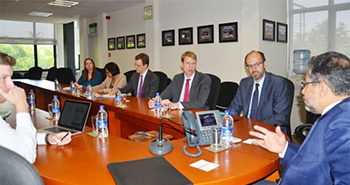 A team headed by the Malaysian Minister of International Trade and Industries, Dato Mustapa Mohomed visited the IPS, on 6th May 2016 to discuss bilateral relations between the two countries. 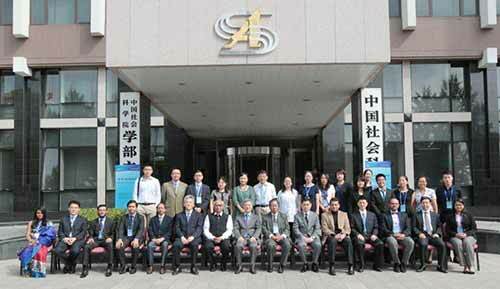 IPS Research Officer Nipuni Perera, participated in the ‘South Asian Think Tank and Media Delegation Exchange Programme’ held in China. The event was organized by the Chinese People’s Association for Peace and Disarmament (CPAPD), during 13th April to 26th April. IPS organized the World Consumer Rights Day Forum 2016, to mark World Consumer Rights Day, for the 4th consectuvie year. 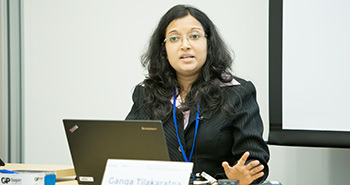 IPS Research Fellow, Ganga Tilakaratna presented a paper titled ‘Food- Based- Safety Nets in Sri Lanka: Evolution and Transition to Cash Transfers’ at a workshop on ‘Food-Based Safety Nets’ organized by the World Bank during 14-16 March at the World Bank Headquarters in Washington D.C., USA. 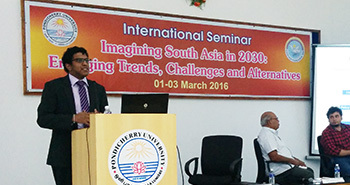 IPS Research Assistant, Kithmina Hewage, presented a paper at the “International Seminar on Imagining South Asia in 2030: Emerging Trends, Challenges, and Alternatives” held at the Pondicherry University, India. 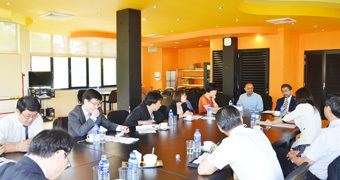 A Chinese delegation visited the IPS to discuss the current economic policies and the progress of China-Sri Lanka trade and investment relations on 2 March 2016. 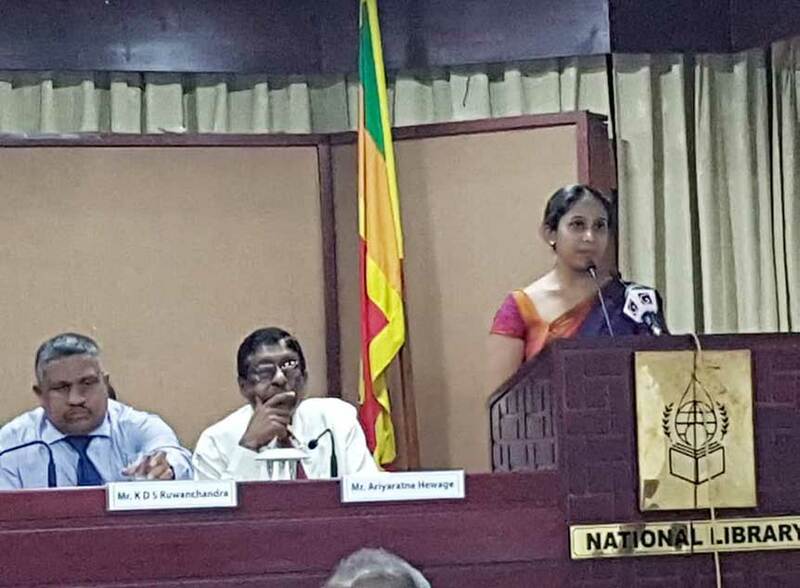 IPS Research Fellow, Dr. Bilesha Weeraratne was a panelist at discussion on ‘The Relevance of the Urban Planning Guidelines in the Context of Sri Lanka’s Western Region Megapolis Master Plan’ organized by the UN-Habitat. 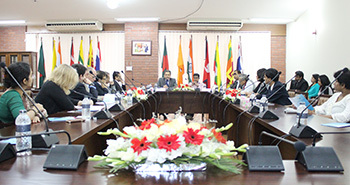 IPS Executive Director, Dr. Saman Kelegama addressed the Second BIMSTEC Roundtable Meeting at the BIMSTEC Secretariat, Dhaka, Bangladesh on 19th February 2016. 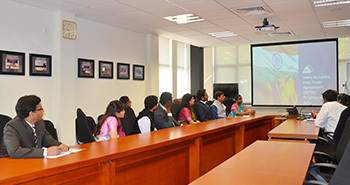 Nine Officer Trainees of the 2015 batch of the Indian Foreign Service visited IPS as part of a study visit. Deputy Director, Dushni Weerakoon together with Janaka Wijayasiri, Suwendrani Jayaratne and Raveen Ekanayake spoke of economic and commercial relationship between India and Sri Lanka and interacted with the Officer Trainees, who were accompanied by N S Yeola, Second Secretary (E&C), High Commission of India, Sri Lanka. H.E. Chandra Das, made a courtesy call at the IPS on 11th February 2016. 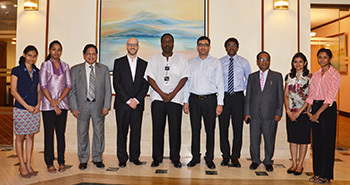 He was accompanied by Arun Vignesh, Country Officer for South Asia, Ministry of Foreign Affairs, Singapore. Renowned Economist, Prof. Premachandra Athukorala delivered a lecture on “Global Production Sharing and Trade Patterns: Implications for Trade and Investment Policy”, at the IPS Auditorium, on 3rd February 2016. 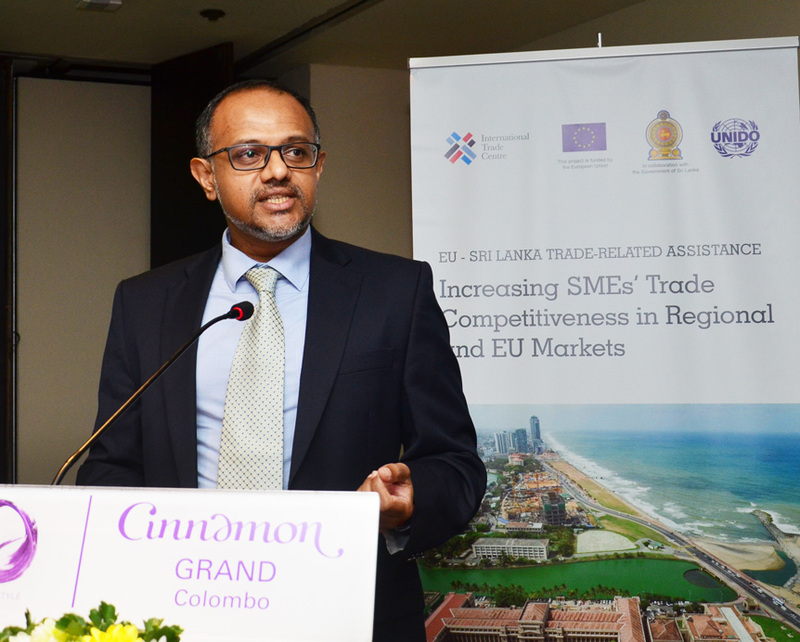 IPS Executive Director, Dr. Saman Kelegama, provided a policy overview on Sri Lanka's trade with the EU and GSP-Plus at a seminar organized by the European Chamber of Commerce of Sri Lanka (ECCSL) together with the EU Delegation to Sri Lanka & the Maldives. 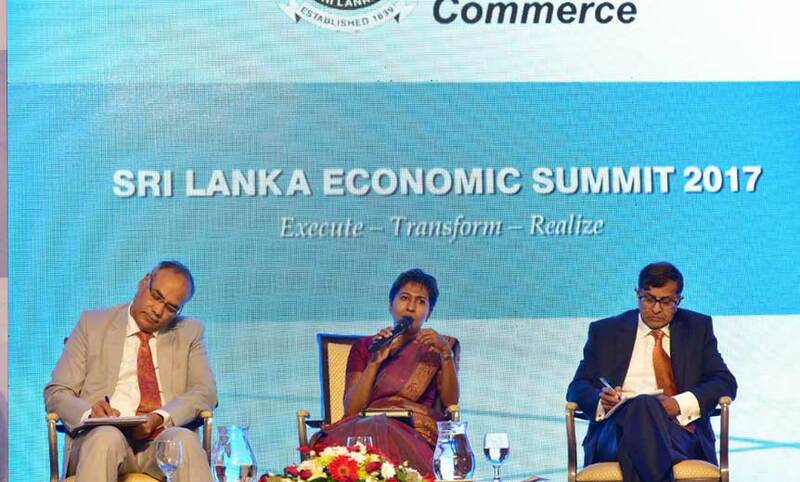 The Sri Lanka Economic Forum 2016 was held at the Cinnamon Grand Hotel, in Colombo during 7-8 January 2016 under the theme of ‘Steering Sri Lanka towards Sustainable and Inclusive Development’. Speaking at the event IPS Executive Director, Dr. Saman Kelegama emphasized the importance of addressing the non-tariff barriers together with tariffs when negotiating the China-Sri Lanka Free Trade Agreement, drawing upon lessons from the Indo-Lanka Free Trade Agreement. 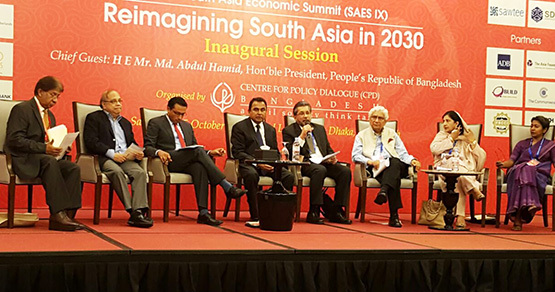 The 8th South Asia Economic Summit (8th SAES) was under the theme ‘Regional Cooperation for Sustainable Development in South Asia’. 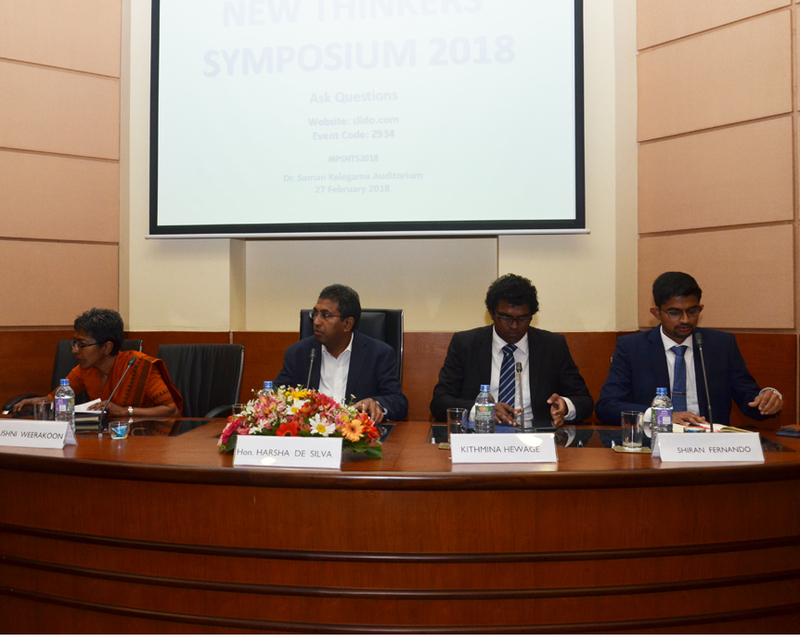 IPS Executive Director, Dr. Saman Kelegama, Deputy Director, Dr. Dushni Weerakoon, Research Fellow, Dr. Athula Senaratne, and Research Officer Dharshani Premaratne were resource persons at the summit. IPS conducted a stakeholder consultation on ‘Low-skilled Labour Migration - Value Chain Analysis of Migration Cost’ on 08th December 2015 at the IPS Conference Room. 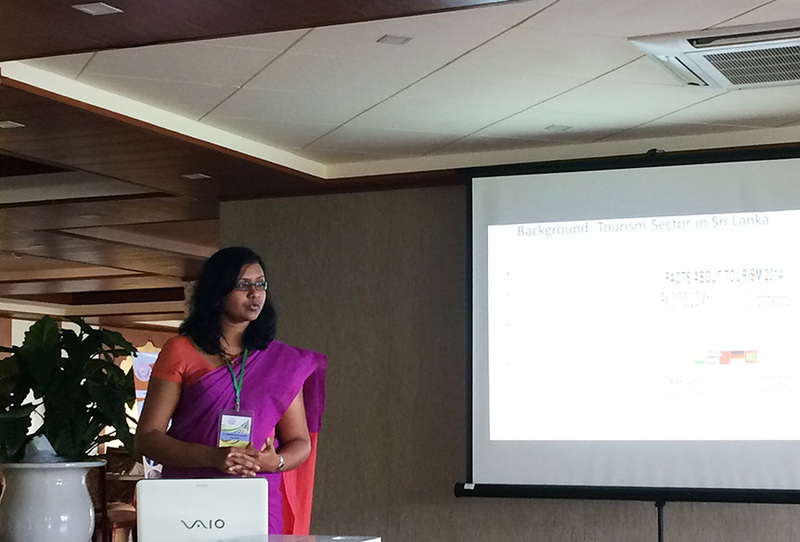 IPS Research Officer, Samanthi Bandara presented an abstract on "Service Quality of School Canteens: A Case Study from the Western Province, Sri Lanka", at the Annual Research Forum of the Sri Lankan Agricultural Economic Association. 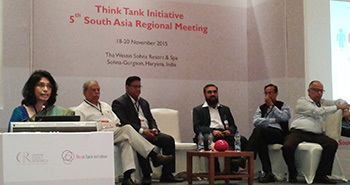 IPS Executive Director, Dr. Saman Kelegama, Deputy Director, Dr. Dushni Weerakoon, Research Fellows, Dr. Nisha Arunatilake and Dr. Athula Senaratne were panelists at the Think Tank Initiative’s 5th South Asian Regional Meeting held in India. 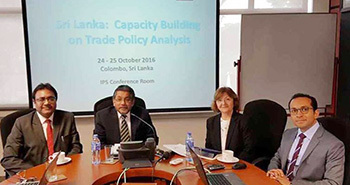 IPS Researchers, Dharshani Premaratne and Kithmina Hewage participated at a regional training workshop on “Enhancing Capacities for Trade in Services Policymaking and Negotiations” which was held in Colombo during 17-20 November 2015. 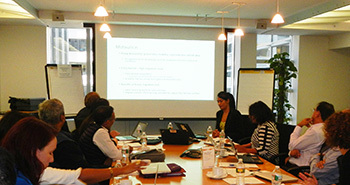 IPS Research Fellow, Dr. Bilesha Weeraratne participated at the “KNOMAD Workshop on Measuring Migration Costs for the Low-skilled” held at the World Bank, Washington DC. 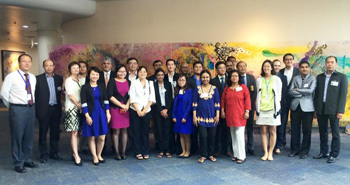 The workshop, organized by the World Bank’s Global Knowledge Partnership on Migration and Development hub (KNOMAD) was held during16-17 November, 2015. 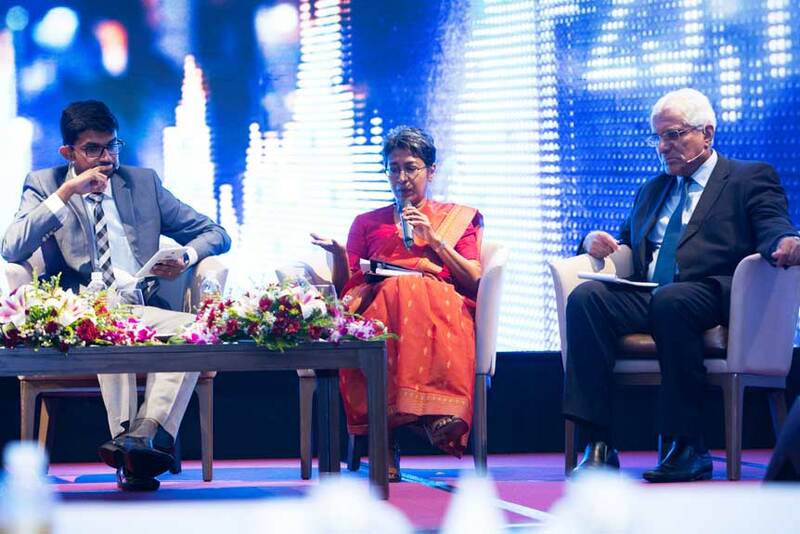 IPS Executive Director, Dr. Saman Kelegama and Deputy Director, Dr. Dushni Weerakoon, were panelists at the 36th National Conference of the Institute of Chartered Accountants of Sri Lanka (CA Sri Lanka), held under the theme “Catalyst 15: Collaborate to Compete”. 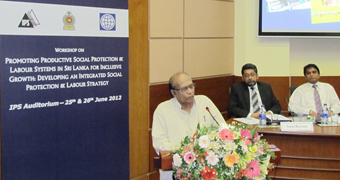 IPS Research Fellow, Dr. Ganga Tilakaratna made a presentation on ‘Social Protection for Informal Sector Workers in Sri Lanka’ at the 2nd Social Protection Forum Asia on ‘Social Protection in the Informal Sector-Incentive or Hindrance to Formalisation?’. 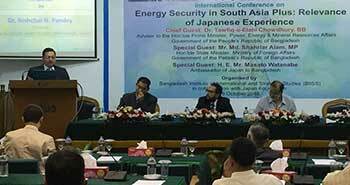 IPS Research Economist, Chatura Rodrigo represented Sri Lanka at the ‘International Conference on Energy Security in South Asia Plus: Relevance of Japanese Experience’, held at the Bangladesh Institute of International and Strategic Studies in October 2015. 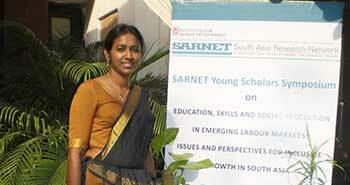 IPS Research Officer, Samanthi Bandara was awarded a research grant by the SARNET’s Competitive Call for Paper by Young Scholars from South Asia on her research proposal titled “What Factors Matter for Choice of Livelihood by the Older Workers”. 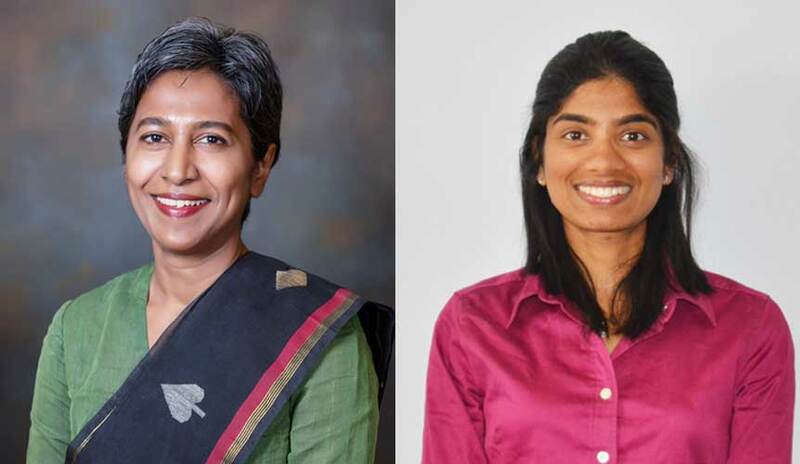 IPS Executive Director, Dr. Saman Kelegama, Research Fellow, Dr. Ganga Tilakaratna and Research Officer, Samanthi Bandara, participated in the International Conference on ‘Meeting the Challenges of Employment and Inclusive Growth in South Asia’ held in India in October 2015. 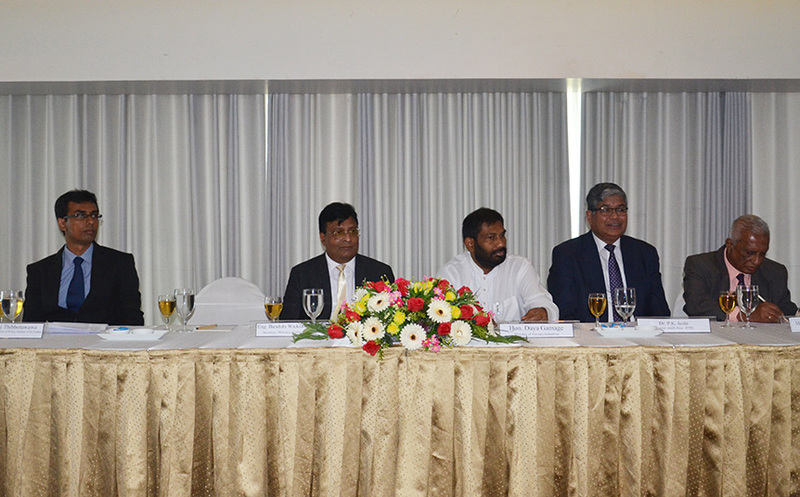 IPS together with United Nations ESCAP conducted a “National Consultation on Pensions in Sri Lanka” with the aim of promoting a dialogue among key stakeholders on the need for ensuring an uninterrupted and adequate pension for all old aged persons in the country. 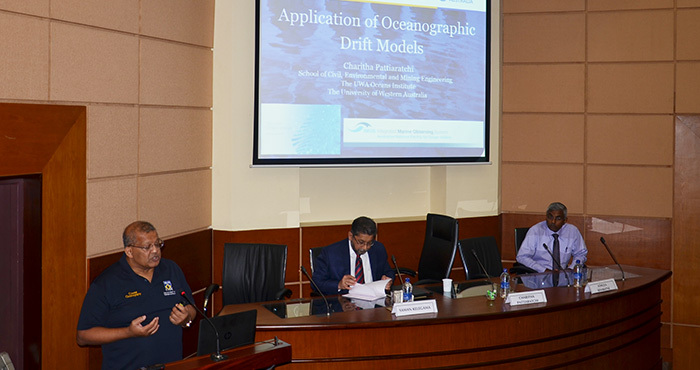 IPS Research Fellow, Dr. Janaka Wijayasiri, participated in the 21st Meeting of the Indian Ocean Rim Academic Group (IORAG) meeting which was held in Padang, Indonesia, on 20th October, 2015. 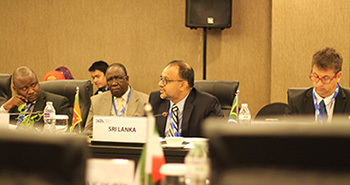 The IPS is the focal point in Sri Lanka for the IORAG. 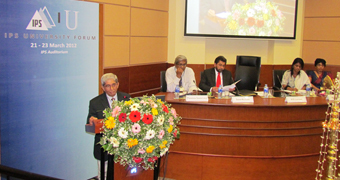 IPS launched its flagship publication ‘Sri Lanka: State of the Economy (SOE) 2015’ under the theme ‘Economic Reforms: Political Economy and Institutional Challenges’ at the IPS Auditorium. The IPS flagship publication was launched under the purview of the Deputy Minister of State Enterprise Development, Hon. 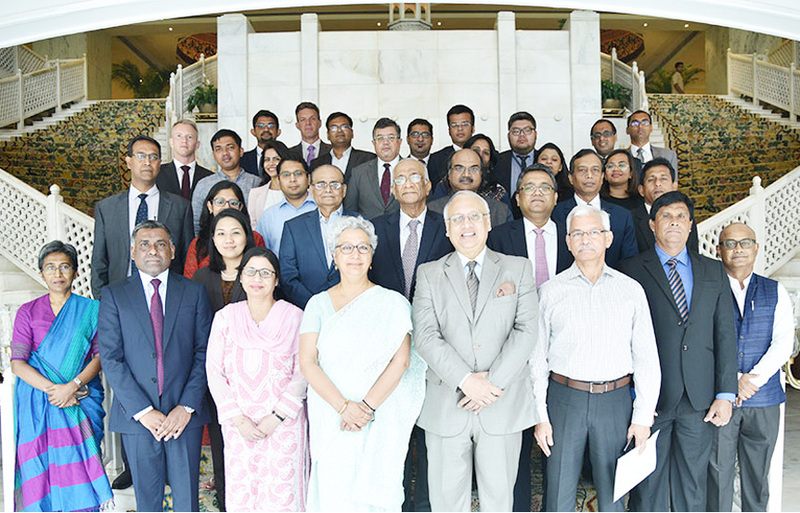 The Ministry of Foreign Affairs of Thailand and the Indian Studies Centre of Chulalongkorn University, co-hosted the 2nd BIMSTEC Network of Policy Think Tanks (BNPTT) Meeting during 8 – 9 October 2015, at Anantara Siam Hotel, Bangkok. 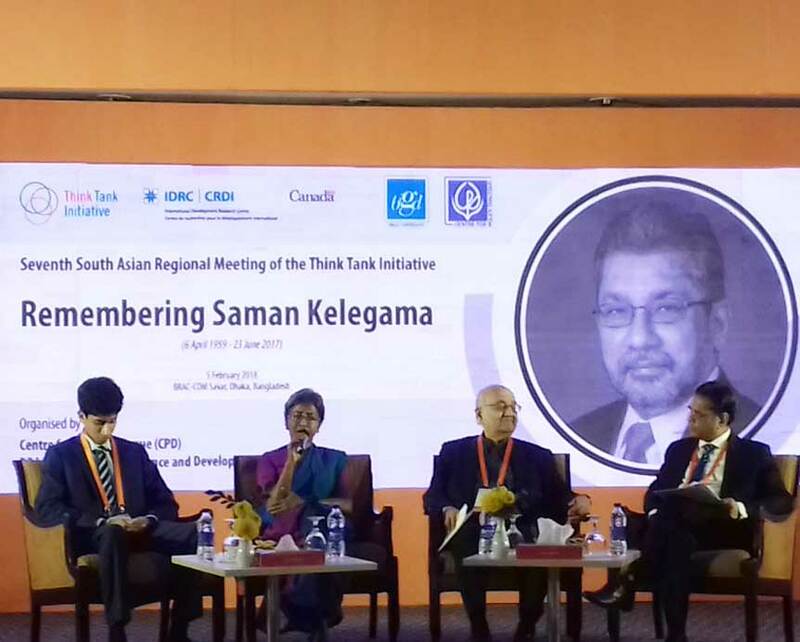 IPS Executive Director, Dr. Saman Kelegama was a panelist at the session on “Expanding Intraregional Trade: Drawing Lessons from ASEAN and NAFTA” at the South Asia Economic Conclave (SAEC) organized by the Confederation of Indian Industries and the Government of India. The World Tourism Day 2015 was marked under the theme ‘The World Tourism - One Billion Tourists, One Billion Opportunities’. 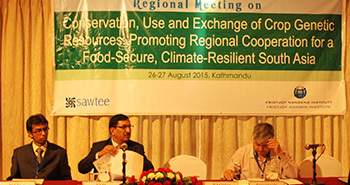 A regional consultation workshop on the “Conservation, Use and Exchange of Crop Genetic Resources: Promoting Regional Cooperation for a Food-Secure, Climate-Resilient South Asia” was held in August 2015, in Kathmandu, Nepal. 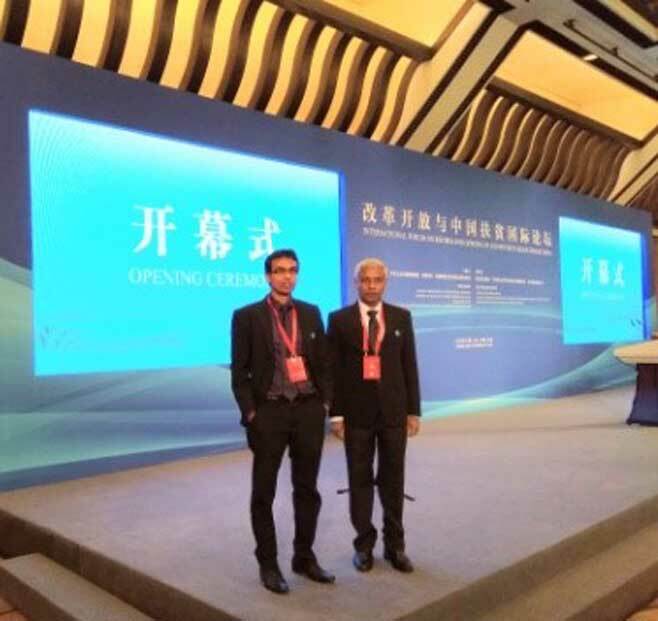 Dr. Janaka Wijayasiri, Research Fellow and Nipuni Perera, Research Assistant of IPS participated in the "One Belt, One Road" (OBOR) and Bangladesh, China, India, Myanmar (BCIM) Regional Interconnection Conference organized by the Institute of World Economics and Politics/Chinese Academy of Social Sciences (CASS), in Beijing, China on 25 August 2015. 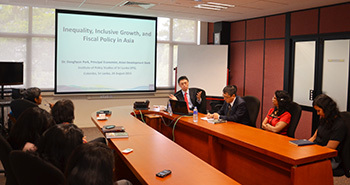 Principal Economist of the Asian Development Bank (ADB), Dr. Donghyun Park conducted a seminar on ‘Inequality, Inclusive Growth and Fiscal Policy in Asia’ at the IPS, where he shared an overview of a recently launched publication on the title which he had co-authored. 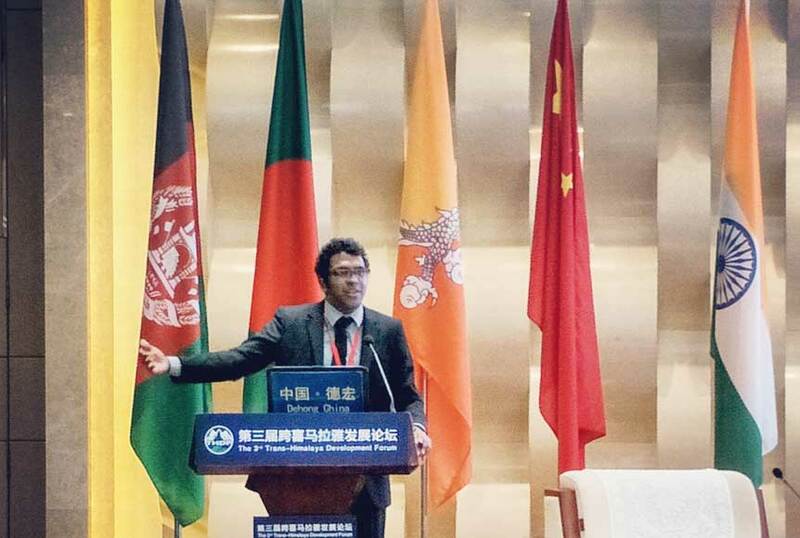 IPS Research Assistant, Nipuni Perera participated in the International Seminar for Young Scholars on Economic Development Issues held by Chinese Academy of Social Sciences (CASS) and organized by the Graduate School, CASS in Beijing, China. 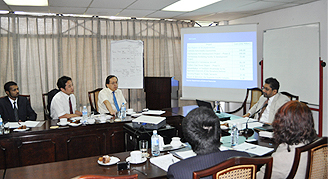 The seminar took place during 22 August to 20 September 2015. 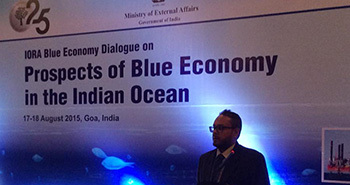 A conference on the “Prospects of Blue Economy in the Indian Ocean Rim” was held in India with the aim of fostering high-quality deliberations on various aspects of blue economy by the academicians, policy makers, diplomats and informed intelligentsia representing the Indian Ocean Rim countries and from other parts of the world. 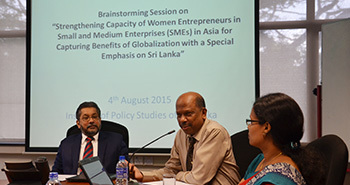 IPS conducted a Brainstorming Session on “Strengthening Capacity of Women Entrepreneurs in Small and Medium Enterprises (SMEs) in Asia for Capturing Benefits of Globalization with a Special Emphasis on Sri Lanka”. Deng Lan, Associate Professor at the Institute of South Asia Studies, Yunnan Academy of Social Sciences met with IPS Executive Director, Dr. Saman Kelegama and the IPS Research Staff and shared her thoughts on promoting economic and trade cooperation between Sri Lanka and Yunnan Province of China, which is keen to foster closer relations with South Asia. 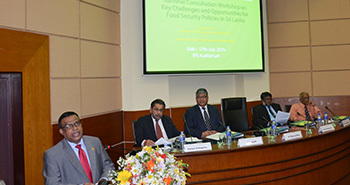 IPS together with the International Food Policy Research Institute (IFPRI) conducted a national consultation workshop at the IPS Auditorium, on “Key Challenges and Opportunities for Food Security Policies in Sri Lanka”. 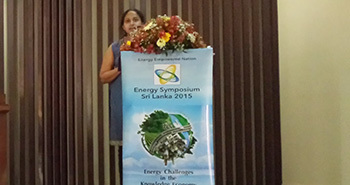 IPS Research Economist, Kanchana Wickramasinghe made a presentation on “Energy Management in Hotel Sector in Sri Lanka: Adoption of Good Practices”, at the International Symposium on Energy Challenges in the Knowledge Economy held from 26th to 27thJune in Colombo. 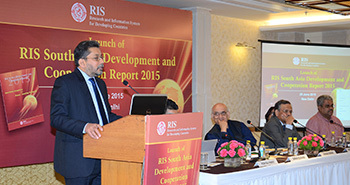 IPS Executive Director, Dr. Saman Kelegama spoke of the “Prospects for SAARC” at the launch of the “South Asia Development and Cooperation Report 2015” published by Research and Information System for Developing Countries (RIS), India. Dr. H.N. 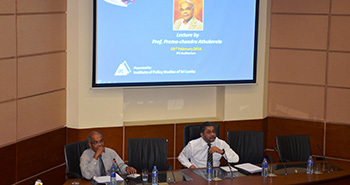 Tenuwara, Visiting Professor at Iowa University, USA and former Head of the Economic Research Department, Central Bank of Sri Lanka made a presentation on the topic: “The Passage to Riches: Story of Growth and Development” at a seminar held at the IPS Conference Room on 19th June 2015. Secretary-General of the Bay of Bengal Initiative for Multi-Sectoral Technical and Economic Cooperation (BIMSTEC), Sumith Nakandala, visited the IPS on 18th June 2015 to discuss the forthcoming BIMSTEC Think Tanks Network (BTTN) meeting in Bangkok, Thailand. 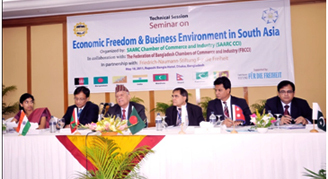 BIMSTEC will soon be moving towards a FTA to strengthen the on-going sectoral cooperation projects. 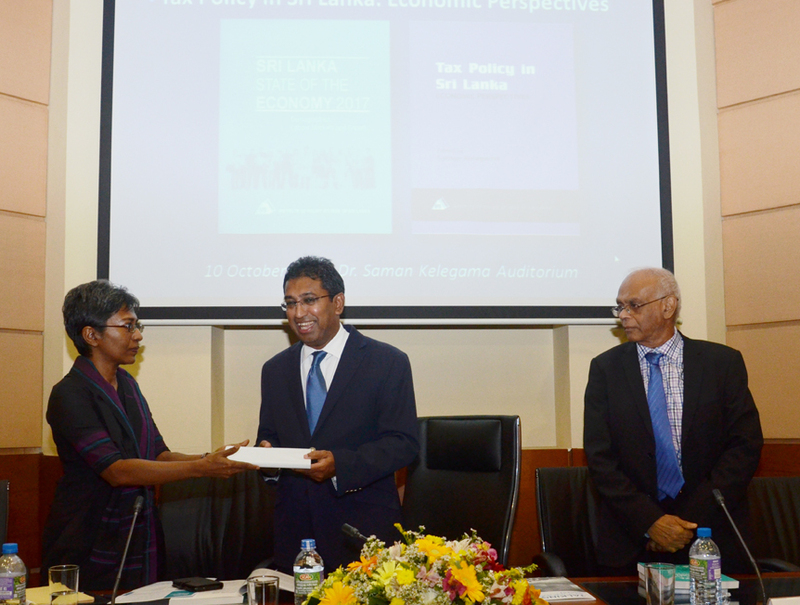 During a recent visit in Australia, IPS Executive Director Dr. Saman Kelegama made a presentation on the “Contemporary Sri Lankan Economics and Politics” at a conference on “Economics and Politics in South Asia: Recent Changes, Prospects, and Challenges”. 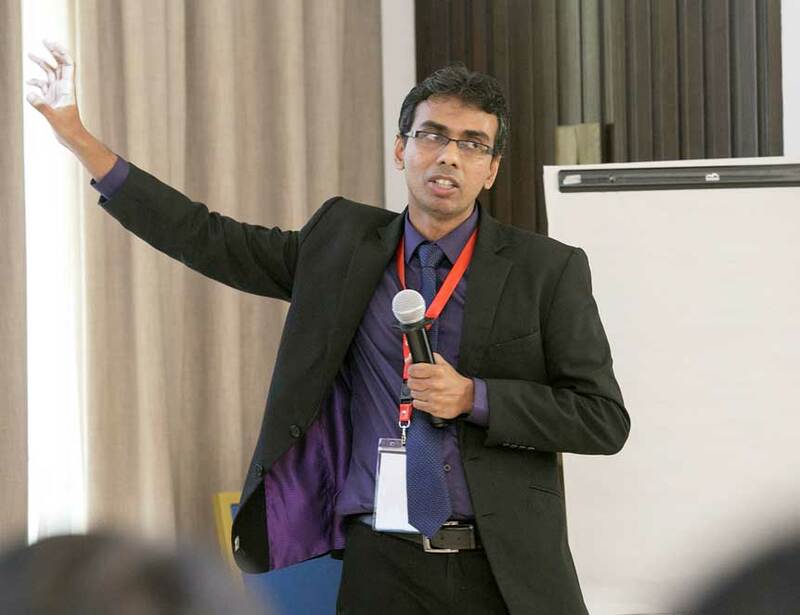 Dr. Ganga Tilakaratna, Research Fellow, IPS presented a paper on ‘Financial Inclusion in Sri Lanka: Current Status and Issues’ at a workshop on ‘Understanding Financial Inclusion in Asia’ held in Hong Kong from 20-21 May 2015. 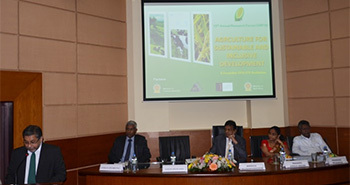 A Forum on “Food and Agriculture: Rural and Urban Innovations” organized by DuPont was live streamed on the 19th May at the IPS conference room in Colombo. 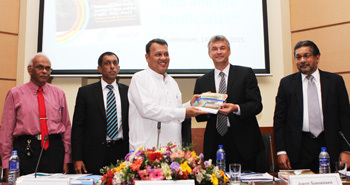 The 2015 edition of the Economic and Social Survey of Asia and the Pacific (ESCAP) was launched at the IPS Auditorium in Colombo, under the patronage of the State Minister of Finance Mahinda Samarasinghe. IPS Executive Director, Dr. Saman Kelegama was a speaker at the session on “Regional Development Cooperation and Partnerships” at the Asia-Pacific High-Level Consultation on Financing for Development organized by the UN-ESCAP, ADB, ADBI and the Government of Indonesia. 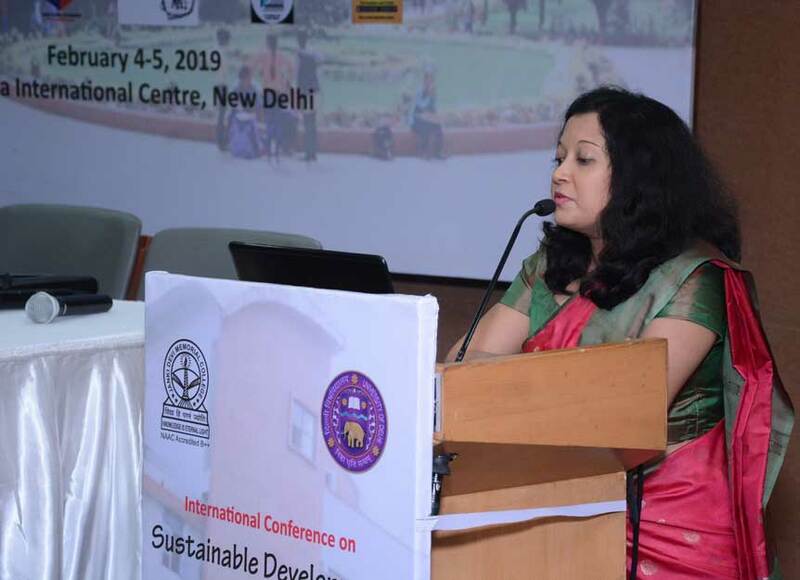 Dr. Ganga Tilakaratna and Dr. Bilesha Weeraratne, Research Fellows of IPS were speakers at the international conference on ‘South Asian Economic Development: The Way Forward ’ organized by the Faculty of Economics at the South Asian University, held in New Delhi, India on 10-11 April 2015. A seminar on South Asian Regional Economic Cooperation was held at the IPS Premises, where Dr. Sanjaya Kathuria, Lead Economist on Regional Integration at the World Bank’s South Asia Regional Cooperation and Integration Unit, Washington, D.C., conducted a presentation on “Regional Integration in South Asia: The World Bank’s Approach”. 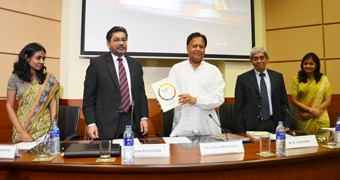 The Millennium Development Goals (MDG) Country Report 2014 was launched in Colombo, under the patronage of Deputy Minister of Policy Planning and Economic Affairs, Dr. Harsha De Silva. 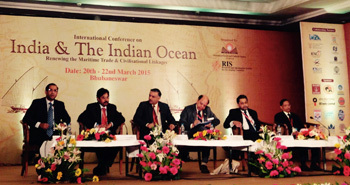 An International Conference on “India and the India Ocean: Renewing the Maritime Trade and Civilizational Linkages,” was held in Bhubaneswar, Odisha in March 2015. 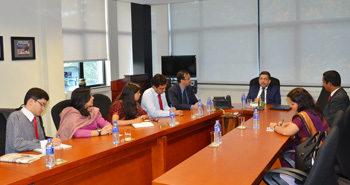 The Indian External Affairs Ministry Junior Diplomats visited the IPS to obtain a Sri Lankan perspective of the India – Sri Lanka Economic Relations. 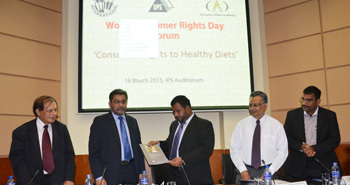 The IPS, together with the Consumer Affair Authority of Sri Lanka and Consumer International, recently organized a forum in Colombo to mark the Wold Consumer Rights Day 2015 under the theme “Healthy Diets”. A Dialogue was held on China’s efforts to revive the Maritime Silk Road (MSR), which is expected to enhance connectivity and promote mutual development among the countries from the Far East to the Indian Ocean to Africa. IPS held a national consultation meeting on ’Products with Regional Trade Potential and Associated Non-tariff Barriers, with special focus on Women Owned and Led Micro, Small and Medium Enterprises (WMSMEs). 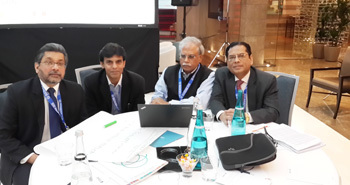 IPS Executive Director Dr. Saman Kelegama, and Deputy Director Dr. Dushni Weerakoon, participated at the Think Tank Initiative (TTI) Exchange 2015 on the theme “Research Quality: Approaches, Outreach, and Impact” held in Istanbul, in February 2015. 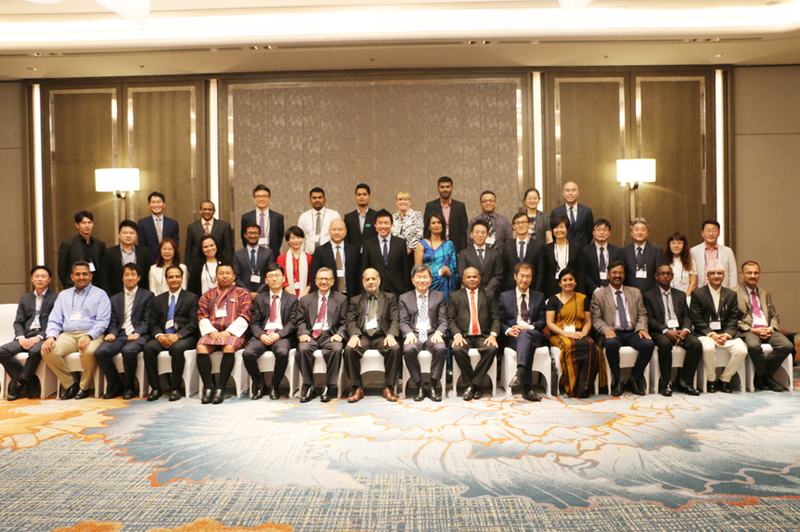 IPS Research Officer, Suwendrani Jayaratne, participated at the recently held ‘UNNExT Workshop on Paperless Trade Facilitation for Small and Medium-sized Enterprises’ in Bangkok, Thailand. 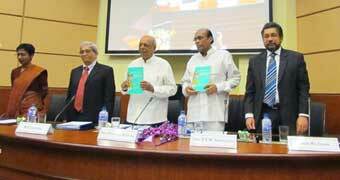 The Sinhala and Tamil translations of the book titled ‘Money, Inflation and Output’ by Dr. H N Thenuwara was launched at the IPS premises. The book explains the foundations of money, inflation and output in a country, their inter-relations, and how they are affected by the monetary authority and exchange rate and monetary policy regimes. 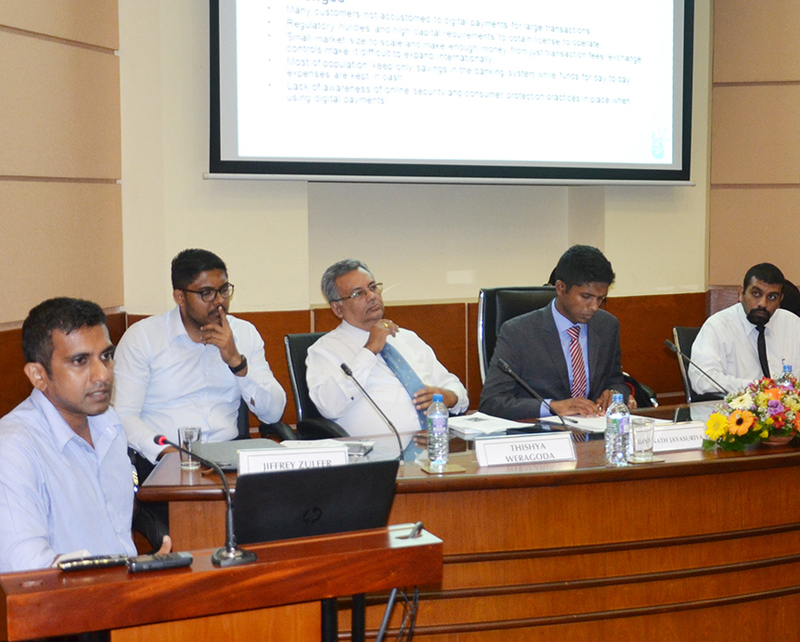 IPS conducted a Stakeholder Consultation Meeting to discuss preliminary findings of a study carried out together with South Asia Watch on Trade, Economics and Environment (SAWTEE) on ‘Trade and Transport Facilitation in Sri Lanka’. Visiting Scholar Prof. Yoshiyasu Ono, Professor at the Institute of Social and Economic Research (ISER), Osaka University, Japan, conducted a presentation on “Long-run Stagnation in Japan – Theory and Policy” at the IPS premises. 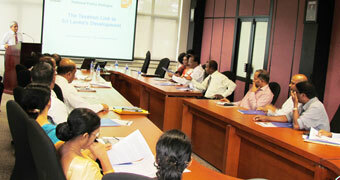 IPS held a Multi-Stakeholder Workshop on Low Carbon Technology Renovation and Climate Technology Centre Network (CTCN). 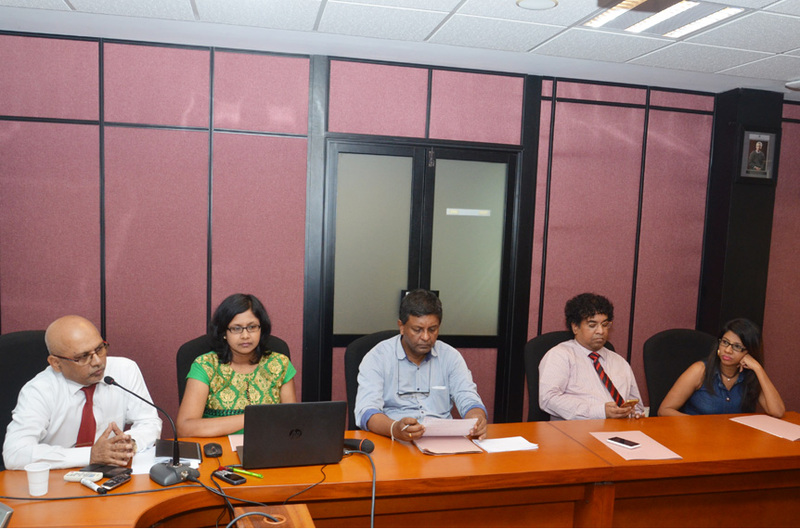 A dissemination meeting on a study conducted by IPS, titled ‘An Evaluation of the Implementation of Guidelines in School Canteens’, was presented to the Secretary Mr. Anura Dissanayake, Ministry of Education on 15th December 2014. 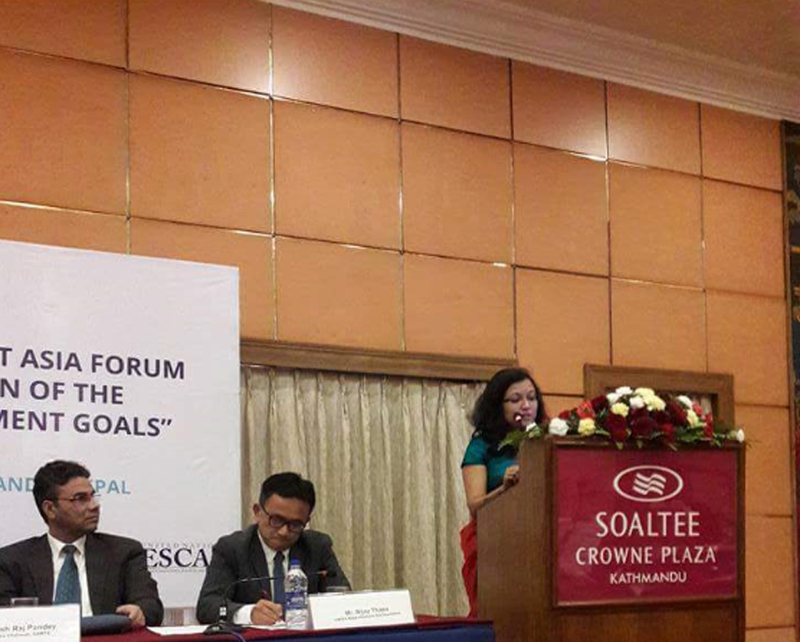 Dr. Saman Kelegama, Executive Director, IPS and Dr Ganga Tilakaratna, Research Fellow, IPS, participated in the International Conference on ‘Meeting the Challenges of Employment and Social Protection in South Asia’ organized by the South Asia Research Network on Employment and Social Protection for Inclusive Growth (SARNET) in collaboration with the UN-ESCAP, ILO, IDRC, Canada and the Institute for Human Development (IHD), held in New Delhi, India on 14-16 December 2014. 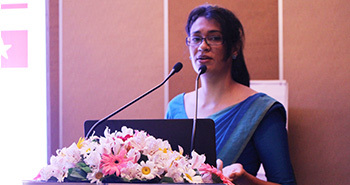 Kanchana Wickramasinghe, Research officer, IPS, made a presentation on “Determinants of Milk Consumption in Sri Lanka” and Dilani Hirimuthugodage, Research Officer, IPS, made a presentation on “Improving Market Affordability and Accessibility of Milk and Milk Products in Sri Lanka”, at the 8th Annual Research Forum, Sri Lanka Agricultural Economic Association & Symposium on “Convergence of Policies and Programmes for Sustainable and Climate Resilient Agriculture”. IPS recently conducted a Round Table discussion titled “Digital Dynamism”, with the aim of shaping a new narrative around innovation and entrepreneurship in the country. 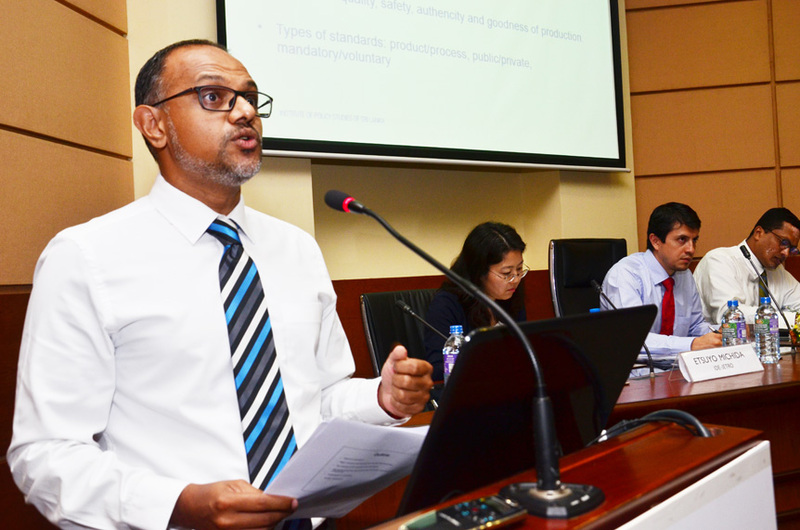 IPS Research Officer Raveen Ekanayake was invited as a resource person to assist and advise the Sri Lankan delegation at the SASEC Trade Facilitation Week: Sanitary/Phytosanitary (SPS) and Technical Barriers to Trade (TBT) held in Thailand. 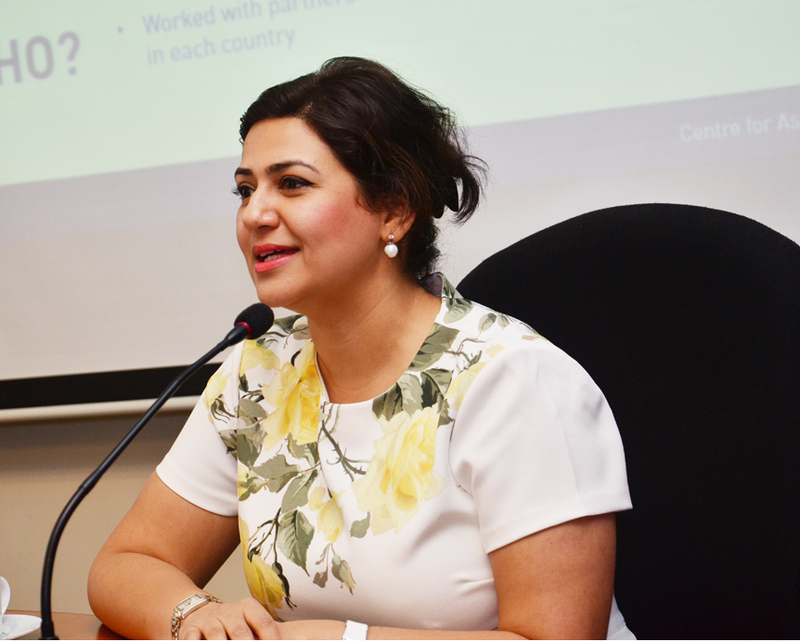 Anushka Wijesinha, Research Economist and Acting Head of Industry, Competitiveness and Regulatory Policy Unit of IPS, was recently appointed as the Special Advisor on Industrial Development and Youth Entrepreneurship to the Ministry of Industry and Commerce. 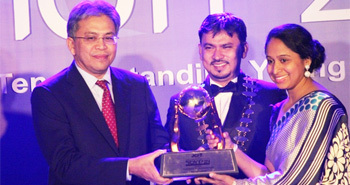 The Top Outstanding Young Persons (TOYP) in Sri Lanka Award 2014 for Personal Accomplishment, organized by the Junior Chamber International (JCI) Sri Lanka, was held at Water’s Edge on 11th November 2014. IPS and InterAnalysis Ltd. are jointly organizing a five day workshop on ‘Trade Analysis and Economic Integration in Pakistan-India Relations: The Regional Dimension’ from 11th to 15th of November, 2014. 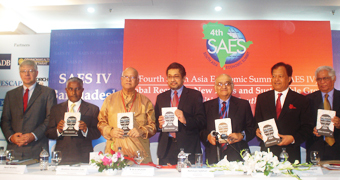 The 7th South Asia Economic Summit (SAES) was held in New Delhi, India, from the 5th to 7th of November 2014. 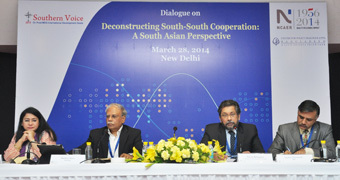 The theme of this year’s summit was ‘Towards a South Asia Economic Union’. 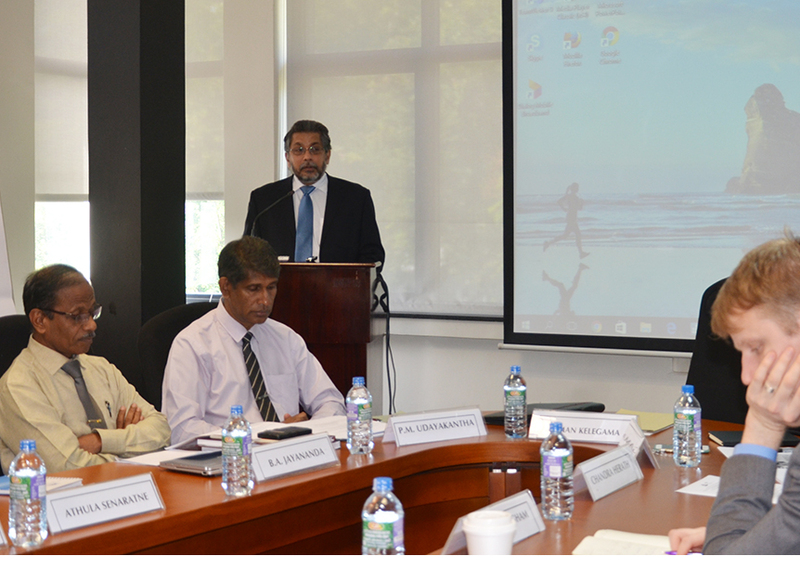 Dr. Saman Kelegama, Executive Director, IPS, delivered the Inaugural Gamani Corea Memorial Lecture organized by the Gamani Corea Foundation on 3rd November 2014 at the Lakshman Kadirgamar Institute of International Relations and Strategic Studies (LKIIRSS). 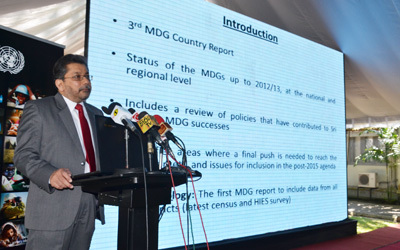 Dr. Saman Kelegama, Executive Director, IPS, made a presentation on the 3rd Millennium Development Goals Sri Lanka draft report prepared by the IPS team on UN Day at the UN Mission in Colombo on 24th October 2014. IPS set up an Advisory Committee for the study on “South Asian Country Study on Products with Regional Trade Potential and Associated Non-tariff Barriers, with Special Focus on Women Micro Small and Medium Enterprises (WMSMEs) A Case of Sri Lanka” to provide guidance and technical input to the IPS research team to ensure the policy relevance and quality of research outputs. 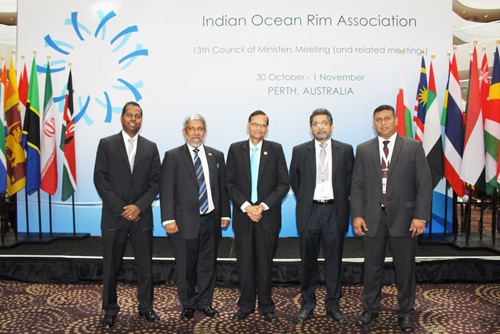 Dr. Saman Kelegama, Executive Director, IPS, was a delegate with the government of Sri Lanka team at the 14th Ministerial of the Indian Ocean Rim Association (IORA) in Perth, Australia during 6-9 October 2014. 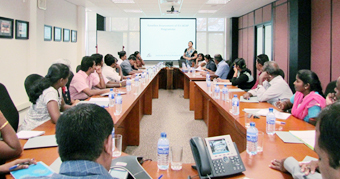 With aim of developing research agenda on Migration and Development , the IPS organized a stakeholder meeting on September 23, 2014 at the 2nd Floor IPS Conference Room to prioritize research themes and issues to better cater to development priorities and policy requirements of Sri Lanka. 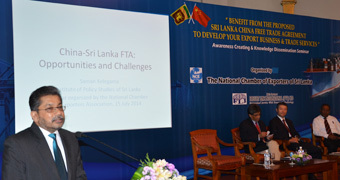 Dr. Saman Kelegama, Executive Director, IPS, spoke on the ‘Importance of FTAs for Market Access and Development’ at the Seminar on ‘Potential Sectors for Trade with China under a FTA’ organized by the Ceylon Chamber of Commerce held on 1st of September, 2014 at the Hotel Taj Samudra, Colombo. 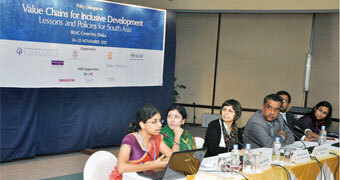 Dr. Ganga Tilakaratna, Research Fellow, IPS, participated and contributed to the Regional Conference on “Multi-Stakeholder Inputs for the 18th SAARC Summit – Declaration on Strengthening Social Protection in South Asia” organized by the South Asia Centre for Policy Studies (SACEPS) and Friedrich Ebert Stiftung (FES) held during 21-22 August, Kathmandu, Nepal. 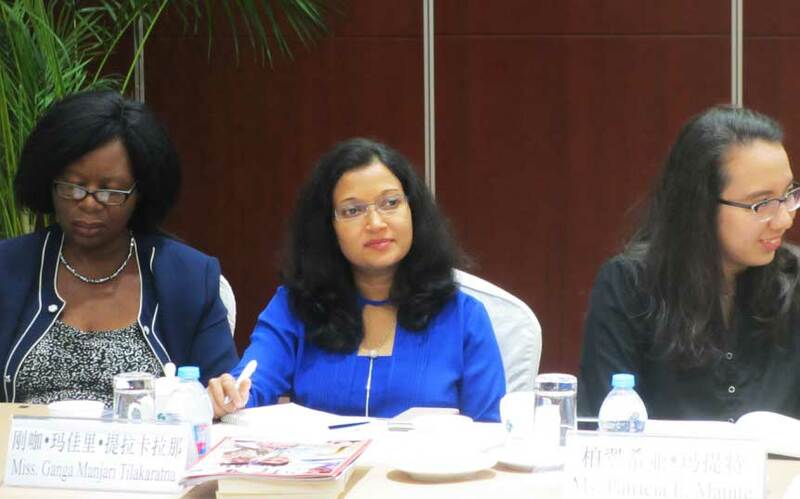 Sunimalee Madurawala, Research Officer, participated the “Indian Ocean Rim Association (IORA) Dialogue Event - Paths to Women’s Economic Empowerment, with a Focus on Tourism and Textiles in IORA Countries”, held in Kuala Lumpur, Malaysia, during 17-19 August 2014. 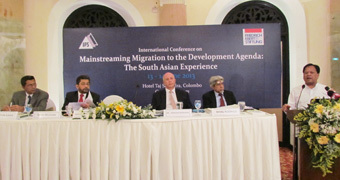 The IPS organized a conference on “Policies for Mainstreaming Migration into Development in Sri Lanka”. The conference took place on 14th of August as a component of the IPS project Meeting the Development Challenges of Migration (MED_MIG), which is funded by the Think Tank Initiative (TTI) - a multi-donor program managed by Canada’s International Development Research Center (IDRC). 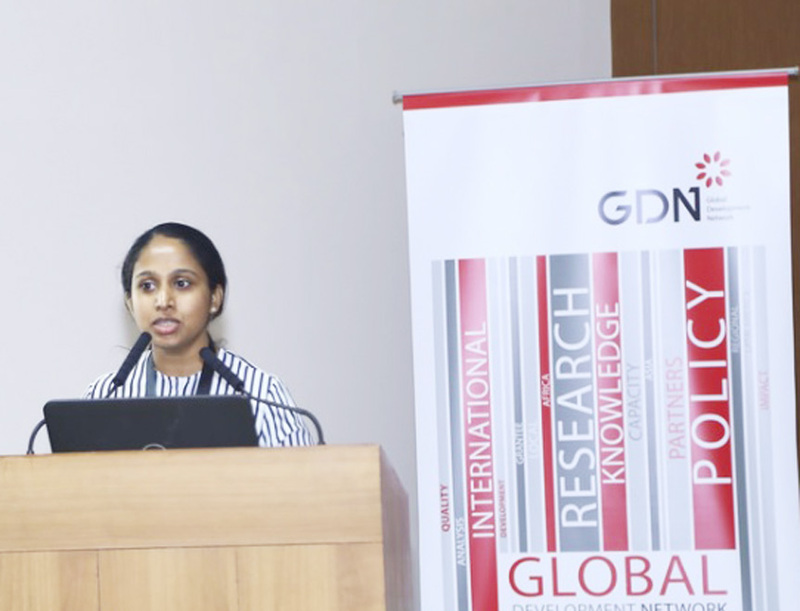 Kanchana Wickramasinghe, Research Officer, IPS won the First Prize for the Japanese Award for Outstanding Research on Development (ORD) in the Global Development Awards and Medals Competition of the Global Development Network (GDN). This year, 388 submissions from 72 countries had been received for the Competition. 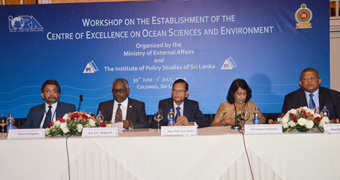 The IPS, in collaboration with the Ministry of External Affairs organized a regional workshop on “Establishing a Centre of Excellence (CoE) on Ocean Sciences and Environment for the Indian Ocean Rim Countries” from 30 June to 1 July 2014 at Hilton Colombo. 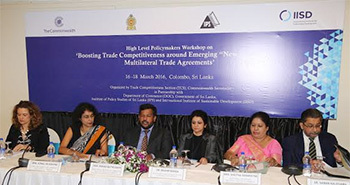 Dr Saman Kelegama, Executive Director, IPS, delivered the Keynote Address at the ‘China-Sri Lanka Free Trade Agreement’ seminar organized by the National Chamber of Exporters of Sri Lanka at Taj Samudra Hotel on 15 July 2014. 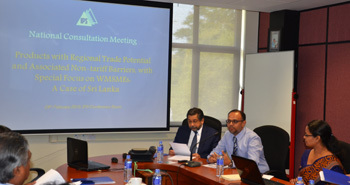 Dr. Saman Kelegama, Executive Director, IPS and Suwendrani Jayaratne, Research Officer, IPS participated in the ‘Project Advisory Committee Meeting’ and the ‘Researchers’ Meeting’ of the ‘South Asian Trade and Transport Facilitation Audit Project’. 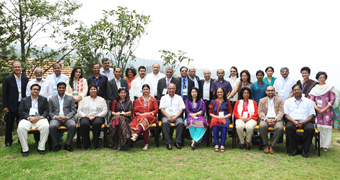 Dr. Dushni Weerakoon (Deputy Director) and Dr. Nisha Arunatilake (Fellow) participated at the Fourth Regional Meeting of Think Tank Initiative (TTI-RM4). 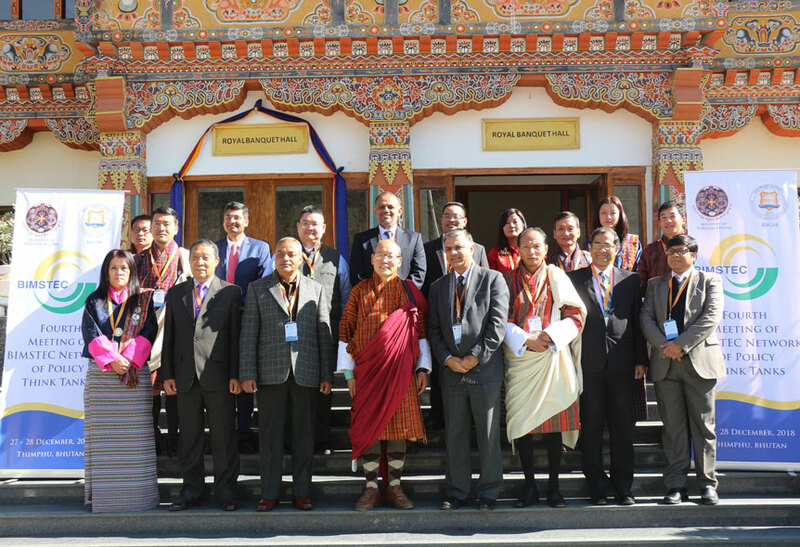 The focus of this meeting held during 9-10 June in Kathmandu, Nepal, was on the needs for and the ways of greater cooperation among think tanks in the region. 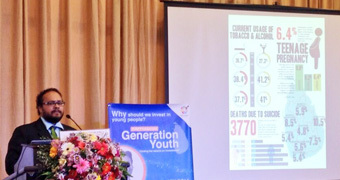 The publication was based on a study done by IPS in five districts of the country (Kurunegala, Anuradhapura, Batticaloa, Moneragala and Matale). The WCY 2014 which was held during 6th-10th May was successfully concluded with the aim of mainstreaming youth in the post 2015 development agenda. The IPS is pleased to have been part of the conference both as a key knowledge as well as a resource partner. Sunimalee Madurawala, Research Officer, made a presentation on ‘Gender Equality and Empowering Young Women in Sri Lanka’ at the South Asian Regional Conference on Women, Work & Poverty held at Marriot Hotel, Islamabad, Pakistan. 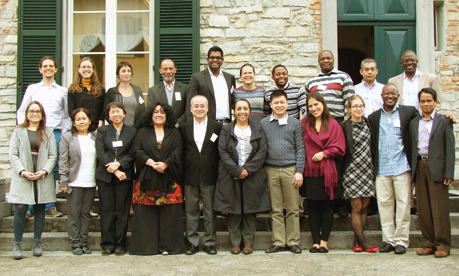 Anushka Wijesinha, Research Economist, represented the IPS at a project meeting for a new global research project titled 'Health Inequalities and Access to Social Security for Informal Workers in Latin America, Africa and Asia: Sharing Lessons Learned'. 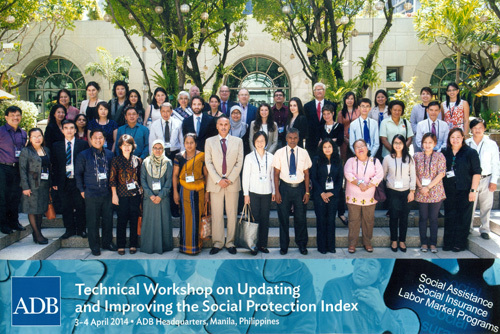 Dr Ganga Tilakaratna, Research Fellow, IPS, participated in the technical workshop on ‘Updating and Improving the Social Protection Index’ organized by the Asian Development Bank (ADB), held in Manila, Philippines during 3-4 April 2014. A half day seminar was organized to pay tribute to late Dr. Gamani Corea by the Gamani Corea Foundation (GCF), IPS and the Marga Institute. 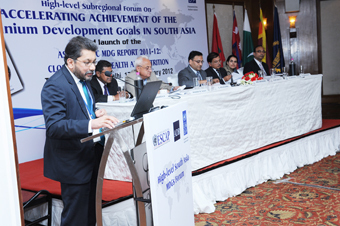 Executive Director, IPS, Dr. Saman Kelegama made a presentation on ‘The South Asian Experience with South-South Cooperation: The Case of Sri Lanka’ and was a Discussant to the Session on “The Framework for South-South Cooperation, Modalities, and Experience” at the Southern Voices on Post-MDG International Development Goals dialogue on “Deconstructing South-South Cooperation: A South Asia Perspective”. 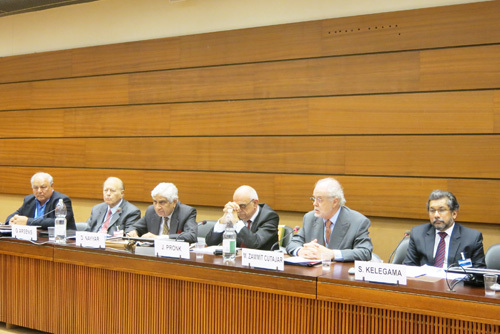 Executive Director, IPS, Dr. Saman Kelegama, spoke on Gamani Corea’s Contribution to Commodity Price Stabilization at the Special Tribute Seminar in Honour of Dr. Gamani Corea organized by the South Centre in Geneva on 20th March 2014. IPS recently launched the ‘Meeting the Development Challenges of Migration (MED_MIG) Project’, which aims to facilitate and conduct and timely research to fill knowledge gaps in developing effective policies to maximize development benefits of migration. The project is funded by the End of Phase 1 Opportunity Fund of the Think Tank Initiative (TTI). Sri Lanka’s innovation landscape is rapidly evolving with many new technology-based firms starting up in the last few years. 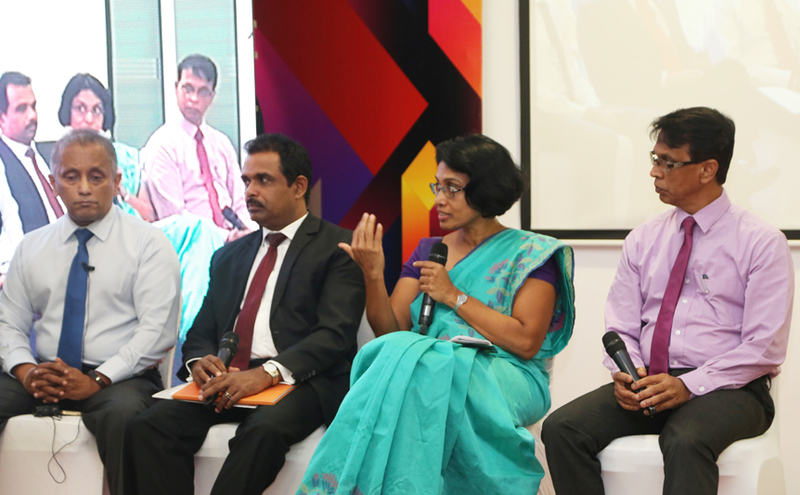 IPS Research Economist Anushka Wijesinha was a panelist at a recent event which was the first of its kind to explore the emergence of “tech entrepreneurship” in Sri Lanka, the lessons learned from ongoing initiatives, and what more is needed to grow the sector. 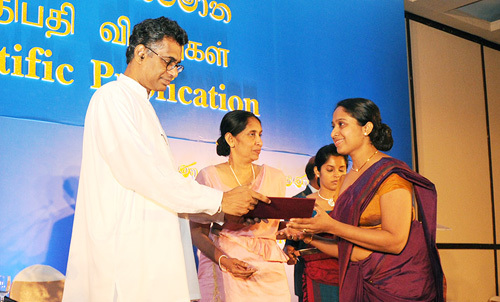 Kanchana Wickramasinghe, Research Officer, IPS won the Presidential Award for Scientific Publications at the ‘President’s Awards for Scientific Publication 2007, 2008, 2009’, organized by the National Research Council of Sri Lanka. Dr. Saman Kelegama, Executive Director, IPS was the Key Note Speaker at the ‘Invest in East’ Forum, organized by Ministry of Agriculture, Animal Production and Development, Rural Industries Development, and Fisheries of the Eastern Province, in collaboration with the Ministry of Economic Development and Ministry of Investment Promotion at the Hotel Taj Samudra, Colombo, on 17th January 2014. Chatura Rodrigo, Research Economist, IPS was a member at the panel discussion on ‘Mainstreaming Youth in the Post 2015 Development Agenda with Special Focus on the World Conference on Youth (WCY) 2014’ organized by the Ministry of Youth Affairs and Skills Development, National Youth Services Council, held at the BMICH on 4th January 2014. IPS 2nd Retreat - ’Growing Together’ - A full day interactive programme with activities/games focussing on the importance of team work and personal leadership to achieve our ‘Vision’, ‘Mission’ and ‘Strategic Objectives’ for the next five years took place on Friday, 20th December at Hotel Club Dolphin. The Regional Consultation on the ‘Sri Lanka National Human Development Report –Bridging Regional Disparities for Human Development’ took place on 3rd December, 2013 at the District Secretary/ Government Agent’s Auditorium, Batticaloa, amidst elected and Government Officials from across the Eastern Province, together with NGO partners and UN representatives. The Conference & Launch of the Asia Pacific Trade and Investment Report (APTIR) for 2013 themed, ‘Turning the Tide: Towards Inclusive Trade and Investment’ was held at the IPS Auditorium on November 26, 2013. 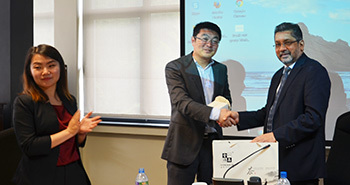 The conference was organized by IPS together with the Asia-Pacific Research and Training Network on Trade (ARTNeT). IPS Research Economist Anushka Wijesinha participated in a workshop on ‘Frontiers in Development Policy: Innovative Development Case Studies’ organized by the World Bank Institute and KDI School of Public Policy and Management, held at the Shilla Hotel, Seoul, 21-22 November 2013. 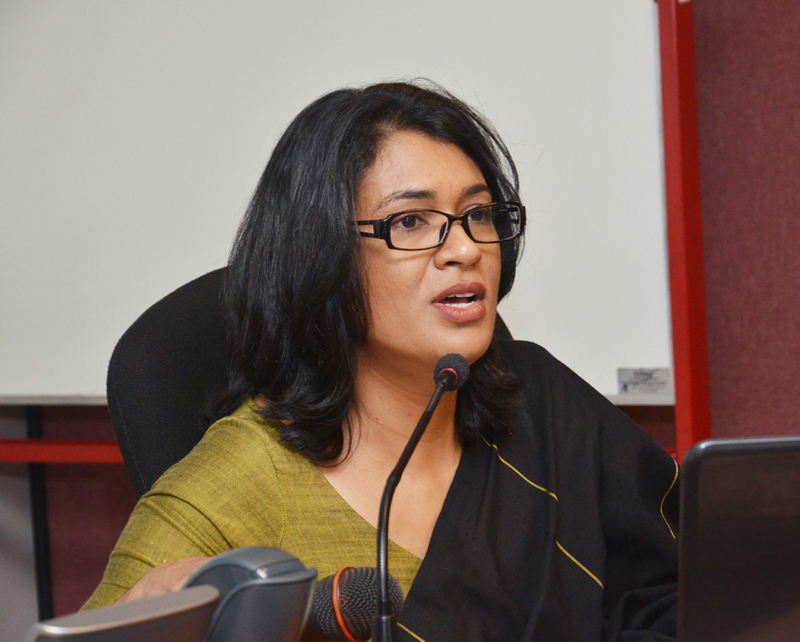 IPS Research Economist Anushka Wijesinha delivered a Special Lecture on ‘Post-war Growth and Tackling the Middle-income Transition: New Miracle in the Indian Ocean?’ at the KDI School of Public Policy and Management, Seoul, South Korea, on 14th November 2013. 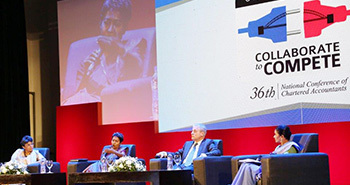 The Commonwealth Business Forum (CBF) commenced on 12th November 2013 at Cinnamon Grand, Colombo in conjunction with the Commonwealth Heads of Government Meeting (CHOGM). 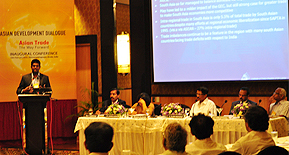 Dr. Saman Kelegama, Executive Director, IPS, Chaired a session on ‘Sri Lanka: Trading Hub for the Indian Ocean and SAARC’. 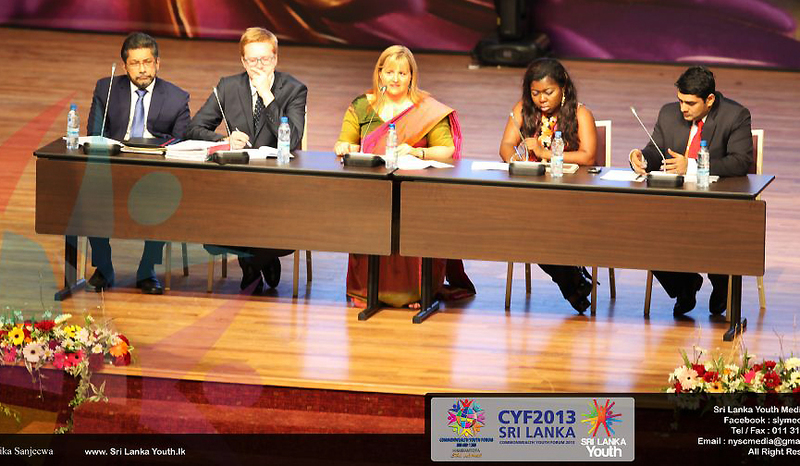 IPS Executive Director made a presentation on “Millennium Development Goals (MDGs) and Young People in Sri Lanka” at the Commonwealth Youth Forum 2013 held at the International Convention Centre at Hambantota on 10th November 2013. 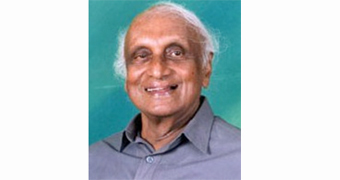 Dr. Gamani Corea, former Chairman of the IPS (1989 – 2006) passed away on 2nd November, 2013. 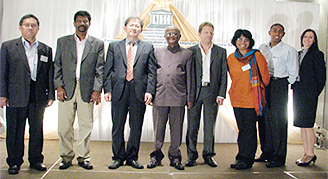 Dr. Corea was the founder Chairman of the Institute and played a key role in steering the IPS in its formative years. 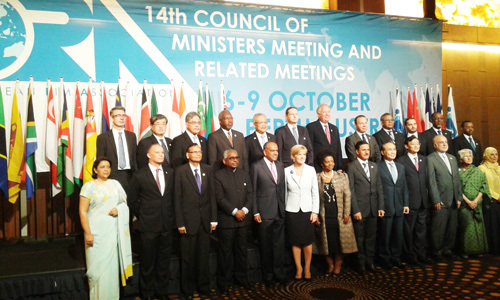 Dr. Saman Kelegama, Executive Director of the IPS represented Sri Lanka as the spokesman for the Indian Ocean Region Academic Group (IORAG), at the 13th Council of Ministers Meeting held in Perth, Australia during 29th October to 1st November 2013. 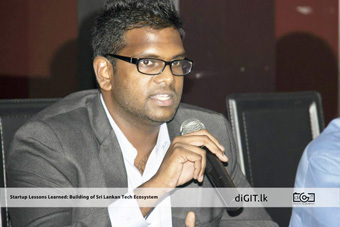 Chatura Rodrigo, Research Economist, IPS, was a Speaker at the ‘Technology Justice – Session Guide’ organized by Practical Action on 25th October at Mihilaka Medura, BMICH, Colombo. 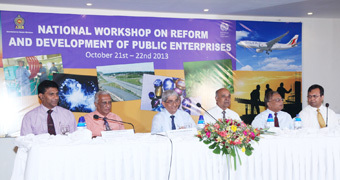 The National Workshop on Reform and Development of Public Enterprises was held at the Grand Monarch, Talawatugoda during 21-22 October 2013. Chairman, IPS, Prof. W.D. 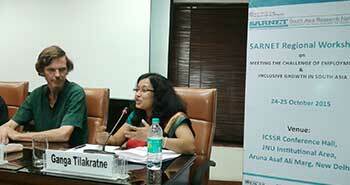 Lakshman and Executive Director, IPS, Dr. Saman Kelegama, chaired two sessions. 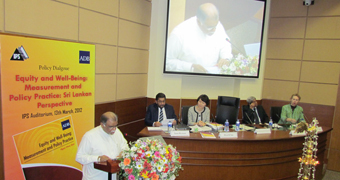 IPS Annual National Conference on the theme “Sri Lanka’s Transition to a Middle Income Economy”, took place at the IPS Auditorium on 15th October 2013. 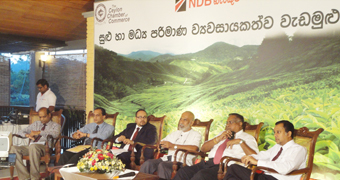 Chatura Rodrigo, Research Economist, IPS participated at the “Interactive Session and Workshop on Small and Medium Scale Entrepreneurs in the Tea Sector”, organized by the National Development Bank in partnership with Ceylon Chamber of Commerce, on 4th October 2013. 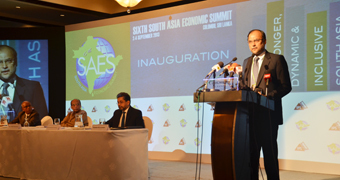 The 6th South Asia Economic Summit (SAES), organized by the IPS took place during 2nd – 4th September at the Cinnamon Grand Hotel, 2013. 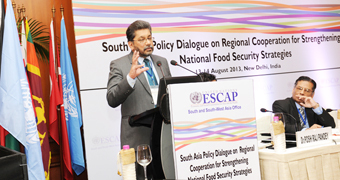 Executive Director, Dr. Saman Kelegama, was a member of the High Level Panel on Regional Cooperation for Food Security in South Asia and made a presentation on ‘National Food Security Strategies and Pathways to Increased Regional Cooperation’ at the ‘South Asia Policy Dialogue on Regional Cooperation for Strengthening National Food Security Strategies’, organized by the ESCAP Sub Regional Office, South & South West Asia, New Delhi, India, during 13- 14 August, 2013. A Trust Fund was set up to manage the IPS Endowment Fund and the Trust Deed was signed on 6 August at the IPS Board Room. The Trustees will manage the IPS Endowment Fund here-in-after. The Trustees, viz., Dr. Wickrema Weerassoria, Mr. Moksevi Prelis, Dr. Lloyd Fernando, Prof. W. D. Lakshman (Ex-Officio) and Dr. Saman Kelegama (Ex-Officio) were present at this occasion. 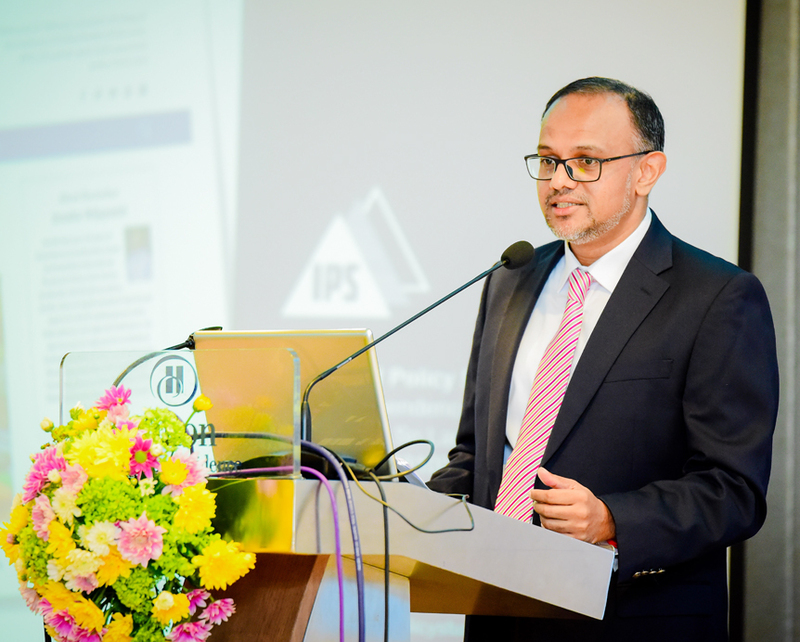 IPS Research Economist Anushka Wijesinha was the Key Note Speaker at the 10th AGM of the Sri Lanka Ceramics and Glass Council where he spoke on the topic ‘Clarity or Confusion? 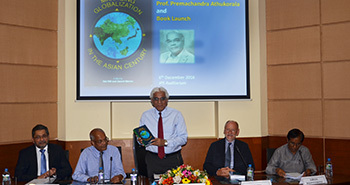 : The Global Economy and Sri Lanka’. 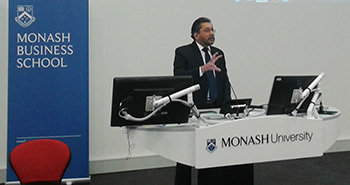 Minister for Technology and Research, Hon. 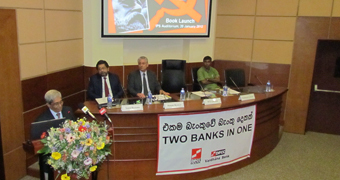 Patali Champika Ranawaka was the Chief Guest at this event. 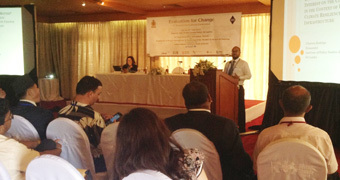 IPS Research Economist Chatura Rodrigo made a presentation on ‘Evaluation of Public Interest’ at the 4th Biennial International Conference on ‘Evaluation for Change', Mount Lavinia Hotel, during 24 – 27th July, 2013. 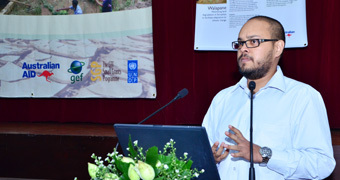 IPS Research Economist Chatura Rodrigo presented a paper on ‘Fighting Climate Change through Community Based Adaptation (CBA): Assessment of the Factors that Determine the People’s Willingness to Take Part in CBA in Agriculture Sector’ at the symposium on ‘Coping with Climate Change: Sharing Experiences and Challenges from Rural Sri Lanka’ organized by the Global Environmental Facility’s Small Grants Programme (GEF/SGP) of UNDP on July 16 and 17 at the Sri Lanka Foundation Institute. Hon. 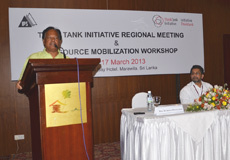 Mahinda Amaraweera, Minister for Disaster Management was the Chief Guest at the event. 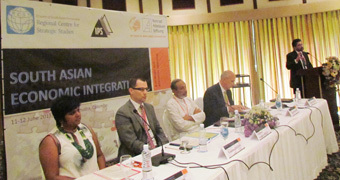 Several members of the IPS research staff participated at the Sri Lanka Economic Summit 2013, which took place at the Cinnamon Grand Hotel during 09 – 11 July. 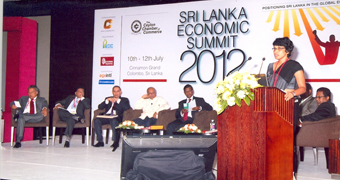 The theme of this year’s summit was ‘Re-balancing the Economy’. The 9th Ministerial Conference of the WTO (MC9) is due to be held in Bali, Indonesia from the 2nd - 3rd December this year. Going forward from the 8th Ministerial conference held in 2011, there are high expectations from MC9 to deliver on the Doha Development Agenda through multilateral trade reform. 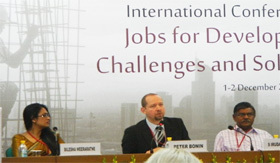 The IPS organized a session on ‘Social Protection for Inclusive Growth: Issues and Challenges’ at the 14th Annual Global Development Conference on ‘Inequality, Social Protection and Inclusive Growth’ organized by the Global Development Network (GDN) in partnership with the Asian Development Bank, the East Asian Development Network and the Philippine Institute for Development Studies, held at the Asian Development Bank headquarters in Manila, Philippines from 19-21 June 2013.
International Conference on ‘Mainstreaming Migration to the Development Agenda: The South Asian Experience’ was organized by IPS together with FES (Friedrich Ebert Stiftung), during 13-14 June, 2013. 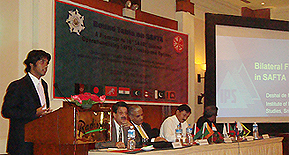 Regional Centre for Strategic Studies in partnership with the IPS and the Konrad Adenauer Stiftung organized a regional conference on "South Asian Economic Integration- A Strategic and Economic Appraisal", at the Taj Samudra Hotel during 11-12th June 2013. The workshop on ‘South Asia Research Network on Employment for Inclusive Growth’ jointly organized by the Institute for Human Development (IHD), UN-ESCAP, International Labor Organization (ILO) and the International Development Research Center (IDRC) was held at the India International Center, New Delhi on 21-22 May 2013. 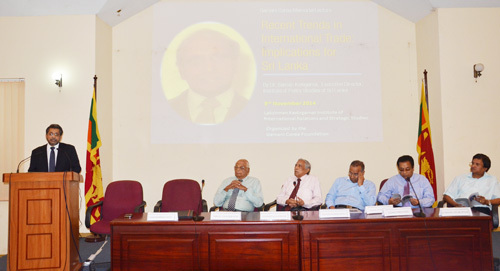 In an event jointly organized by the Indian High Commission and the IPS on the 15th of May, the ‘Handbook on the India-Sri Lanka Free Trade Agreement’, was launched in an effort to increase awareness of, and reduce misconceptions regarding the Free Trade Agreement signed between the two countries in 1998 (and came in to force in 2000). Echelon – A monthly magazine which covers in depth, Sri Lanka’s most successful businesses examines their winning strategies and profiles their leaders in immersive stories. In its ‘40 UNDER 40’ Feature, Echelon highlights young innovators, disruptors, thought leaders and builders of businesses who touched the lives of people all over the world by creating jobs, influencing actions and developing new ways of doing things. 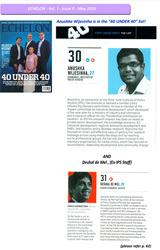 IPS staff member, Research Economist, Anushka Wijesinha has been selected as one among the forty. Despite being a middle income country, and having exemplary social development levels when compared to its regional peers, Sri Lanka has one of the lowest rates of female participation in the workforce in the world. In a recently concluded study by the World Bank, this fact was further explored and recommendations were made based on the findings of the study. 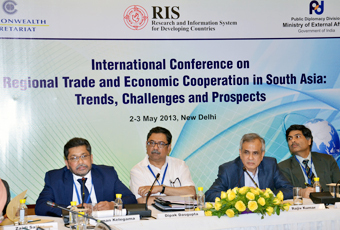 International Conference on Regional Trade and Economic Cooperation in South Asia: Trends, Challenges, and Prospects was organized by the RIS, India; Commonwealth Secretariat, UK; and Public Diplomacy Division, Ministry of External Affairs, Government of India, and was held at the India Habitat Centre, Delhi, India, during 2-3 May 2013. 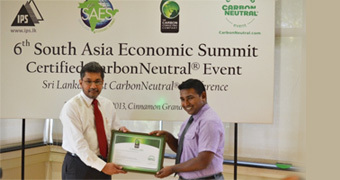 IPS obtained global CarbonNeutral® certification for the 6th South Asia Economic Summit that it is hosting in September this year. 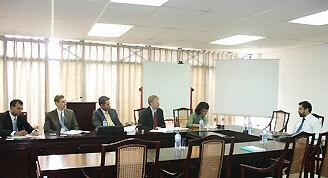 The press briefing in this regard took place on 30th April 2013, at the IPS Executive Lounge. 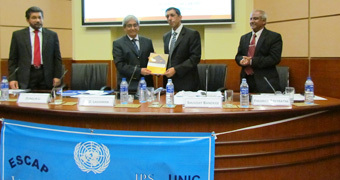 The United Nations Economic and Social Commission for Asia and the Pacific (UN-ESCAP) organized several global launches for the Survey Report on the 18th of April 2013, with the Sri Lankan launch taking place in partnership with the IPS and the United Nations Information Centre (UNIC). 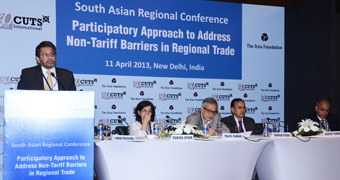 The South Asian Regional Conference on ‘Participatory Approach to Address Non-Tariff Barriers in Regional Trade’, took place during 11- 12th April in New Delhi India. 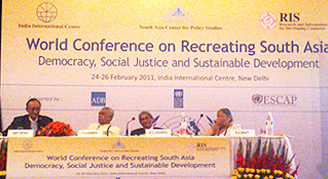 The conference was organized by CUTS, Jaipur in collaboration with Asia Foundation in New Delhi, India. 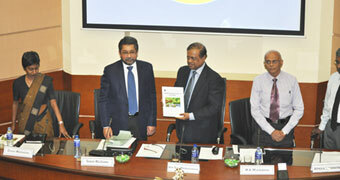 IPS was the Sri Lankan partner for both the Phase I and Phase II of the COECOSA Project. 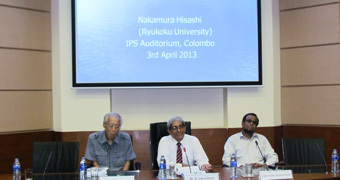 A lecture on ‘New Directions for Sri Lankan Foreign Employment’, by Prof. Hisashi Nakamura, Professor of Economics, Ryukoku University, Japan, took place at the IPS Auditorium on 3rd April 2013. 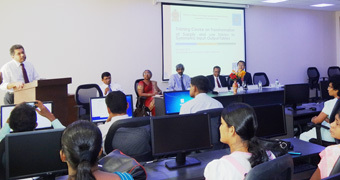 Executive Director, IPS, addressed the inaugural session of the Training Programme on Transformation of Supply and Use Table to Symmetric Input-Output Tables at the Miloda Institute on 3rd April 2012. 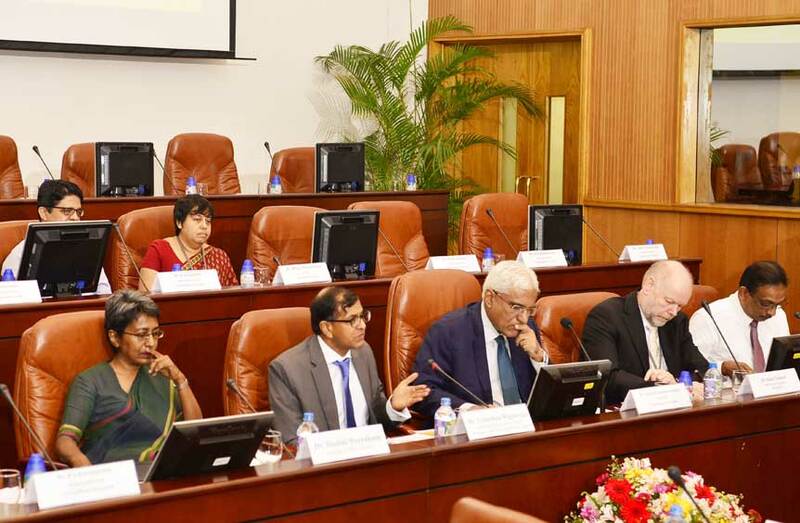 The Director Generals of the Department of Census and Statistics (DCS) and the Department of National Planning (DNP) and the Chief Economist of the ADB in Sri Lanka also addressed the gathering. 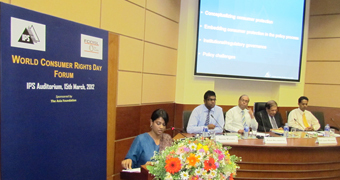 The World Consumer Rights Day Forum took place on the 15th March at the IPS Auditorium. 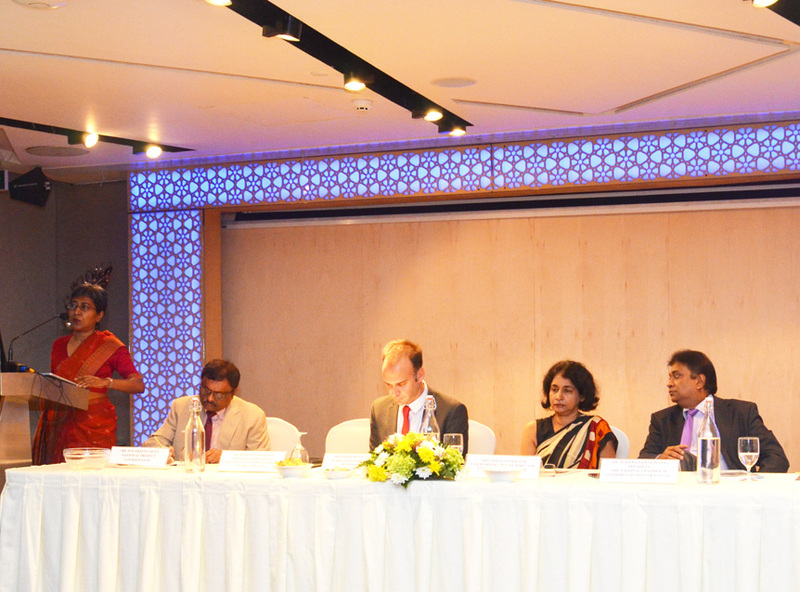 The Forum was jointly organized by the IPS and Federation of Chamber of Commerce & Industry of Sri Lanka (FCCISL) and was sponsored by “Socio-Economic Development for Conflict Affected Communities of North and East Sri Lanka” Project funded by EU and Implemented by Oxfam GB. 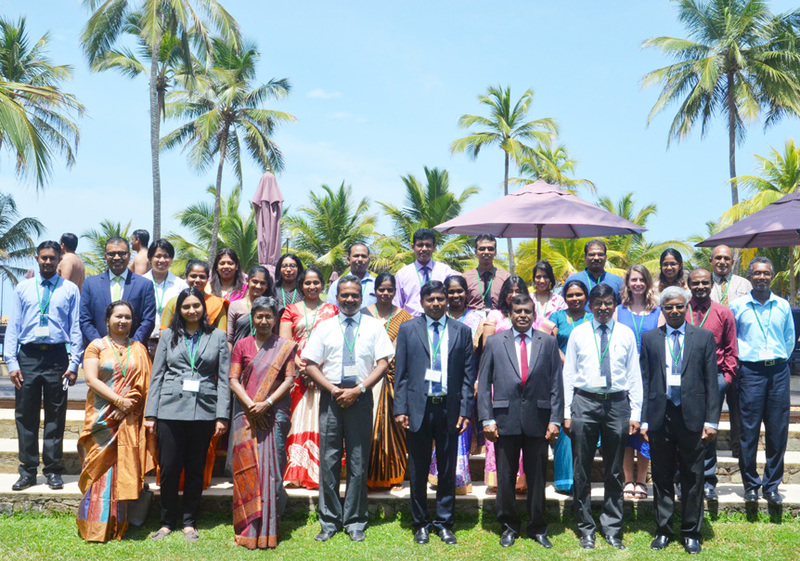 The IPS -- a Think Tank Initiative (TTI) grantee of the International Development Research Centre (IDRC), Canada hosted the 3rd TTI Regional Meeting and Resource Mobilization Workshop, from 13th to 17th March 2013 at the Club Palm Bay, Marawila, Sri Lanka. Representatives from the 16 TTI grantee institutions in South Asia, donor agencies, and IDRC officials were in attendance. 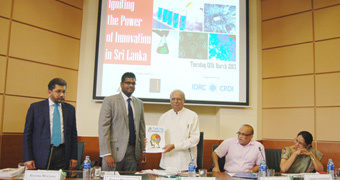 A seminar and panel discussion on ‘Igniting the power of innovation in Sri Lanka’ was organized by the IPS in collaboration with the National Science Foundation (NSF) on the 12th March 2013. 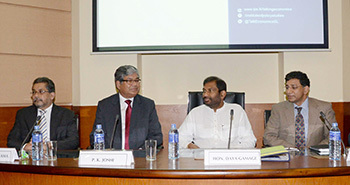 IPS together with the Ministry of Foreign Employment Promotion and Welfare launched the Report ‘Migration Profile: Sri Lanka’ on 7th March 2013, at the IPS Auditorium, under the patronage of Hon. 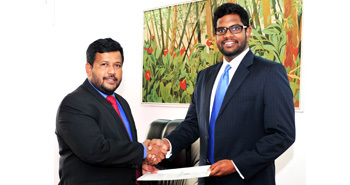 Dilan Perera, Minister of Foreign Employment Promotion and Welfare. 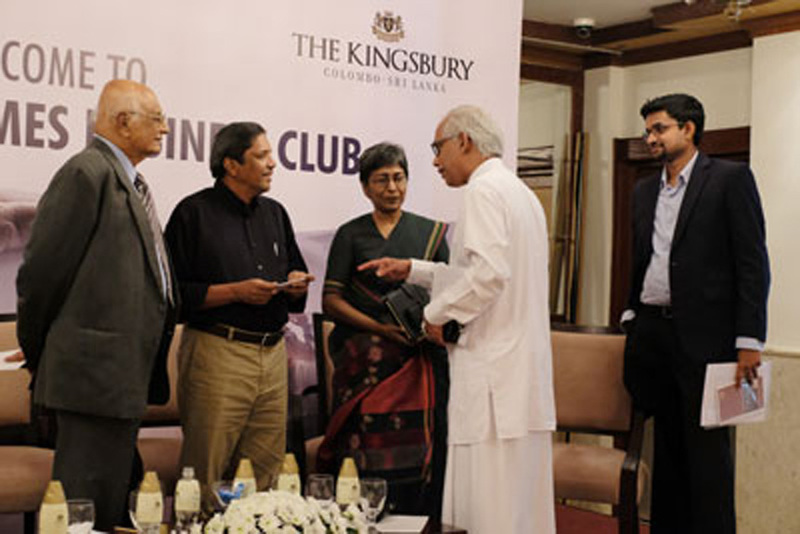 Launch of the IPS latest publication ‘Climate Change Issues in Sri Lanka’, took place at the IPS Auditorium, on 14th February, 2013. An Expert Group Meeting was held to discuss post-MDG agenda and identify a set of activities to be undertaken by the Southern Voice of Post-MDG in 2013 and 2014. 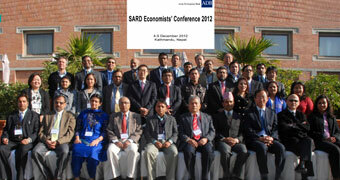 The ADB South Asia Research Department (SARD) Economists’ Conference took place in Kathmandu, Nepal, during 4-5 December 2012. 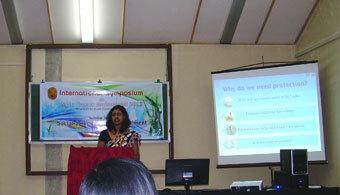 Dilani Hirimuthugodage, Research Officer, IPS, made a presentation on “The TRIPs Agreement in Protecting New Plant Varieties and Farmers’ Traditional Knowledge in Sri Lanka” at the International Symposium on ‘Agriculture and Environment’ which was held at, and organized by the Faculty of Agriculture of the University of Ruhuna. 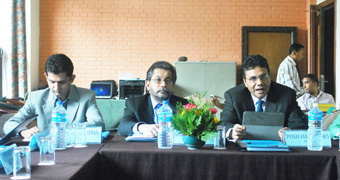 IPS together with the Partnership for Economic Policy (PEP) organized the National Policy Dialogue at the IPS Conference Room on 23rd November 2012. 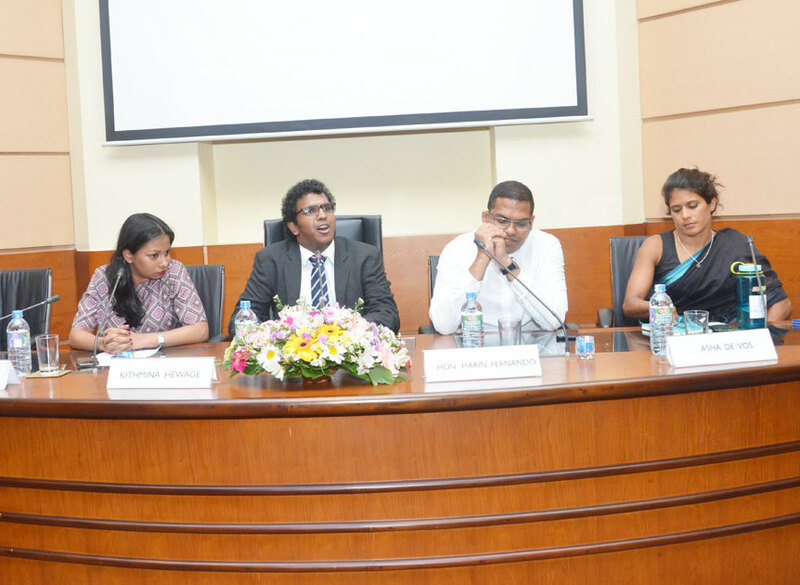 The Dialogue, was attended by top officials from the Department of Inland Revenue and the Central Bank of Sri Lanka, university academics, as well as representatives from civil society organizations like Transparency International and Plan Sri Lanka. 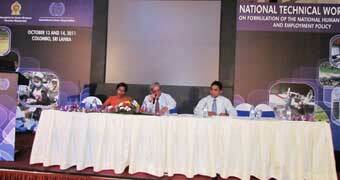 IPS Annual National Conference, “How Can Sri Lanka Stay on the Growth Expressway? 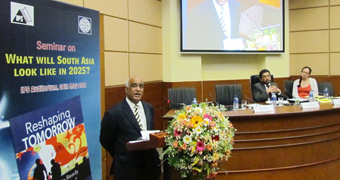 The IPS Annual National Conference on the theme “How Can Sri Lanka Stay on the Growth Expressway?”, took place at the IPS Auditorium on 7th November 2012. 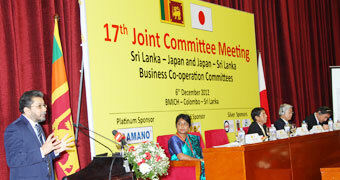 A full day conference to mark the 60th Anniversary of Japan-Sri Lanka Diplomatic Relations took place at the BMICH on 6th December 2012. The ‘Regional Cooperation for Inclusive and Sustainable Development: South and South-West Asia Development Report 2012-13’ features a foreword by Dr. Noeleen Heyzer, the UN Under-Secretary General and Executive Secretary of ESCAP, and an Executive Summary by Dr. Nagesh Kumar, Director of ESCAP South and South-West Asia Office and ESCAP’s Chief Economist. 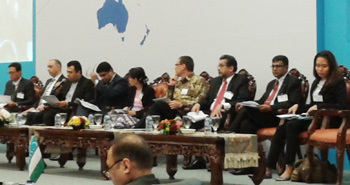 ARTNeT Conference on ‘Empirical and Policy Issues of Integration in Asia and the Pacific’, took place at the Hotel Galadari during 1 – 2 November 2012. The conference theme was competitiveness and economic diversification. GDN Regional Workshop on “Supporting Policy Research to Inform Agriculture Policy in Sub-Saharan Africa and South Asia,” took place at the Galle Face Hotel during 22nd and 23rd October 2012. 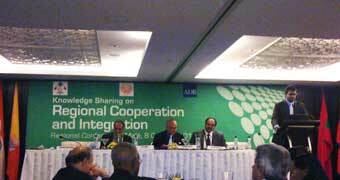 Dr. Malathy Knight, Research Fellow and Head, Industry, Public Enterprise Reform and Regulatory Policy Research was invited to make a Key Note Presentation at a Regional Conference on “Strengthening Cooperation between Members of Parliament and the Private Sector in Making Public Private Partnerships More Effective”, jointly organized by the Bangladesh Enterprise Institute (BEI) and The Asia Foundation (TAF), in Dhaka on the 20th October, 2012. 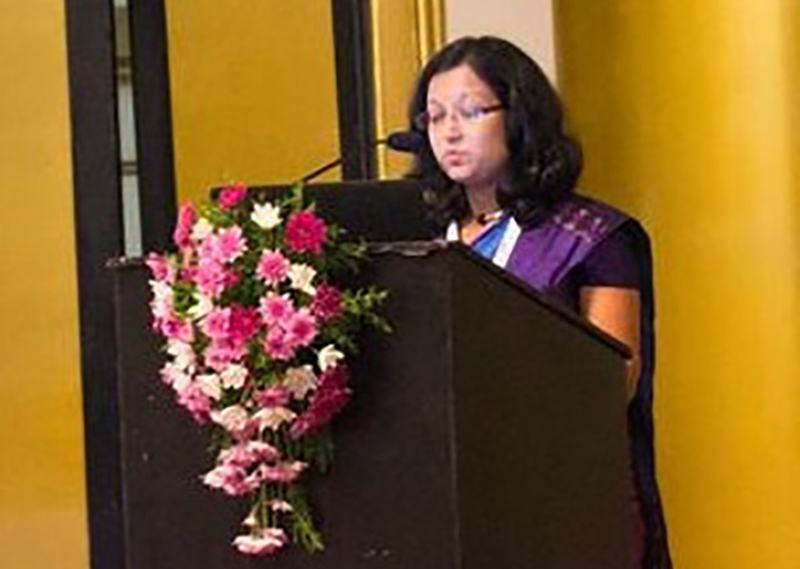 Anushka Wijesinha, Research Economist, IPS, was a speaker at the MIM-CPM International Management Conference 2012 organized by the Malaysian Institute of Management and the Institute of Certified Professional Managers, held on the 17th of October 2012 at Taj Samudra Hotel, Colombo. 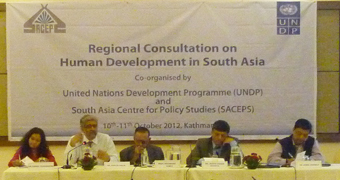 Dr. Ganga Tilakaratna, Research Fellow, IPS, served as a panelist at the Regional Consultation on Human Development in South Asia, co-organized by the United Nations Development Programme (UNDP) and the South Asia Centre for Policy Studies (SACEPS) in Kathmandu, Nepal during 10-11 October 2012. IPS Executive Director was invited as a Discussant for the IMF-World Bank Civil Society Town Hall Meeting of the IMF-World Bank 2012 Annual Meeting in Tokyo, Japan. 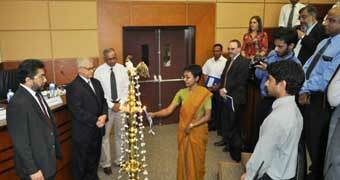 The launch of the Sri Lanka Human Development Report 2012 (UNDP) titled, “Bridging Regional Disparities for Human Development,” took place on October 5, 2012 at the IPS. Dr Ganga Tilakaratna, Research Fellow, attended the Regional Symposium on ‘Universalization of Social Security in South Asia’ jointly organized by the South Asia Centre for Policy Studies (SACEPS) and the Friedrich-Ebert-Stiftung (FES), in Kathmandu, Nepal during 3-4 October, 2012. 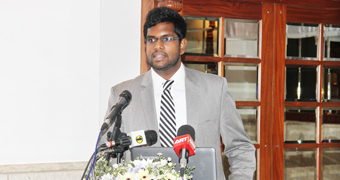 Kanchana Wickramasinghe, Research Officer, IPS served as a resource person at the Seminar titled “Tourism and Sustainable Energy” organized by the Sri Lanka Tourism Development Authority (SLTDA), to mark the World Tourism Day 2012 at Ramada Hotel, Colombo on 27th of September, 2012. 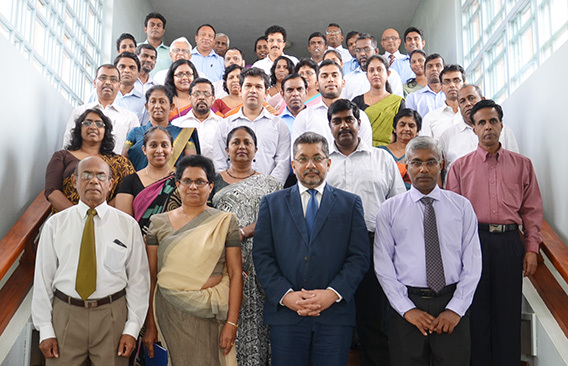 IPS successfully conducted a four day training programme on Research Methodology for the officers of the Research Division of Department of Manpower and Employment, at the Productivity Secretariat, of the Ministry of Productivity Promotion, Colombo, during 24th to 27th September, 2012. 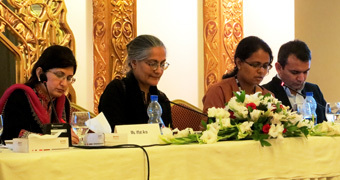 Dr. Saman Kelegama, Executive Director, IPS, Dr. Dushni Weerakoon, Deputy Director, IPS, and Anushka Wijesinha, Research Economist of IPS were resource persons at the 5th South Asia Economic Summit (SAES), held in Islamabad, Pakistan during 11 - 13 September, 2012. 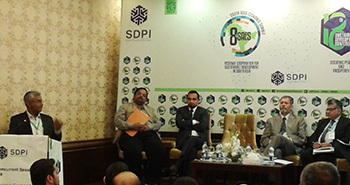 It was organized by the Sustainable Development Policy Institute, Pakistan. 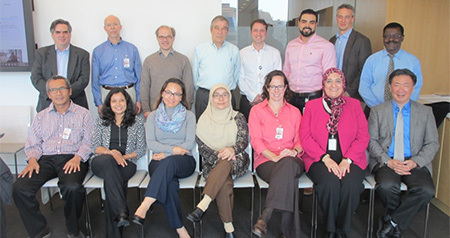 IPS, in partnership with the Global Financial Inclusion Initiative at Innovations for Poverty Action (IPA), organized a training workshop on “Experimental Design for Savings and Payments Research” from 10-13 September 2012, at the IPS Conference Room. 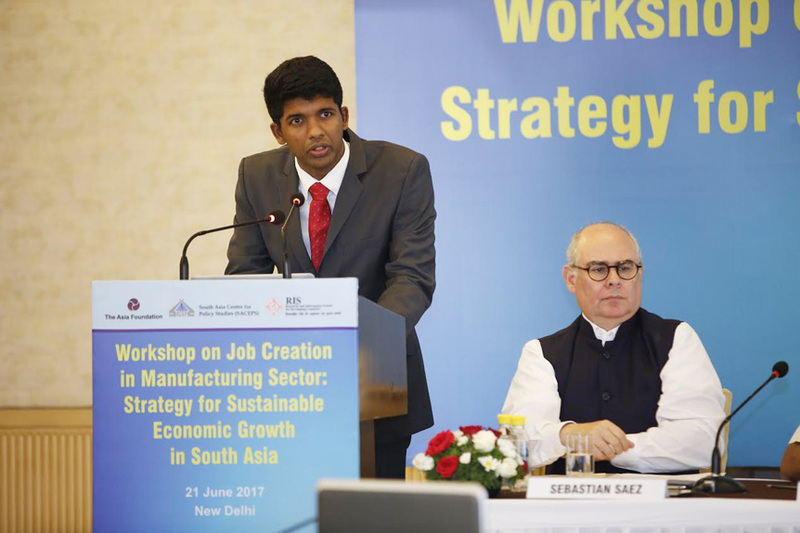 Buddhika Brahmanage, Research Assistant, IPS, won a competitive scholarship to attend the Communication Policy Research South 7 – Young Scholar Seminar Programme. IPS ‘Talking Economics’ hosted a unique networking event and ‘Expert Voices’ panel discussion on “The Jobs Challenge” on Wednesday 22nd August from 6 to 8pm in the IPS Executive Lounge. IPS organized a dissemination workshop on “Social Protection Index and Incorporation of Social Protection Module in Household Income and Expenditure Survey” with the Asian Development Bank (ADB), Manila on 3rd August, at the IPS Conference Room. 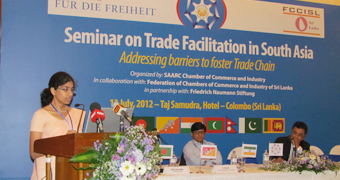 A seminar on ‘Trade Facilitation in South Asia: Addressing Barriers to Foster Trade Chain,’ organized by the SAARC Chamber of Commerce and Industry in collaboration with the Federation of Chambers of Commerce and Industry of Sri Lanka and Friedrich Naumann Stiftung, took place at the Taj Samudra Hotel, Colombo on 13th July, 2012. Hon. K. Shanmugam, Minister for Foreign Affairs and Law of Singapore who was on an official visit to Sri Lanka during 29 May-1 June 2012, visited the IPS on 1st June with a delegation of officials from the Ministry of Foreign Affairs of Singapore and business leaders. A Regional Seminar on “Emerging Issues on Trade, Climate Change and Food Security: Way forward for South Asia” organized by IPS, South Asia Watch on Trade, Economics, and Environment (SAWTEE) and Oxfam Novib took place on 31 May – 1 June 2012 at the IPS Auditorium. A Seminar on ‘What will South Asia look like in 2025?’ was organized by IPS and The World Bank and took place at the IPS Auditorium on the 24th of May, 2012. The seminar was based on the book: ‘Reshaping Tomorrow: Is South Asia Ready for the Big Leap,’ edited by Ejaz Ghani, Economic Advisor to South Asia PREM, World Bank. The latest United Nations Economic and Social Commission for Asia and the Pacific (UNESCAP) report:‘Economic and Social Survey of Asia and the Pacific 2012: Pursuing Shared Prosperity in an Era of Turbulence and High Commodity Prices’ was launched on 10th May, 2012, at the IPS Auditorium. 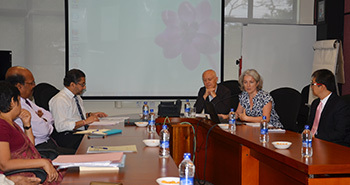 A delegation from the Institute of South Asian Studies (ISAS) of the National University Singapore, visited the IPS on 25th April 2012. 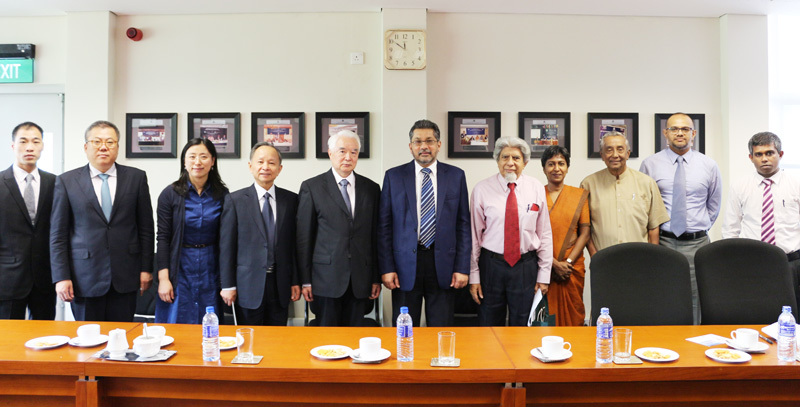 The delegation headed by the ISAS Chairman, Ambassador Gopinath Pillai, included Professor Tan Tai Yong, Director of ISAS, Dr. Razeen Sally and Ms. Gloria Spittal of the ISAS. Executive Director, met with Daniyal Aziz, Advisor, and Usama Ahmed, Manager/Research, Governance Institutes Network International (GINI), Pakistan, at IPS, 24th April 2012. 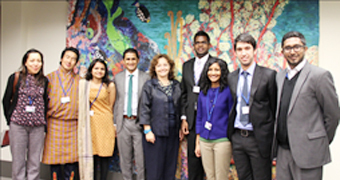 Anushka Wijesinha, Research Economist – IPS, attended the World Bank-IMF Spring Meetings in Washington, D.C. (16-22 April, 2012) representing Sri Lanka, and part of a 8 member South Asian youth delegation. 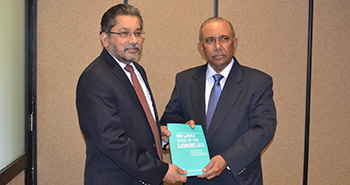 The IPS and the Department of Economics and Statistics of the University of Peradeniya launched two Volumes on “Economic and Social Development under a Market Economy Regime” edited by Saman Kelegama, Executive Director of the IPS and Dileni Gunawardena, Senior Lecturer of the University of Peradeniya. 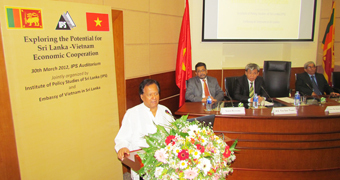 IPS together with the Embassy of Vietnam organized a seminar on ’Exploring the Potential for Sri Lanka-Vietnam Economic Cooperation’ on 30th March 2012, at the IPS Auditorium. 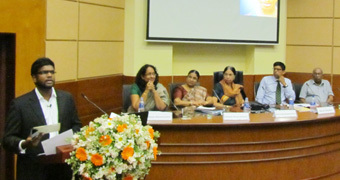 IPS held a workshop and interactive dialogue -“IPS University Forum” – with over fifty undergraduates and lecturers from Universities across the country, during 21 – 23 March 2012, at the IPS Auditorium. 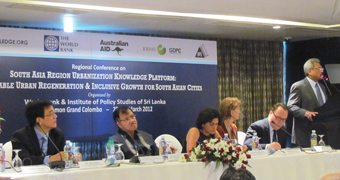 IPS, together with the World Bank, organized a High-Level Policy Workshop, on “South Asia Region Urbanization Knowledge Platform Launch: Sustainable Urban Regeneration and Inclusive Growth for South Asian Cities”, during March 20th- 21st, 2012 at l Cinnamon Grand Hote, Colombo. 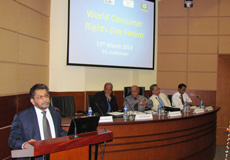 The IPS together with the Federation of Chambers of Commerce and Industry (FCCISL) organized a forum on Consumer Rights to mark the World Consumer Rights Day at the IPS Auditorium on 15th March 2012. 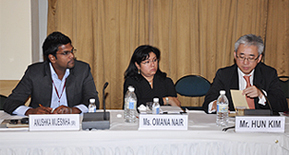 The IPS together with the Asian Development Bank (ADB) organized a Policy Dialogue on ‘Equity & Well-Being: Measurement & Policy Practice - Sri Lankan Perspective’ at the IPS Auditorium on 13th March 2012. 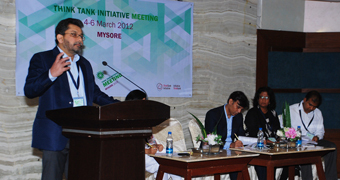 The IDRC TTI Regional Meeting of 16 South Asian grantee institutions took place at Mysore, during 4-6 March 2012. 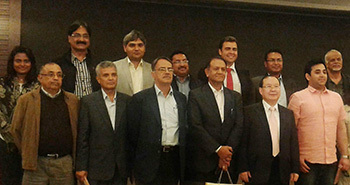 The meeting was organized by the Centre for Study of Science, Technology and Policy (CSTEP), India. 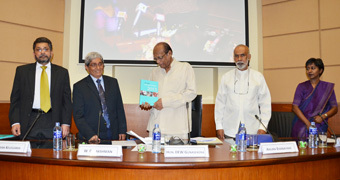 Launch of the Report and Discussion on ‘More and Better Jobs in South Asia: Sri Lankan Perspective took place on 1st March 2012 at the IPS Auditorium. 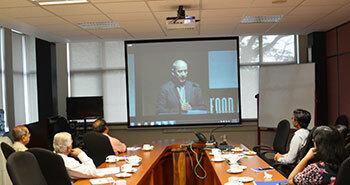 The event was jointly organized by the World Bank and IPS. The IPS, together with the World Bank, hosted a brainstorming session on the next edition of the World Bank’s South Asia Development Matters flagship report series on ‘Equity and Human Development in South Asia’ at the IPS Conference Room on 1st March 2012. A High-Level Sub Regional Forum on ‘Accelerating Achievement of the Millennium Development Goals (MDGs) in South Asia and the launch of the Asia-Pacific MDG Report 2011-2012: Closing the Gap in Health and Nutrition’, organized by the UN-ESCAP, ADB, and UNDP took place at the Claridges Hotel, Delhi, India, 17-18 February. 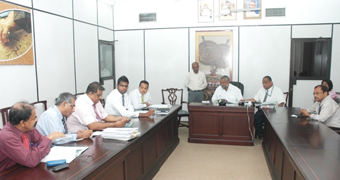 A four-member committee appointed by the Minister of Traditional Industries and Small Enterprise Development, Hon. 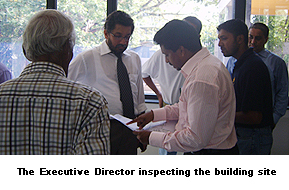 Douglas Devananda, tasked with investigating issues related to IDB Industrial Estates, submitted its Final Report and held a de-briefing at the Ministry premises on14th February 2012. 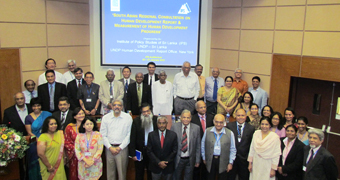 A ‘South Asian Regional Consultation on Human Development Report & Measurement of Human Development Progress’ organized by the IPS, UNDP Human Development Report Office, New York and UNDP – Sri Lanka took place at the IPS Auditorium during 30-31 January, 2012. 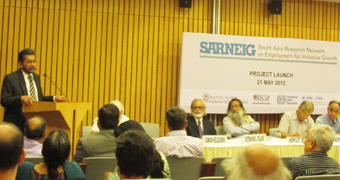 The Book Launch of ‘Marx’s Theory of Price and Its Modern Rivals’ by Howard Nicholas, Published by Palgrave, Macmillan, 2011, took place on the 20th January, 2012, at the IPS Auditorium. Ambassador of Vietnam in Sri Lanka, Ton Sinh Thanh and Counselor, Phung Trong Tuan, made a courtesy call at the IPS and met the Executive Director to discuss possible collaboration of the Vietnam Embassy with the IPS to organize a conference on Economic Relations between Vietnam and Sri Lanka. 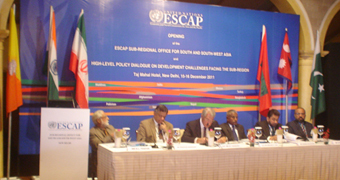 Dr. Saman Kelegama, Executive Director, IPS, made a presentation at the “High-Level Policy Dialogue on Development Challenges Facing the South and South West Asia Region” at the inaugural event of the ESCAP Sub-Regional Office for South and South West Asia in Delhi, India, 15-16 December 2011. 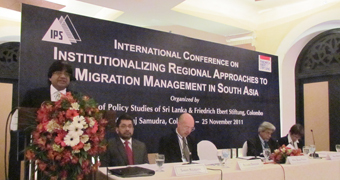 IPS, in collaboration with the Friedrich Ebert Stiftung (FES), Colombo, organized an International Conference on ‘Institutionalizing Regional Approaches to Migration Management in South Asia’, at the Taj Samudra Hotel, on 25 November, 2011. 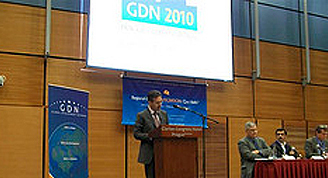 The launch of the UNDP Human Development Report 2011 titled, “Sustainability and Equity: A Better Future for All,” took place on November 22, 2011 at the IPS Auditorium in the presence of Hon. 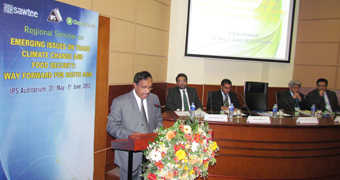 Anura Priyadarshana Yapa, Minister of Environment, who delivered the keynote address. 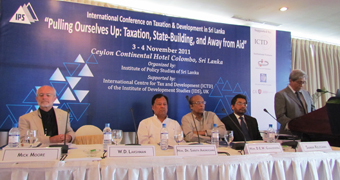 IPS together with the International Centre for Tax and Development, UK, organized an International Conference on Taxation and Development under the theme ‘Pulling Ourselves Up: Taxation, State-Building, and Away from Aid’ during the 3rd and 4th November 2011 at the Ceylon Continental Hotel. 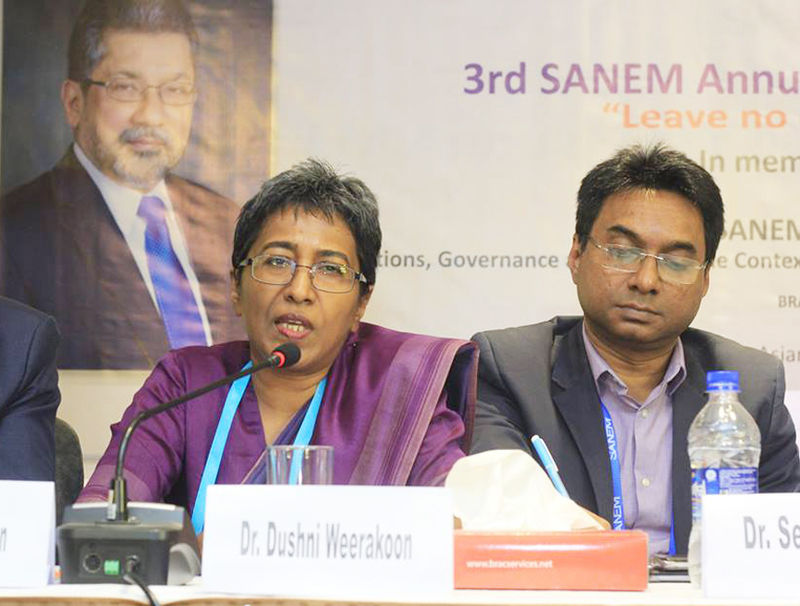 Dr. Saman Kelegama, Executive Director, IPS, Dr. Dushni Weerakoon, Deputy Director, IPS, and Anushka Wijesinha, Research Economist of IPS were resource persons at the 4th South Asia Economic Summit (SAES), held in Dhaka, Bangladesh during 22 -23 October, 2011. 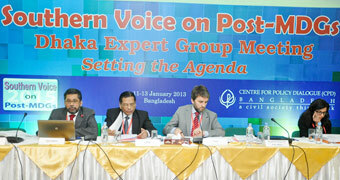 It was organized by the Centre for Policy Dialogue, Bangladesh. 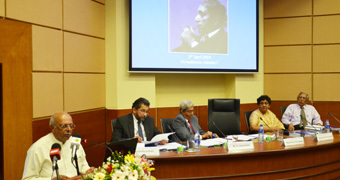 The IPS Annual National Conference on the theme “Post-conflict Sri Lanka: Towards Shared Growth”, took place at the IPS Auditorium on 19th October, 2011. 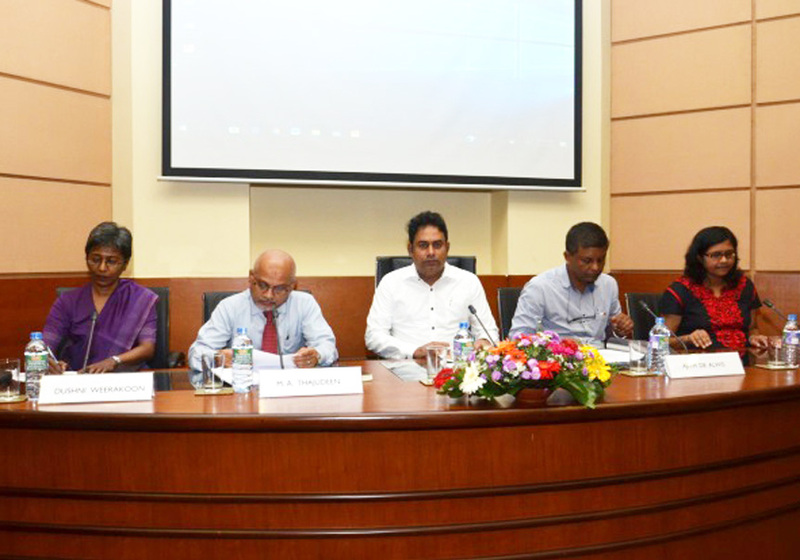 On the occasion of the International Day for the Eradication of Poverty a Policy Dialogue, was hosted jointly by the IPS, Ministry of Economic Development and the United Nations in Sri Lanka. 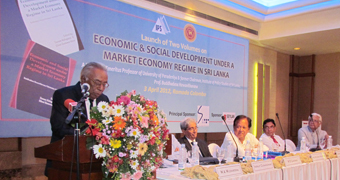 Honorable Sarath Amunugama, Senior Minister for International Monetary Cooperation, was the Chief Guest at the occasion. National Technical Workshop on the formulation of the National Human Resources and Employment Policy organized by the Secretariat for Senior Ministers and the International Labour Organization (ILO) took place at Hotel Taj Samudra, 13-14 October, 2011. Dr. Saman Kelegama, Executive Director, IPS, and Anushka Wijesinha, Research Economist, IPS were resource persons at the Regional Conference on ‘Knowledge Sharing on Regional Cooperation and Integration’, held in Malé, Maldives, during 8-9th October 2011. 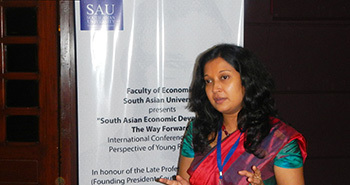 Anushka Wijesinha, Research Economist, IPS, gave a Public Lecture titled ‘Sri Lanka in a Changing Global Economic Landscape’ at the American Centre in Colombo on Thursday 22nd September 2011. 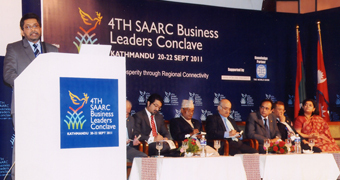 The 4th SAARC Business Leaders Conclave took place in Kathmandu, Nepal, during 20-22 September, 2011. 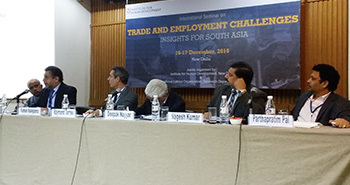 Executive Director made a presentation on ‘Trade and Investment in South Asia: Opportunities and Challenges’. 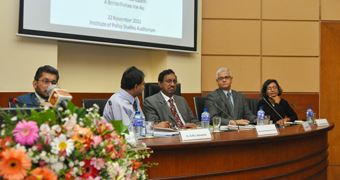 A Seminar & ‘Expert Insights’ Panel on ‘2011 and Beyond: Trade & Investment Prospects in Asia and Implications for Sri Lanka’, organized by the IPS and supported by the Asia-Pacific Research and Training Network on Trade (ARTNeT) took place at the IPS Auditorium. Chief Guest at the occasion was Hon. 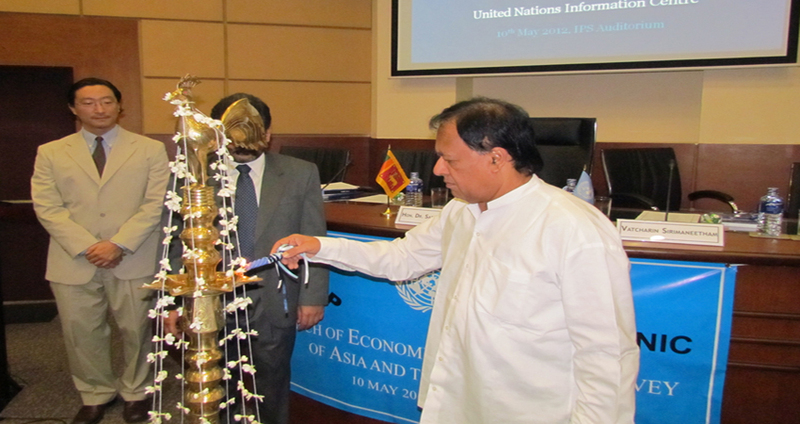 Dr. Sarath Amunugama, Senior Minister for International Monetary Cooperation, Government of Sri Lanka and Chairman, 67th Session of the Commission, United Nations Economic and Social Commission for Asia and the Pacific (ESCAP). 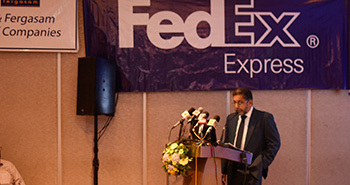 The welcome address was delivered by Dr. Saman Kelegama, Executive Director, IPS. 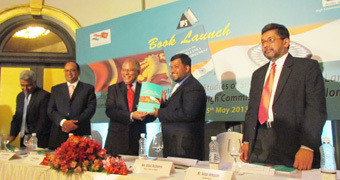 “Migration, Remittances, and Development in South Asia” published by Sage, India was launched by handing over the first copy of the book to Hon. 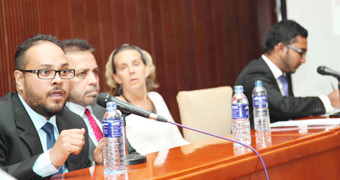 Dilan Perera, Minister of Foreign Employment Promotion and Welfare by the Executive Director of the IPS, at the Ministry on 04 August 2011. Former Foreign Minister of Singapore, Mr. George Yeo, Chairman of the Institute of South Asian Studies (ISAS), Singapore, Mr. Gopinath Pillai, together with two officials of the Ministry of Foreign Affairs, Singapore, visited the IPS on 30th July 2011. 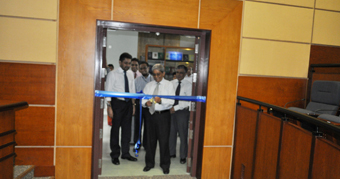 The IPS Auditorium was declared open by the Chairman, Prof. W. D. Lakshman on 13th July, 2011. Anushka Wijesinha,Research Economist, IPS, made two presentations at a Stakeholder Consultation on Strategic Partnership for Policy Development and Action to Foster Regional Cooperation in South Asia organized jointly by RIS (India) and the Pathfinder Foundation (Sri Lanka), and supported by the ADB, on Monday 11th July 2011 at the Cinnamon Grand, Colombo. Anushka Wijesinha, Research Officer, IPS, was a resource person at a Regional Symposium on ‘Improving Trade Flows in and from South Asia: Overcoming Logistics Challenges’ organized by the Bangladesh Enterprise Institute (BEI) and the Commonwealth Secretariat UK, held on 22nd June 2011, in Dhaka, Bangladesh. A Workshop to disseminate findings conducted by a team of researchers at IPS, for the study on ‘Baseline Assessment of the OXFAM EU-ACAP (European Union Assistance for Conflict Affected People) was conducted at the Conference Room, IPS, on 10th June, 2011. 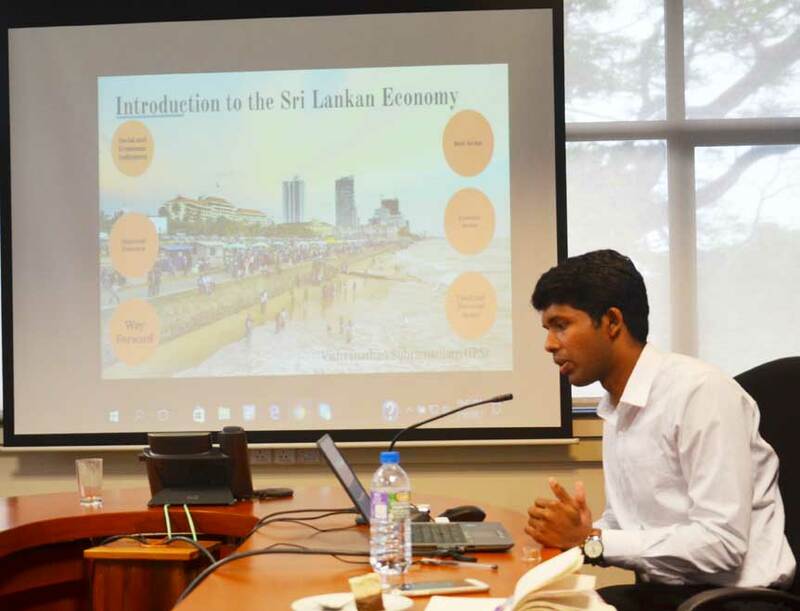 Ashani Abayasekara, Research Assistant, IPS, made a presentation on "Economic Freedom: The Role of Stakeholders in the Regulation of the Business Environment - A Sri Lankan Perspective" at a seminar on Economic Freedom and the Business Environment in South Asia. 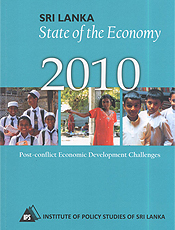 The UN Economic and Social Survey of Asia and the Pacific 2011 prepared by UN-ESCAP, was launched at the Sri Lanka Foundation Institute on 5th May 2011. 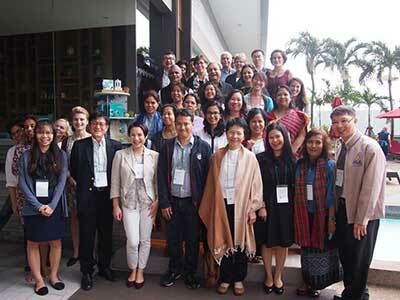 Anushka Wijesinha, Research Officer, IPS, participated in a International Seminar “Selected Outstanding Issues in Services, Trade and Development” organized jointly by ARTNet of UNESCAP, and the Asian Development Bank Institute (ADBI), in Manila, Philippines, from the 3rd to 5th May 2011. 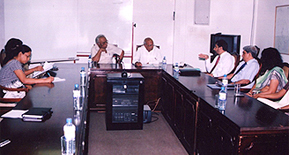 IPS organized two Consultative Meetings on ‘Promoting Agrarian Reforms in Sri Lanka’ and ‘Budgetary Policies for Poverty Eradication in Sri Lanka’ on 7th and 8th April 2011, respectively, at the Main Conference Room at IPS. Anushka Wijesinha, Research Officer, IPS, participated in the ‘SME Access to Finance’ programme organized by the Federation of Chambers of Commerce and Industry of Sri Lanka (FCCISL) and the Association of Development Financing Institutions in Asia and Pacific (ADFIAP), in collaboration with the International Chamber of Commerce at the Taj Samudra Hotel, Colombo, on 26th March 2011. 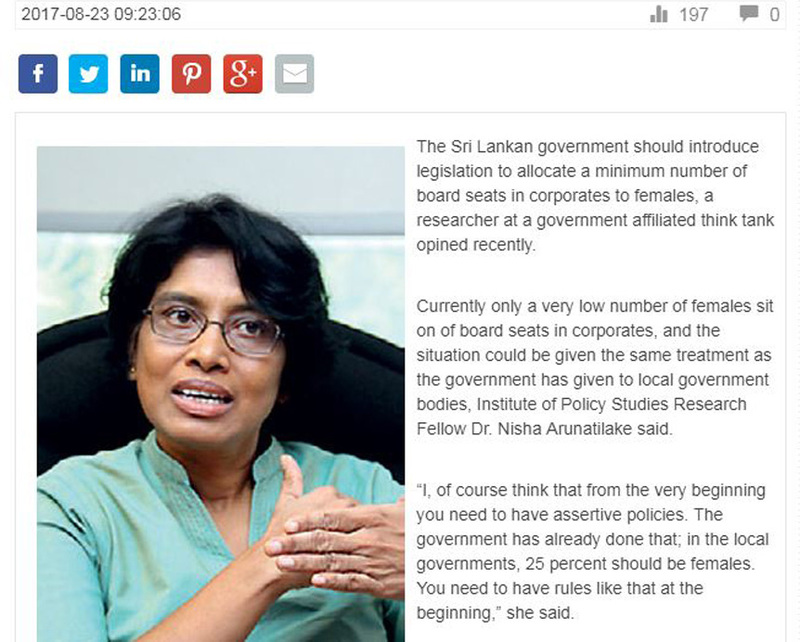 Premila Gamage, Librarian, IPS, was interviewed by Daily Mirror Women @ Work (W@W) in its edition on 8th February 2011. 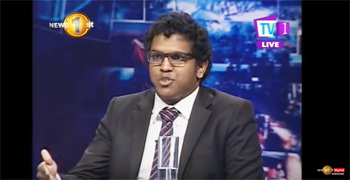 The interview highlights the unique achievements of Premila in Library management. 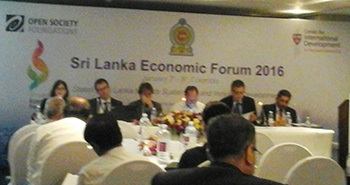 Asia Forum on Remittances and Development was held during 11 - 12 January 2011, at Hotel Taj Samudra, Colombo. It was organized by the Project Consultancy Unit of SEEDS (Gte) Ltd in collaboration with Joint Migration and Development Initiative (JMDI) under the theme of “Implications of Migration, Remittances and Remittance Based Livelihood in Developing Economies”. Dr. Saman Kelegama, Executive Director, IPS, and Anushka Wijesinha and Suwendrani Jayaratne, Research Officers of IPS were resource persons at the 3rd South Asia Economic Summit (SAES), held in Katmandu, Nepal during 17th -19th December, 2010. 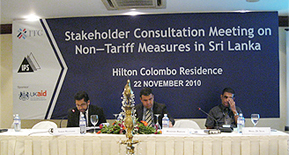 A Stakeholder Consultation Meeting on 'Non-Tariff Measures in Sri Lanka' was held on 22nd November 2010 at the Hilton Colombo Residence, Colombo. 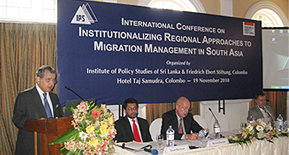 The IPS in collaboration with the Friedrich-Ebert Stiftung (FES) organized an International Conference on “Institutionalizing Regional Approaches to Migration Management in South Asia” on 19th November 2010 at the Taj Samudra Hotel, Colombo. Anushka Wijesinha, Research Officer, IPS, participated in the ‘Advanced Briefing Programme on Critical Strategic and Economic Themes for the Future’, organized by the Indian Council on Research on International Economic Relations (ICRIER), held in New Delhi, India, during from 8-20th November 2010. 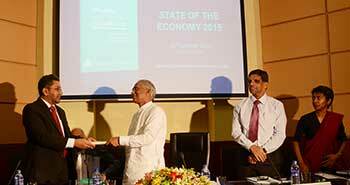 The “State of the Economy” report is the flagship annual publication of the IPS that analyses in detail Sri Lanka’s economic performance and explores emerging development challenges for the country. 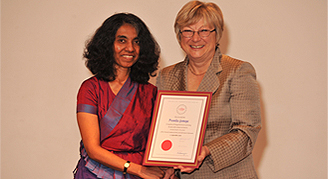 Premila Gamage, Librarian, IPS, awarded the Honorary Fellowship of Chartered Institute of Library and Information Professionals (CILIP) 2010. 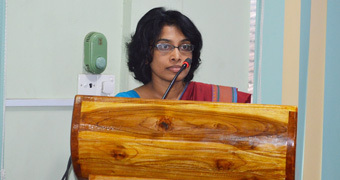 Premila Gamage, Librarian, IPS, was awarded the Honorary Fellowship of Chartered Institute of Library and Information Professionals (CILIP) 2010, for her efforts to bring library and information services to youth in remote regions of the Island and her deep commitment to fostering education. Anushka Wijesinha, Research Officer, IPS. 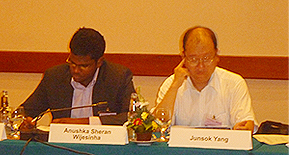 participated in a conference on 'Reforming Services for Inclusive and Sustainable Development of Asia and the Pacific' organized jointly by ARTNeT of UNESCAP and the Asian Development Bank Institute (ADBI), in Bali, Indonesia, during 11-12th October 2010. 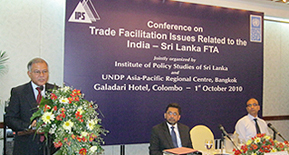 A conference on Trade Facilitation Issues Related to the India – Sri Lanka FTA was held on 1st October, 2010 at the Salon Orchid, Galadari Hotel, Colombo, and it was jointly organized by IPS and UNDP Asia Pacific Regional Centre, Bangkok. 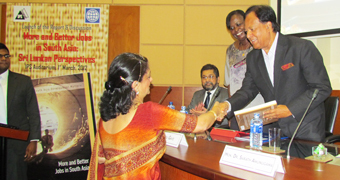 The MDG 2008/2009 Sri Lanka Country Report was launched with the participation of Deputy Minister of Finance, Hon. 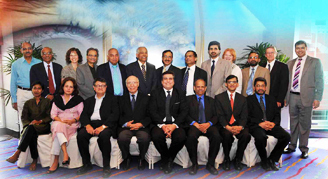 Dr Sarath Amunugama, as the Chief Guest, UNDP Resident Representative, Neil Buhne, Dr. Saman Kelegama, Executive Director, IPS, Fredric Abeyratna,UNDP – Colombo, and P. Sumanapala,Additional Director General-Department of National Planning, and many distinguished participants at the Cinnamon Grand Hotel, Colombo. 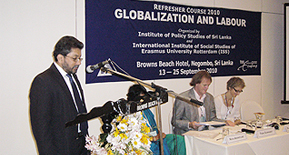 The training course was jointly organized by the Institute of Policy Studies of Sri Lanka (IPS), and the International Institute of Social Sciences of Erasmus University Rotterdam (ISS), the Hague, The Netherlands. 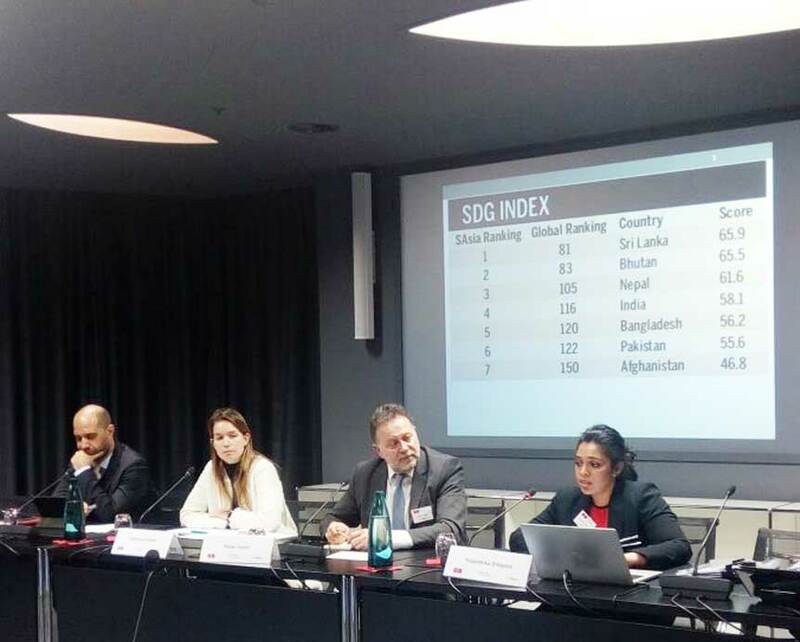 Executive Director and Deputy Director made presentations at a Workshop on South Asian Tax Systems organized by the Governance Institutes Network International (GINI) with the sponsorship of IDRC. The Workshop took place at Furama City Hotel, Singapore during 8-9 August, 2010. 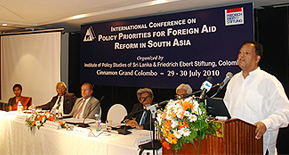 The IPS organized a conference, in collaboration with Friedrich-Ebert Stiftung (FES), on “Policy Priorities for Foreign Aid Reform in South Asia” during 29th-30th July 2010 at the Cinnamon Grand Hotel, Colombo. 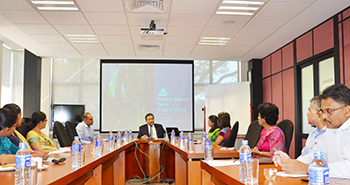 Li Shaoxian, Vice President, China Institutes of Contemporary International Relations (CICIR), Hu Shisheng, Deputy Director, Institute of South and South East Asian Studies (ISSEAS), CICIR, together with two Research Fellows of ISSEAS, CICIR, met the Executive Director of the IPS to learn about the growing economic relations between China and Sri Lanka. 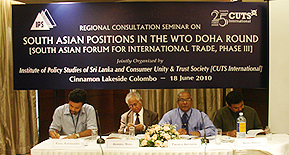 Regional Consultation Seminar on South Asian Positions in the WTO Doha Round was Jointly organized by the Institute of Policy Studies of Sri Lanka and Consumer Unity & Trust Society [CUTS International], India, at Cinnamon Lakeside Colombo, 18 June, 2010. 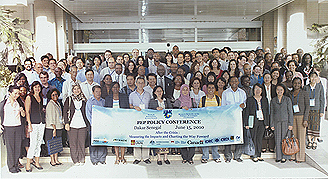 IPS was awarded a grant by the Poverty and Economic Policy Network (PEP) for a proposal on: “Will a Tax on Public Servants Improve Progressivity?” presented by Nisha Arunatilake at the 8th General Meeting of the Poverty and Economic Policy Research Network in Dakar, Senegal, during 14th to 18th June, 2010. 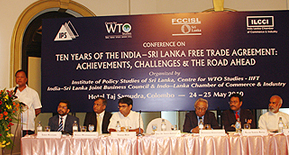 The Conference titled ‘Ten Years of the Indo-Lanka Free Trade Agreement(ILFTA)’ was organized by IPS, the Centre for WTO Studies - Indian Institute of Foreign Trade, the India-Sri Lanka Joint Business Council, and the Indo-Lanka Chamber of Commerce and Industry, and took place on the 24th and 25th of May. Hon. 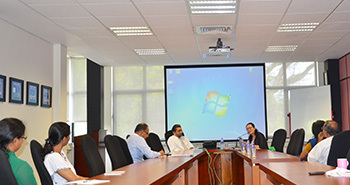 Prof.Tissa Vitarana, Minister of Technology & Research, Mrs. Dhara Wijayatilake, Secretary of the Ministry and Prof. Sirimali Fernando, Adviser to the Ministry, visited IPS on 18th May, 2010. 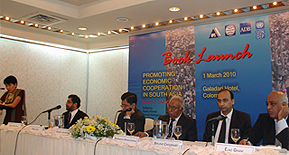 The launch of the Economic and Social Survey of Asia and the Pacific Report (ESCAP) Report took place at the Sri Lanka Foundation Institute (SLFI) on 6th May, 2010. The theme of the Report was ‘Surging Ahead in Uncertain Times’. 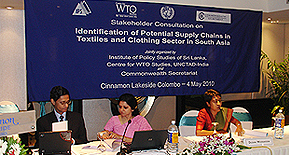 The Institute of Policy Studies of Sri Lanka (IPS) in collaboration with the UNCTAD India, the Centre for WTO Studies, India, and the Commonwealth Secretariat, UK, organised a Stakeholder Consultation on production fragmentation in the textile and clothing sector in South Asia. 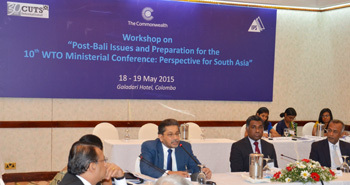 The Consultation took place at the Cinnamon Lakeside Hotel in Colombo on the 4th of May 2010. 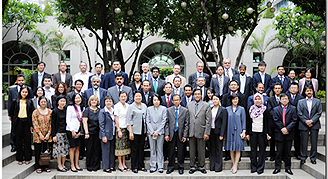 A regional workshop on ‘Equity in the Delivery of Public Services in Selected Developing Member Countries’ took place on the 26th of April, 2010 at the Asian Development Bank (ADB) headquarters in Manila, Philippines. Deshal de Mel and Suwendrani Jayaratne represented the IPS at the ‘Roundtable on SAFTA: A Precursor to 16th SAARC Summit’ organized by SAARC Chamber of Commerce & Industry and Federation of Nepalese Chamber of Commerce & Industry in collaboration with Friedrich Nauman Stiftung, during 20-21st April, 2010 in Kathmandu. 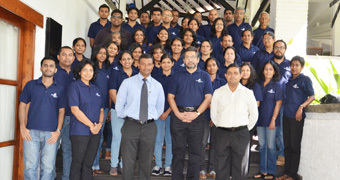 IPS entered into a contract with Millennium Information Technologies to implement a state of art IT infrastructure in its New Building Complex, currently nearing completion, at the Independence Avenue, Colombo 07, Sri Lanka. 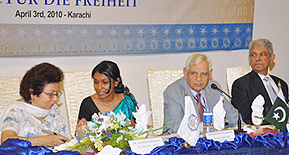 A conference on ‘Trade Facilitation in South Asia: Prospects and Challenges for Regional Integration’ organized by the SAARC Chamber of Commerce & Industry (SCCI) in collaboration with the Federation of Pakistan Chamber of Commerce & Industry (FPCCI), took place at the FPCCI, Karachi, Pakistan on 3rd April, 2010. 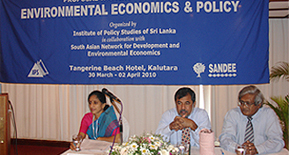 IPS in collaboration with the South Asian Network for Development and Environmental Economics (SANDEE) organized a Proposal Writing Workshop on Environmental Economics and Policy at Tangerine Beach Hotel, Kalutara, during 30 March – 02 April 2010. 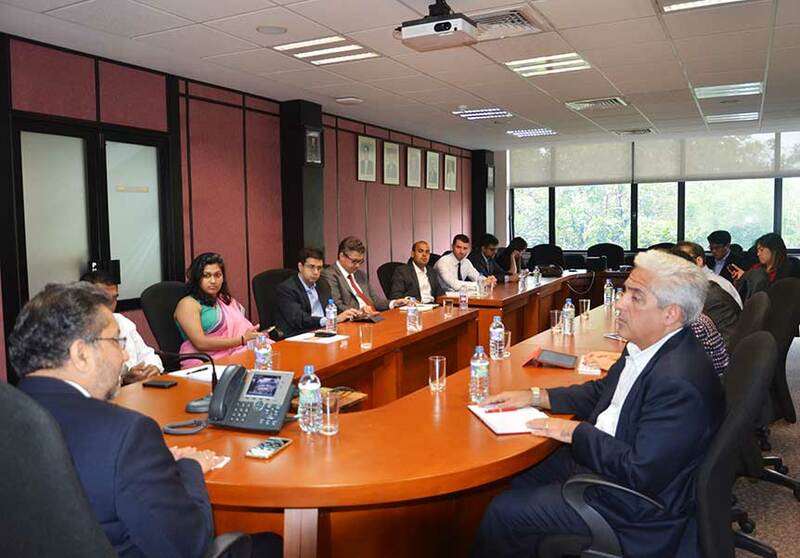 Executive Director of the IPS briefed the visiting IMF delegation to Sri Lanka on the current state of the Sri Lankan economy and the progress of the Presidential Taxation Commission work on economic incentives. Anushka Wijesinha, Research Officer, IPS made a presentation on “2010 and Beyond: Asia, South Asia and Sri Lanka” at the conference “Asian Trade: The Way Forward” organized by the Asian Development Dialogue held in association with the Department of Industries & Commerce, Government of Kerala, in Trivandrum, India on 13th February 2010. 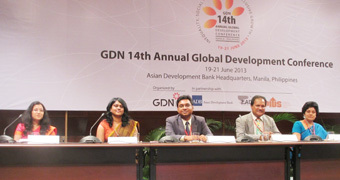 Parakrama Samaratunga, Research Fellow and Head of Agricultural Economic Policy Unit, made a presentation on “A Note on Agricultural Issues of Sri Lanka” in the parallel working sessions on “Shaping Agriculture and Trade Policies in Sub Saharan Africa & South Asia” at the 11th Annual Global Development Conference organized by Global Development Networks (GDN), 11-15 January 2010, Prague, Czech Republic.